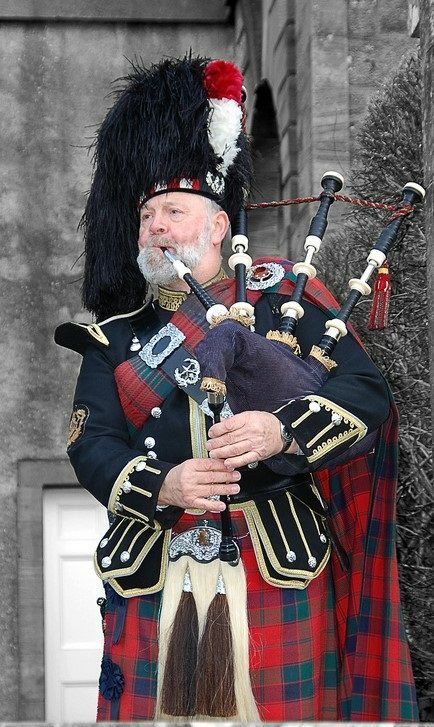 It is our great pleasure and delight to inform you that our very own Piper, Brother David Stark BEM was among one of those to receive Medallist of the Order of the British Empire in the 2018 New Years Honours List, this was received for voluntary service to Piping in South Lanarkshire. 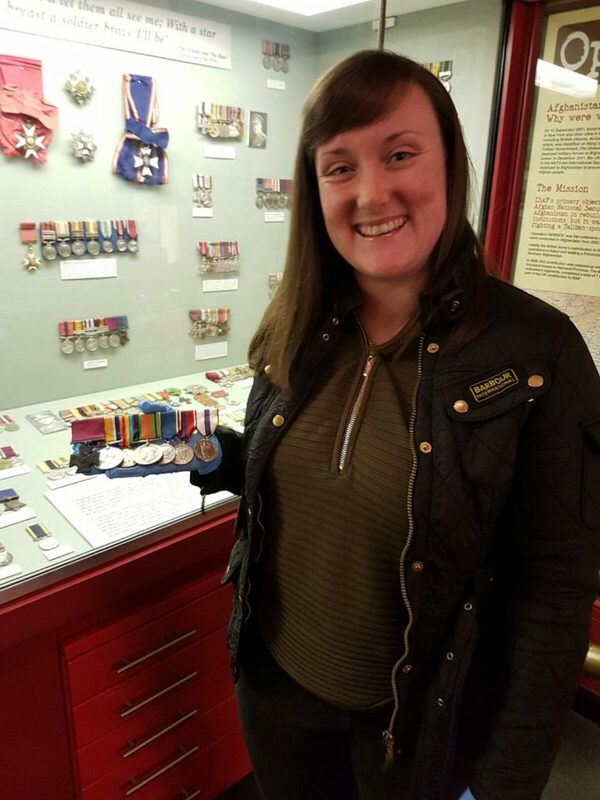 We are also further delighted to inform you that Mrs Elizabeth McPhail Stoddart BEM,has also received New Years Honours for services to the community in Lanarkshire. Beth is the wife Bro. 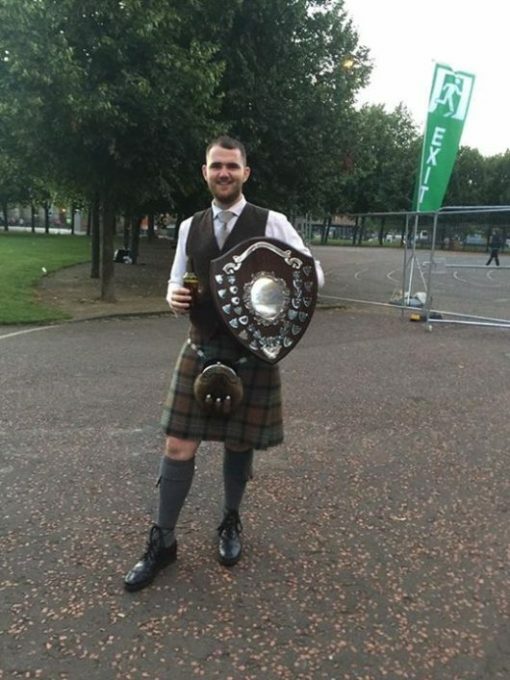 Alex Stoddart of Hamilton Kilwinning No.7 and has been long involved in cancer care for the community in Lanarkshire. The New Year Honours List recognises the achievements and service of extraordinary people across the United Kingdom. An award well worthy of two individuals who have given so much to the community. From all at The Provincial Grand Lodge of Lanarkshire Middle Ward and the Brethren of the daughter Lodges, we congratulate you both on such a great achievement. What a great end to a fantastic year in the Middle Ward of Lanarkshire and Freemasonry in general. Bro. Norman Carnegy SPGM headed a deputation from the PGL of Lanarkshire Middle Ward to the annual Installation meeting of the Lodge. Bro. 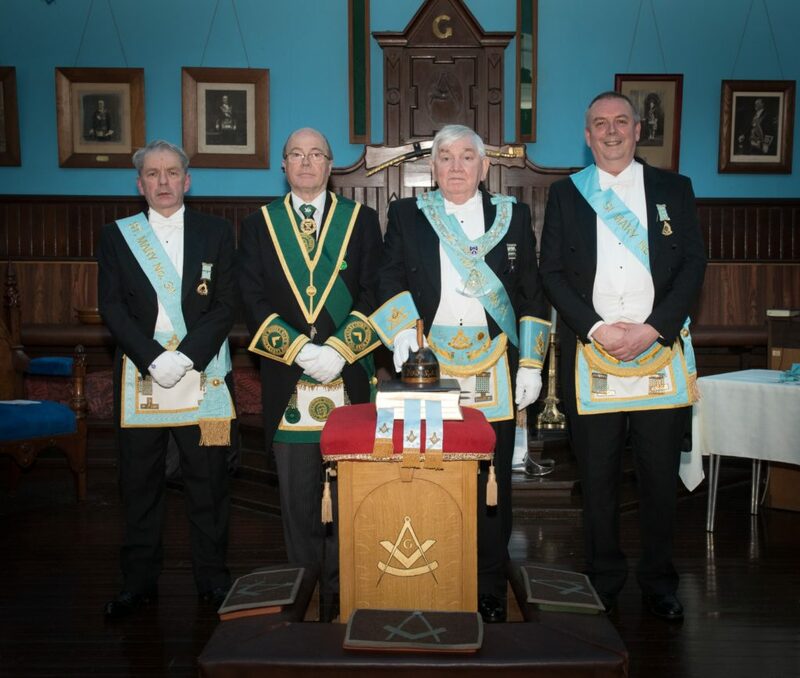 James Paisley and his Office Bearers were Installed in a fine manner by RWIM’s Bro. Brian Stewart PM and Bro. David Smillie PM. In addition to Annual Collection for Grand Lodge Benevolence the Lodge made a generous donation to the PGL Accommodation Fund. The meeting was well attended, with an number of brethren from outwith the Province including some visitors from Germany. Many of the brethren stayed to enjoyed an excellent meal and the harmony which followed. RWIM Bro. Brian Stewart PM, Bro. Norman Carnegy SPGM, Bro. James Paisley RWM, RWIM Bro. David Smillie PM. On Wednesday 27th December, the RWM of Lodge St. Bryde No. 579, Bro. 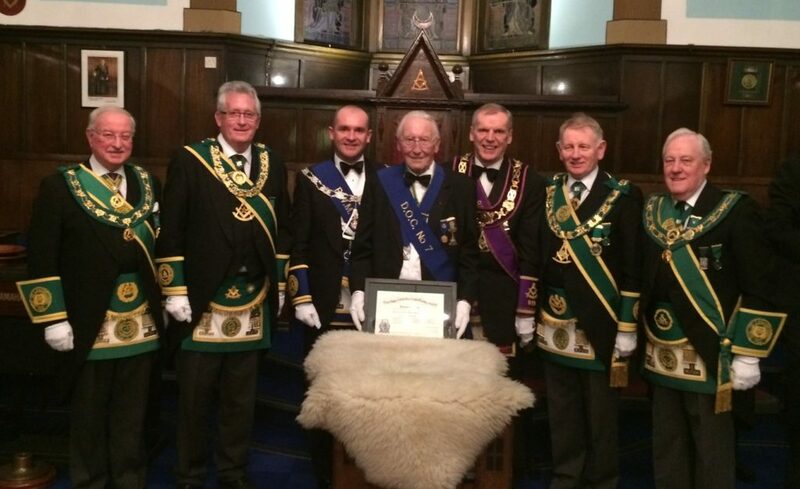 Duncan Mulholland presented a 60 year certificate to Bro. John McLeod, assisted by the PGM, Bro. Bill Perry. Bro. 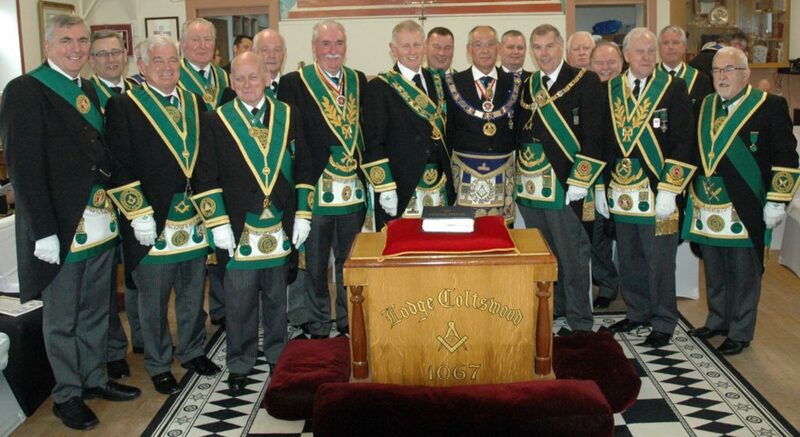 Jim Jack PM and other members of the Lodge paid tribute to Bro. McLeod’s service to Lodge St. Bryde over the years of membership. Bro. McLeod thanked the RWM and Brethren for their friendship and kindness during the past 60 years and wished the Lodge continued success. 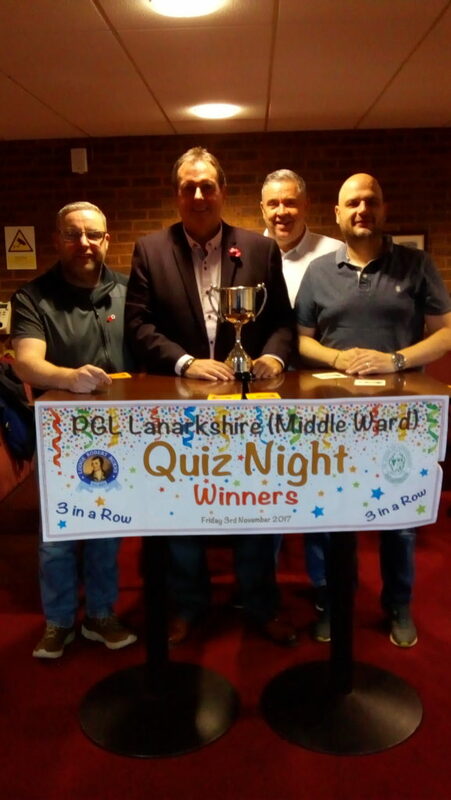 This fundraising was raised from various events throughout the year, including a sponsored walk, charity prize bingo and charity presentation dance. 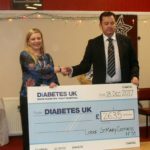 The Lodge is pictured below presenting the cheque to Fiona Menzies from Diabetes UK. The Lodge has asked that that we thank all who participated, assisted, sponsored, donated and helped promote their 2017 charity. Bro. Eric McPhee RWM was installed on Saturday 23rd December. The Installing Masters, Bro. Hayden McFadden PM and Bro. Bobby Ferguson PM who carried out their duties to the highest of standards. Bro. 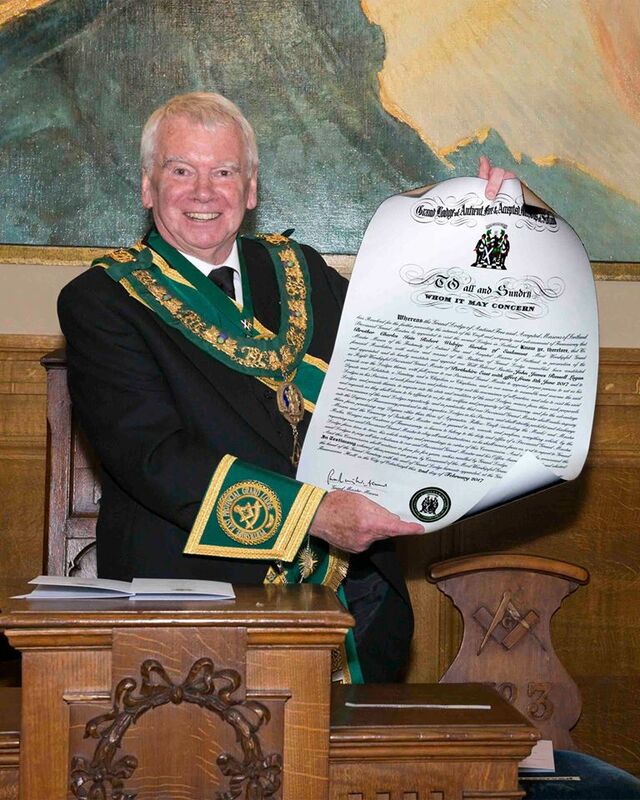 Angus Ross SPGM led the Deputation from Provincial Grand Lodge. A fine meal, toasts and harmony followed the close of the Meeting. 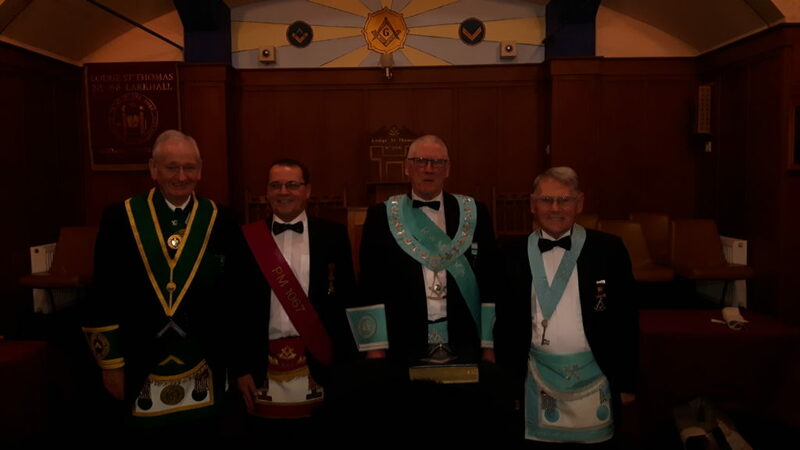 Thursday 21st December 2017 – Lodge, Hamilton No. 233 – Visit by Family Members of Bro. John McNeil Who Emigrated to West Virginia in 1888. On Thursday 21st December, the Provincial Grand Master, Bro. 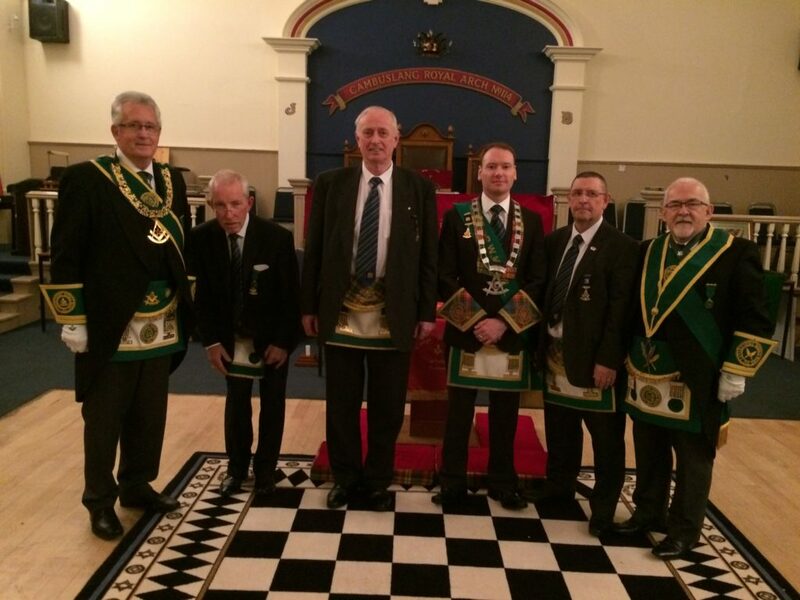 Bill Perry visited Lodge Hamilton No. 233 to meet with Bro. Derek Rodger PM Secretary, Bro. Alan Williard PM, his wife Dannielle and their extended family who were here in Scotland and wished to visit Danielle’s great great grandfathers Lodge, Hamilton No. 233. Her great x 2 grandfather, Bro. John McNeil emigrated to West Virginia in 1888. Bro. Williard is a Past Master of Old Town Lodge No. 751 in Winston-Salem, North Carolina. Bro. 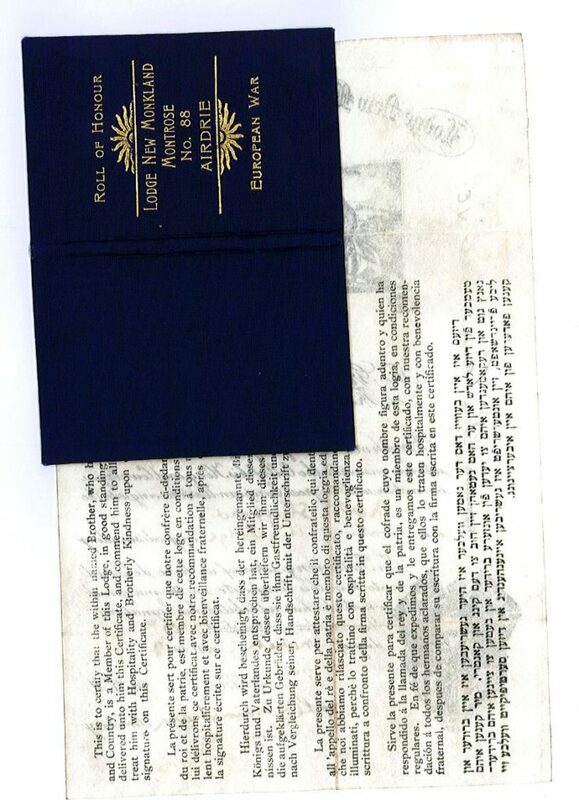 Derek Rodger and Danielle have been corresponding by email to track the Masonic history of the her ancestor and on the night, both had more questions than answers, but both will continue the research and keep us updated. Bro. Williard had attended the Lodge the previous evening and witnessed a F.C. Degree conferred by Bro. Gregor Rodger. Bro. 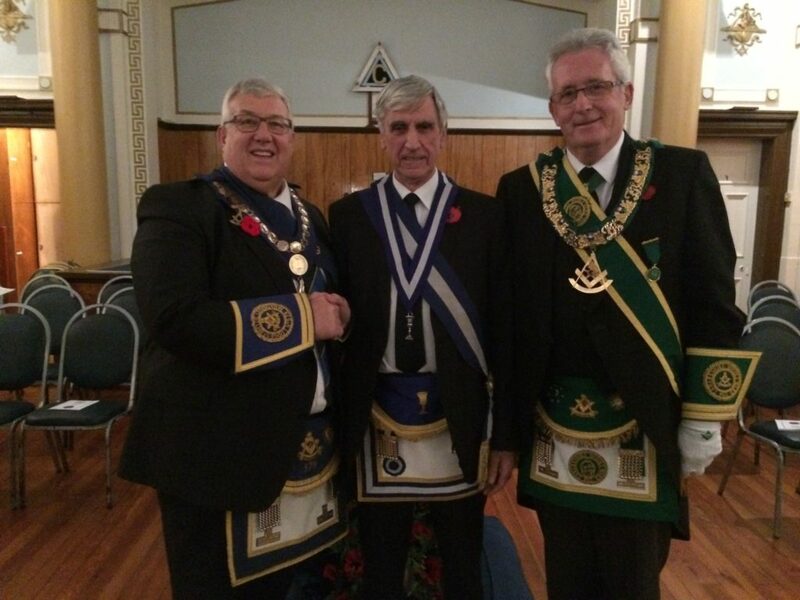 Walter Houston was installed as RWM of Lodge Robert Burns No. 440 on Saturday 16th December. The Installing Masters, Bro. Alasdair MacGregor PM and Bro. Raymond Dow PM carried out their duties to the highest of standards. Bro. Alex Kelly SPGM led the Deputation from Provincial Grand Lodge. Bro. Bill Perry PGM, Alasdair MacGregor PM, Walter Houston RWM, Raymond Dow PM, Alex Kelly SPGM. Bro. Norman Carnegy SPGM headed a deputation from the PGL of Lanarkshire Middle Ward to the annual Installation meeting of the Lodge. Bro. James Durning and his Office Bearers were Installed in a fine manner by RWIM’s, Bro. John Clydesdale, Bro. George McPheat PM and Bro. Gordon Johnstone PM. The meeting was well attended and the Brethren stayed to enjoyed the fine meal and harmony. Bro. Norman Carnegy SPGM headed a deputation from the PGL of Lanarkshire Middle Ward including Bro. Bill Perry PGM to the annual Installation meeting of the Lodge. Bro. Craig Gibson and his Office Bearers were Installed in a excellent manner by RWIM’s, Bro. Bobby MCCormick PM and Bro. James Ferguson PM. The meeting was well attended and the Brethren stayed to enjoyed the fine meal and harmony which followed. 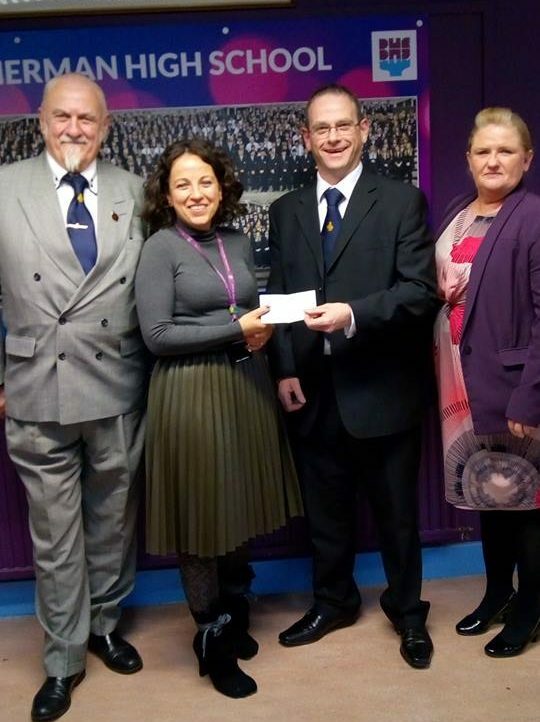 A cheque presentation was made today for a fantastic sum of £2000 to the Nurture Group at Bannerman High School, this was carried out by the Right Worshipful Master of the Lodge Bro. Derek Beaton. 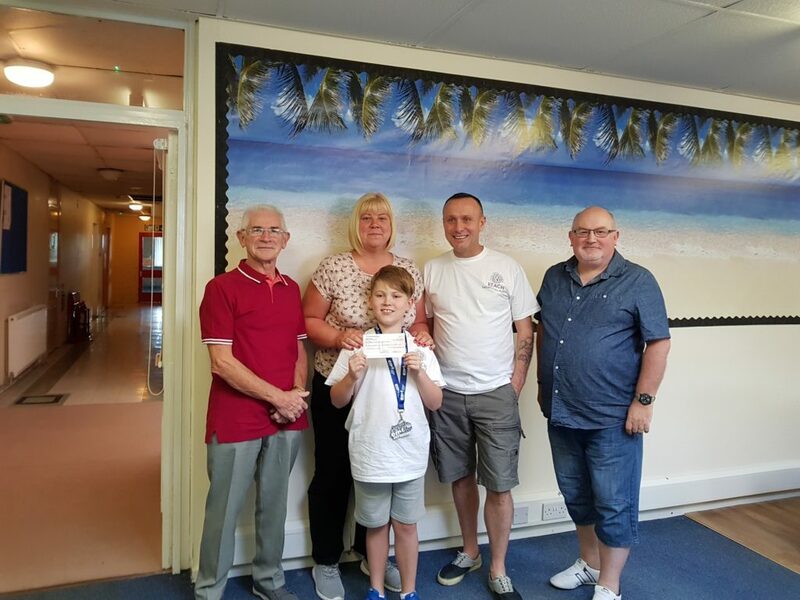 Derek comment on social media that this was very uplifting experience and made him proud to be a Freemason, well done to the Lodge for their fundraising efforts and generosity to the local community. Bannerman High School Nurture Group help support some the most disadvantaged and vulnerable young people at the school. Many of the young people supported in their Nurture Group have experienced significant trauma(s) in their lives and issues surrounding insecure attachment. Without support these young people are more likely to continue to suffer from poor self-esteem, opt out of school or leave without qualifications. A major part of nurture is to provide an alternative learning environment where these young people are able to establish good relationships with members of staff. A safe place where they feel valued, listened to and somewhere they belong. Part of the learning experience is to establish routines and structures similar to that in a home. The nurture classroom is set up as a home in school. Everyone eats together, talks and carry out programmes tailored to the individual needs of the group. The group is totally self funding and relies of staff donations and fundraisers. RWM Derek Beaton and Bro Chris Elliot presenting the cheque to Ruth Guile, teacher who works with and manages the group. A combined carol service for Lanarkshire Freemasons was held at Newarthill and Carfin Parish Church on this evening. The service being conducted by Rev. Elaine McKinnon, assisted by Rev. Shaw Paterson. The lessons being read by the leaders of the various Orders within Lanarkshire. A packed Church enjoyed the evening of Carol singing and worship. At the close of the service, the congregation enjoyed a fantastic buffet provided by the ladies of the host Lodge, Robert King Stewart No. 919. Our thanks also to the organist, Sheena Torrance. The collection and donations from the Masonic Orders will be donated to Rev. McKinnon’s chosen charity, St. Andrews Hospice. Bro. Norman Carnegy SPGM headed a deputation from the PGL of Lanarkshire Middle Ward including Bro. Bill Perry PGM to the annual Installation meeting of the Lodge. Bro. 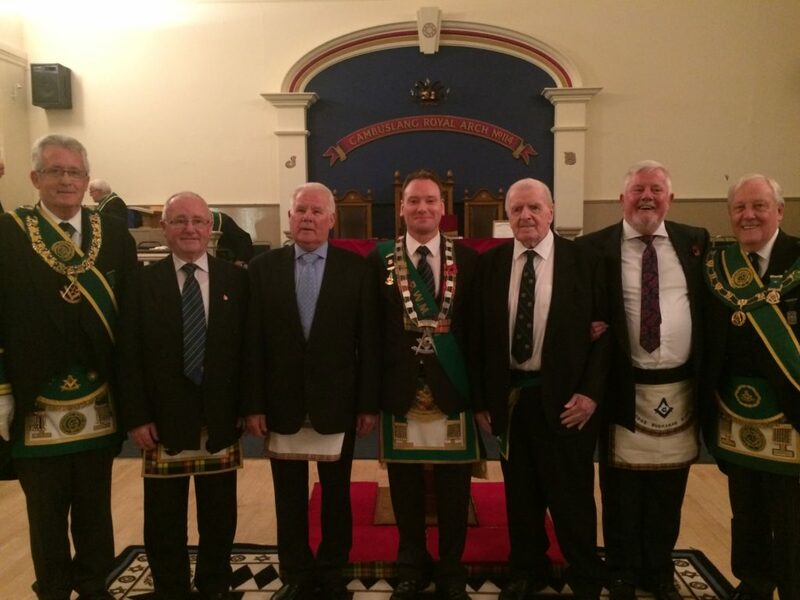 Pringle Johnstone and his Office Bearers were Installed in a very fine manner by RWIM’s, Bro. Allan Hutton PM and Bro. Charles Ringrose PM. In addition to Annual Collection the Lodge made further donations to the Masonic Homes Fund and the PGL Accommodation Fund. 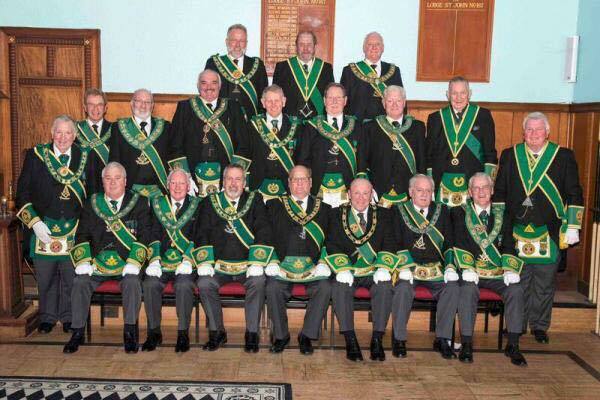 The meeting was well attended and the Brethren stayed to enjoyed the harmony which followed. Bro. Craig McKee and his Office Bearers were Installed in a very fine manner by RWIM’s, Bro. David McKee PM (his father) and Bros. John Hume PM, Iain McPhedran PM, William McRobbie PM. There was a good attendance at the meeting and most of the Brethren stayed to enjoyed the harmony which followed. Bro. 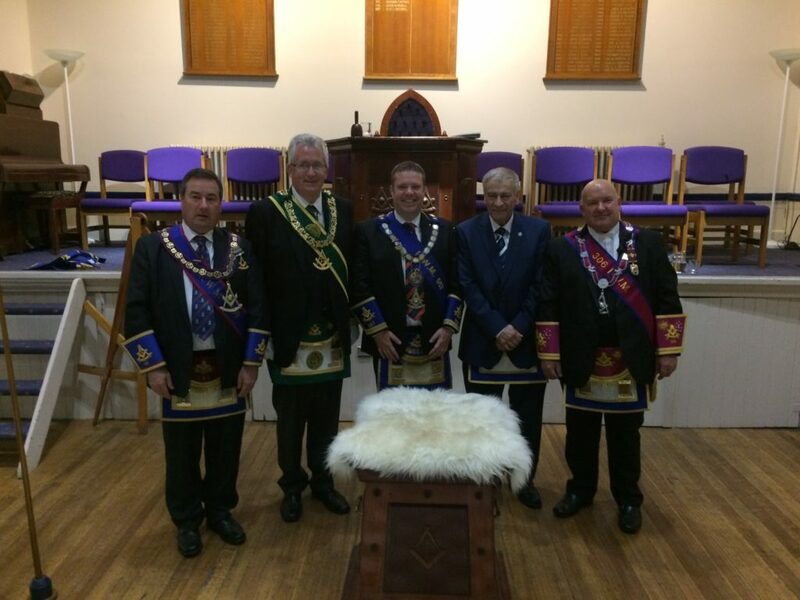 John Dunn PM was Installed into the chair of Lodge Motherwell Caledonian No. 1228 on Friday 8th December. 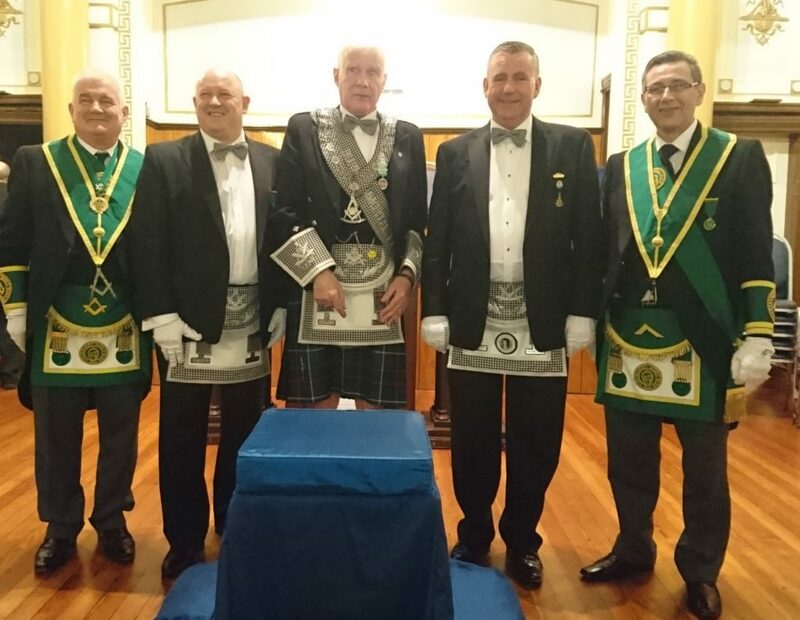 The Installing Masters on the night were Bros. Alan Nightingale PM, Ian Anderson PM, John Calderwood PM and Drew McGregor PM. Bro. Andrew D Millar DPGM led a large Deputation from Provincial Grand Lodge. The Installation was delivered to a high standard and at the close of the Meeting, the Brethren enjoyed a fine meal and Lodge hospitality. Drew McGregor PM, Alan Nightingale PM, John Dunn RWM, Ian Anderson PM, John Calderwood PM. It is with deep sadness that we have to advise, that Mrs. Helen Stirling, wife of Bro. Bob Stirling PM of Lodge Motherwell Caledonian No. 1228 and PPGSW passed away on Tuesday 5th December. The Provincial Grand Lodge of Ayrshire held their Annual Xmas Carol Service at Crosshouse Parish Church on Sunday 3rd December. PGM Bro. 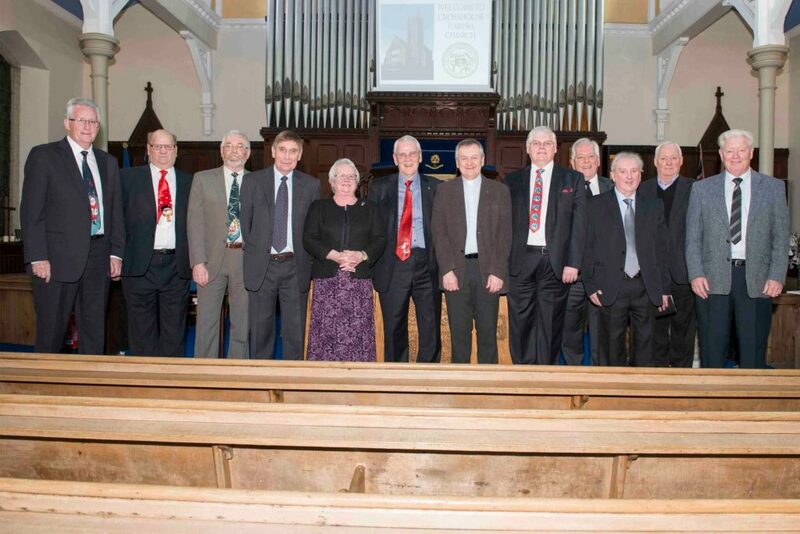 Robert Little and the Brethren from Ayrshire gave a warm welcome to the visitors. PGM Bro Bill Perry, Provincial Grand Secretary Bro. Willie Craig and Bro. Billy Spencer attended the Service. Bro. Norman Carnegy SPGM headed a large deputation for PGL to the Installation of Bro. 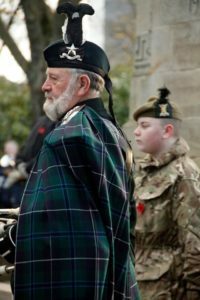 Gordon McLeod RWM, Bro. Gordon installed by Bro. Robert Ross PM with the Office Bearers being installed by Bro. Gordon Rowe PM, Bro. Ross stood in at short notice for Bro. Kenny Murray PM who was recovering from his recent illness, the ceremony was conducted to a very high standard. Following the ceremony the Brethern enjoyed a fine meal and harmony. Bro. 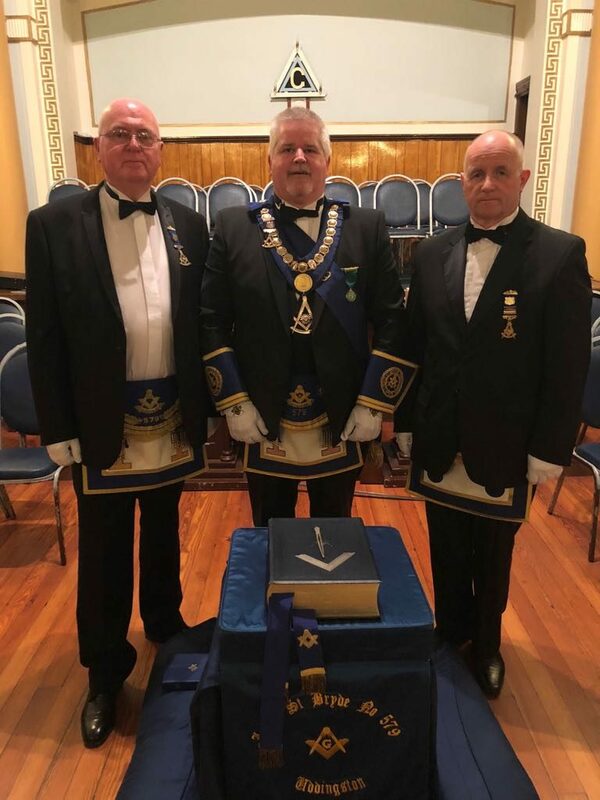 Andrew D. Millar headed a large deputation from Provincial Grand Lodge and attended the Installation ceremony of Lodge Robert King Stewart No. 919 where Bro Phil Biggerstaff RWM was installed in an expert manner by Installing Masters Bro Jamie Paterson PM and Bro Gary Muircroft PM. The deputation was enhanced by Bro Ken D Kennedy PPGM and Bro Tom Davidson IPPGM, Following the ceremony the Brethren enjoyed so Lodge hospitality and friendship. 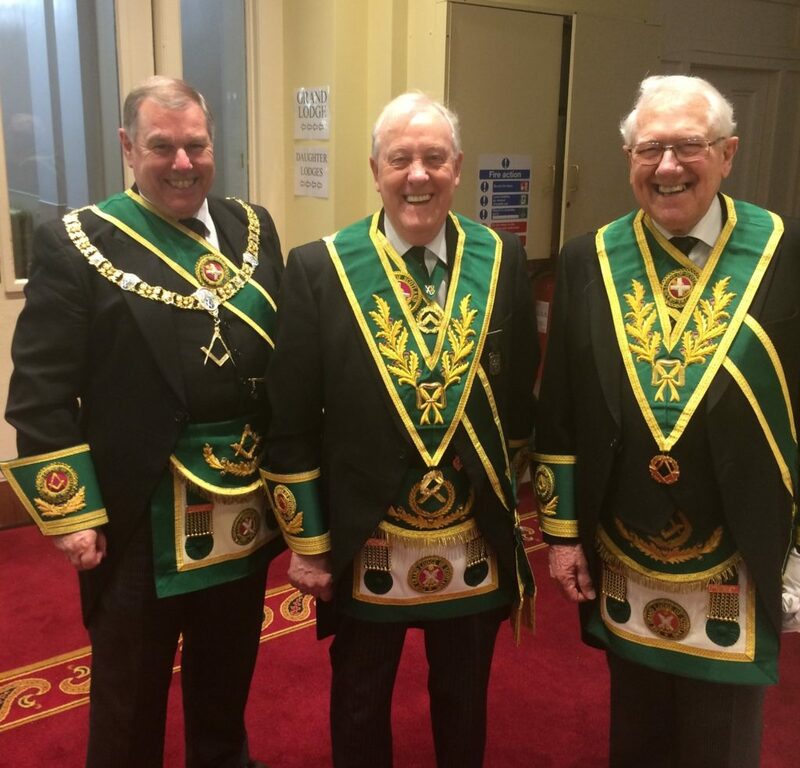 All three Brethren were speechless when the PGM called them to offer his congratulations. The presentation of jewels and certificates will take place at the Provincial Grand Lodge AGM on the 12th January. Bro. Kenneth Mason and his Office Bearers were Installed in a very fine manner by RWIM’s, Bro. Kenneth Dalzell PM and Bro. Stuart Cameron PM. The new RWM presented a generous cheque on behalf of the Lodge to Bro. Carnegy for the Holiday Accommodation Fund. The meeting was very well attended and afterwards the Brethren enjoyed an excellent meal and harmony. Kenneth Dalzell RWIM, Kenneth Mason RWM, Norman Carnegy SPGM, Stuart Cameron RWIM. The RWM, Bro. Bryce Morrison gave a warm welcome to the many Brethren who were present. A large Deputation from Provincial Grand Lodge headed by SPGM Bro. Alex Kelly attended the Installation. Bro. Kelly was accompanied by Bro. Bill Perry PGM, Bro. Jim Kerr DGM of Central South Africa, Bro. Philip Marshall PGM of Nottinghamshire and Jim Jack PPGM. 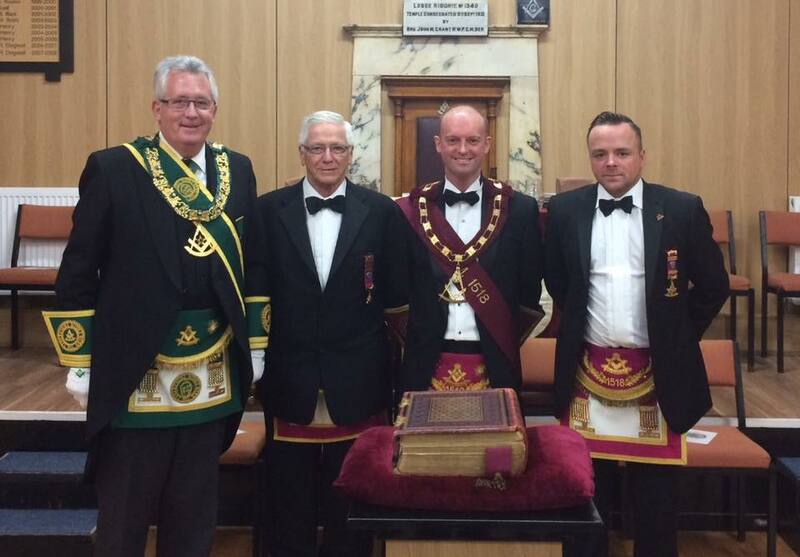 The Installation of the new RWM, Bro. Duncan Mulholland was carried out in excellent fashion by Bro. Jim Vasey RWIM and Bro. David Shaw RWIM. Following the close of the meeting, the Brethren enjoyed a fine meal and harmony. Jim Jack PPGM, Philip Marshall PGM of Nottinghamshire, Alex Kelly SPGM, Duncan Mulholland RWM, Jim Kerr DGM Central South Africa, Bill Perry PGM. RWM, Bro. Ian Anderson was reinstalled by Bro. James Brown RWIM, Bro. Scott Maclean RWIM & Bro. Gary Stevenson RWIM from Lodge Nethan St John No. 1289. Bro.Ian Anderson gave a warm welcome to the many Brethren who were present. A large Deputation from Provincial Grand Lodge was headed by SPGM Bro. Angus Ross .The Installation was enhanced by the attendance of Bro.Steven Adams from West Kent Provincial Grand Lodge. Bro. Angus Ross SPGM, Bro. James Brown RWIM, Bro. Scott Maclean RWIM, Bro. Ian Anderson RWM, Bro. Gary Stevenson RWIM, Bro. Steven Adams from West Kent Provincial Grand Lodge. Bro. Derek Beaton RWM of Lodge Robert Burns No. 440 welcomed Bro. Bill Perry PGM, Bro. Jim Kerr DGM of Central South Africa and Bro. Jim Jack PPGM to the Regular Meeting where the Lodge Office Bearers conferred an excellent MMM Degree on four Brethren. At the close Bro. Kerr presented the RWM with a memento to mark the occasion..
Bro. Angus Ross SPGM headed a deputation to the Installation of Bro. Hugh Syme RWM, he was installed as Master by Installing Masters Bro. James S. Dorricott P.M. and Bro. James Carruthers P.M. The Lodge was well supported on the evening by a good attendance of brethren from within and out with the Province. Following the Installation the Brethren had a very enjoyable and sociable dinner. At the Regular Meeting of Lodge Buchanan No. 1499, three Brethren were honoured by the Lodge, by receiving Distinguished Service Membership, Bro. Robert Edwards PM, Bro. Hugh Twaddle PM and Bro. Fred Stibbs PM. The Brethren are now part of a very exclusive group within the Lodge, joining Bro. Willie Craig PM as the only living Distinguished Members. RWM Bro. Stuart Fotheringham paid great tribute to the service to the Lodge by all three Brethren and then along with the PGM, Bro. Bill Perry and PPGM Bro. George Kelly, presented the Diplomas. The three Worthy Brethren, who were asked to say a few words thanked the RWM and the Members of the Lodge for this great honour. An excellent FC Degree followed the presentations. Bro. Alex Kelly SPGM led a fine deputation to the Installation of Lodge Garrowhill No. 1413 on Saturday 19th November 2017. Bro. John Walker was installed in a fine manner by Bro. James Alton RWIM and Bro. Kenneth Moir RWIM. Bro. Norman Carnegy SPGM headed a deputation from PGL Lanarkshire Middle Ward including Bro. James Vasey JPG Chap to the annual Installation meeting of the Lodge. Bro. Graham Morrison the new RWM and his Office Bearers were Installed in a very fine manner by RWIM’s, Bro. Andrew Skinner PM and Bro. Scott Munro PM. The meeting was very well attended and afterwards the Brethren enjoyed an excellent meal and harmony. 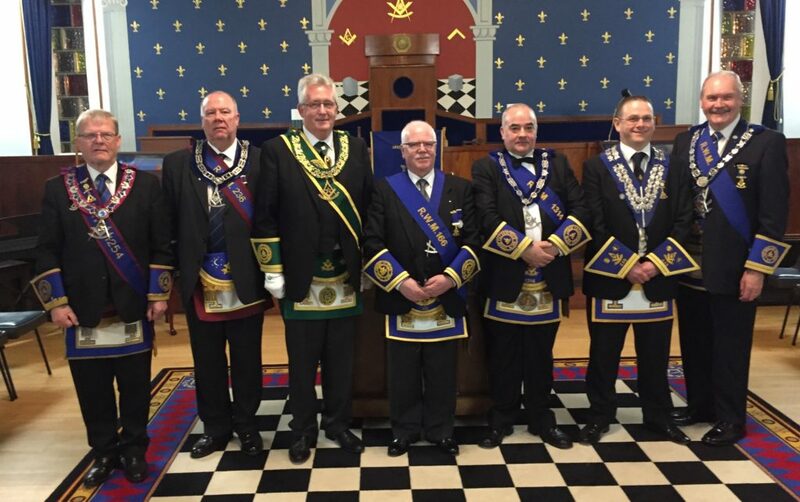 A large Deputation from Provincial Grand Lodge attended Lodge Bothwell Brig No. 1229. The RWM, Bro. Charles Curle gave a warm welcome to PGL and to the many visitors who were present. 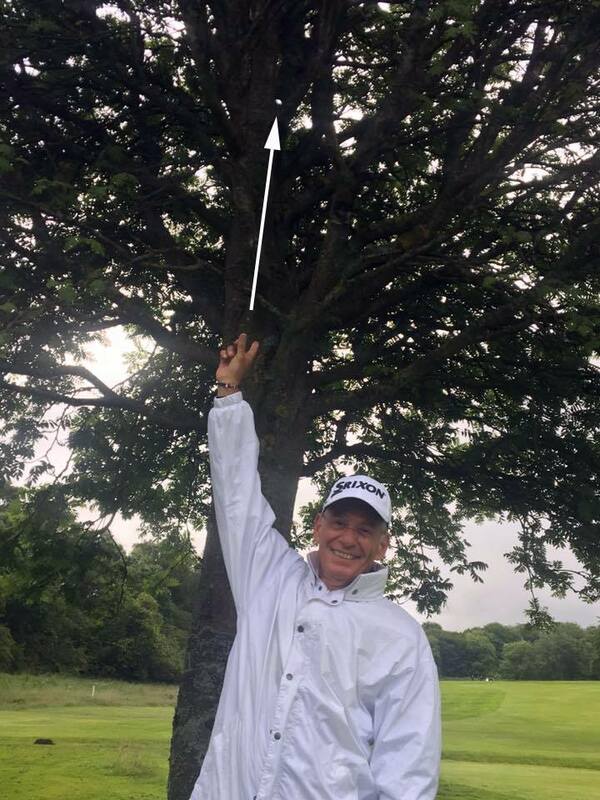 The PGM, Bro. Bill Perry was then presented with the Lodge Gavel to preside over the Lodge. The PGM called upon the DoC to present Bro. 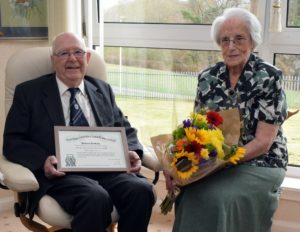 David GF Steel PM to receive his Diamond Certificate on completing 60 years in the Craft. The PGM gave a comprehensive account of Bro. Steel’s life and service to his Lodge and Provincial Grand Lodge and congratulated him on a wonderful achievement. Bro. Steel thanked the Lodge and PGL for their very kind words and then joined the RWM in the East. RWM, Bro. Bryce Morrison and the Brethren of Lodge St. Bryde No. 579 then conferred an excellent FC Degree. The meeting on being closed, the Brethren retired an enjoyed some Lodge Bothwell Brig hospitality. Bro. 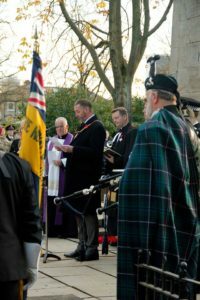 Tom Davidson IPPGM represented the province at the open air service to remember the Victoria Cross recipients in Hamilton. Also present were Bros. David Stark and David Greenshields. 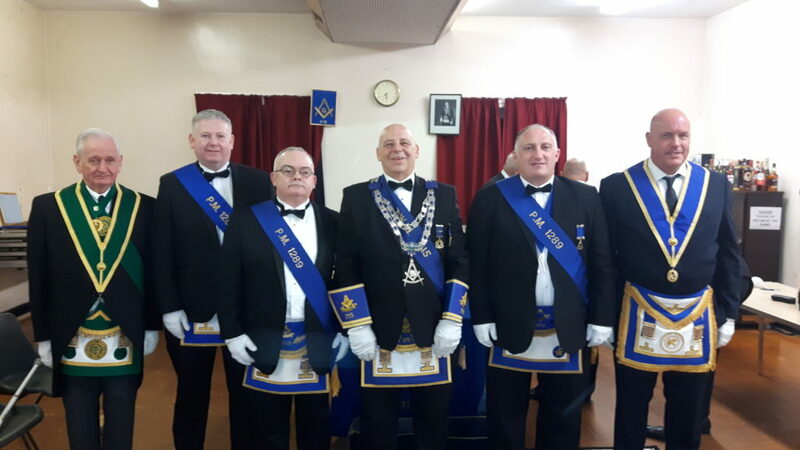 A large deputation from PGL Lanarkshire Middle Ward attended the annual divine service of the Airdrie Lodges at New Wellwynd Parish Church. 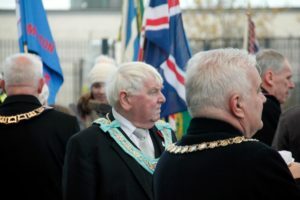 The service was hosted by The Operative Lodge of Airdrie No. 203 and readings were delivered by Bro. 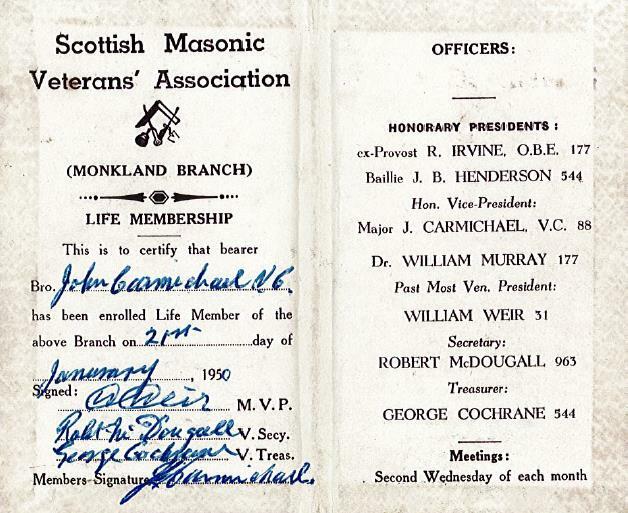 Donald Reoch PM & Bro, Iain McComb PM, the other two Lodges in attendance were New Monkland Montrose No. 88 & Lodge Caldercruix St. John No. 1314. The service was conducted by Reverend Robbie Hamilton who gave a very though provoking sermon. Over fifty brethren from lodges all over the province, including 20 RWMs wearing their chains of office to represent their lodges, joined Bro. 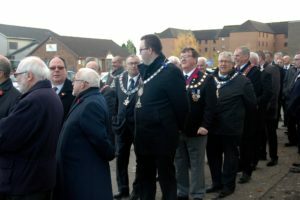 Bill Perry RWPGM and and Commissioned Officebearers to parade to the Cenotaph in Hamilton. 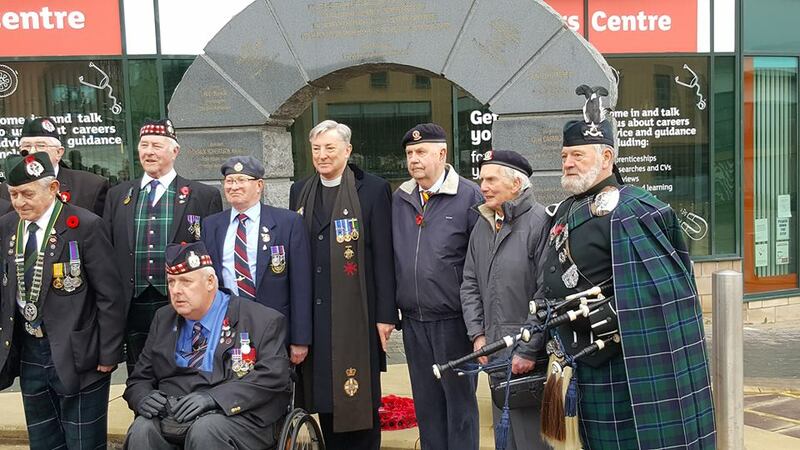 They joined with military and other organisations from the area to participate in the Civic Remembrance Day Service. The RWPGM laid a wreath at the Cenotaph on behalf of all the freemasons of Lanarkshire Middle Ward to recognise the sacrifice made by others to secure our freedoms. 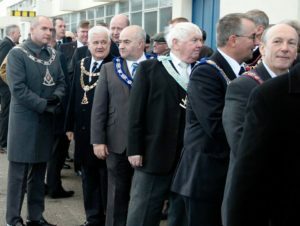 Following the service the parade returned to march past the Civic Leaders at the council chambers in Almada Street. 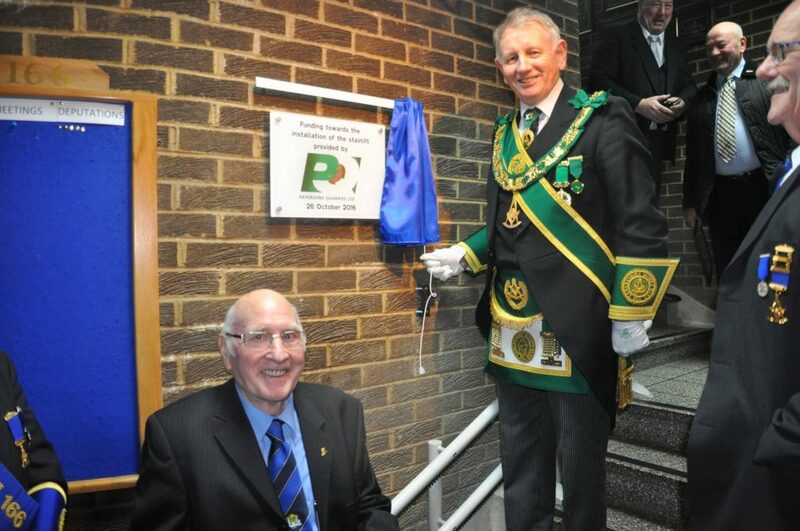 The RWPGM thanks all who attended and supported on this special occasion. Lodge St. Bryde No. 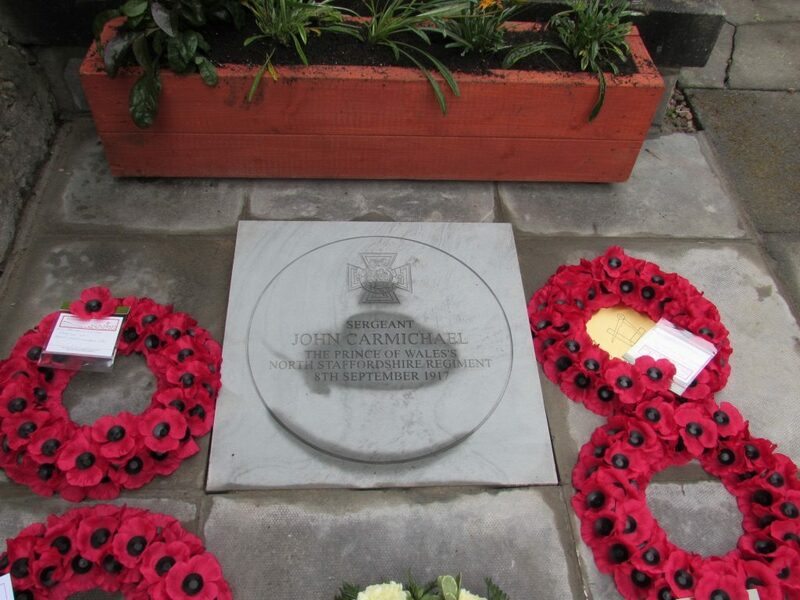 579 held a Service of Remembrance to commemorate the Fallen, on Wednesday 8th November. RWM, Bro. Bryce Morrison extended a warm welcome to the assembled Brethren. The Service was conducted by Bro. Rev. Peter Price in his usual inimitable and sincere manner. Bro. Price invited the RWM, IPM and members of Provincial Grand Lodge to participate in this special event. 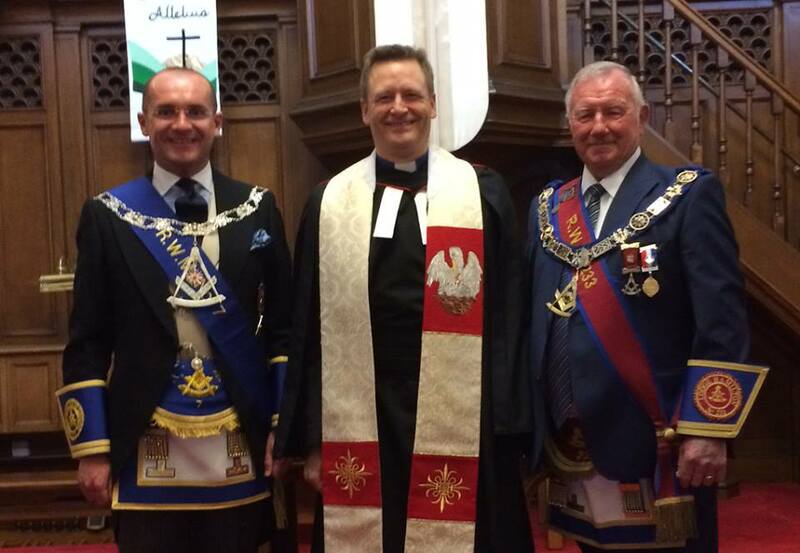 The Ceremony was carried out with great solemnity and was warmly received by the Brethren. Prior to the Service, Bro. John McKie of Lodge Bothwell Brig No. 1229, was awarded Honorary Membership of the Lodge by RWM Bro. Bryce Morrison. A large Deputation from PGL attended the Regular Meeting of Lodge Buchanan No. 1499 on Monday 6th November, RWM Bro. Stuart Fotheringham gave a warm welcome to the Deputation and to the many visitors present. 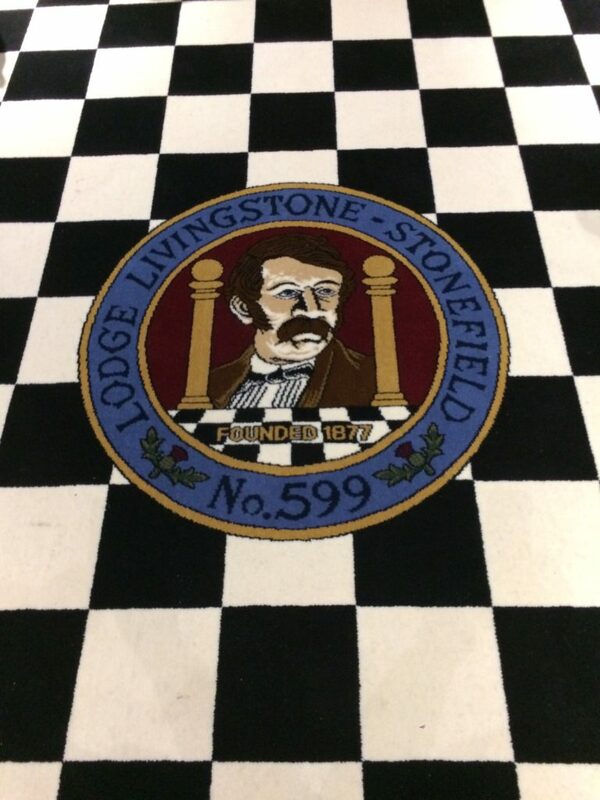 PGL were invited to carry out the Ceremony of Dedication of the new Lodge Carpet. The Senior Provincial Grand Chaplain, Bro. Jim Ferguson performed these duties to the highest of standards, assisted by Bro. Jim Vasey, Junior Provincial Grand Chaplain and Bro. Tom McCrone Provincial DOC. Following the Dedication, four Brethren of the Lodge received their 50 year diplomas, Bro. Sam Mooney, Bro. Willie McCallum, Bro. Alex Neil and Bro. Russel Clearie, at the capable hands of the RWM. The Brethren then retired and enjoyed the hospitality of the Lodge. 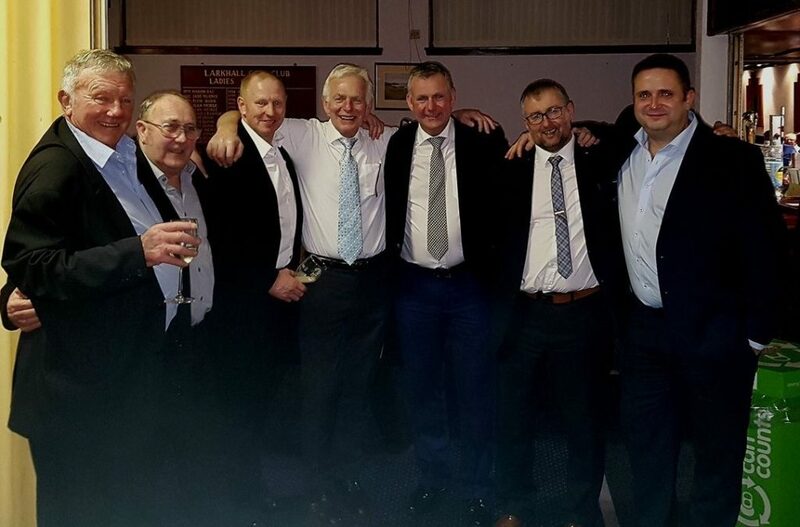 Bill Perry PGM, Willie McCallum, Sam Mooney, Stuart Fotheringham RWM, Alex Neil, Russel Clearie, George Kelly PPGM. Bro. Bill Perry PGM, Bro. Willie Craig PG Sec. and Bro Iain Brown PPGSW visited Lodge Livingstone Stonefield No. 599 at their Regular Meeting on 2nd November. RWM Bro. Andrew Walker gave a warm welcome to the many visitors present, with a special welcome to RWM Bro. Alastair Gillespie and the Brethren from Lodge De Drie Verlichie Torens ( The Three Illuminated Towers) No. 274 from the Netherlands. Bro. 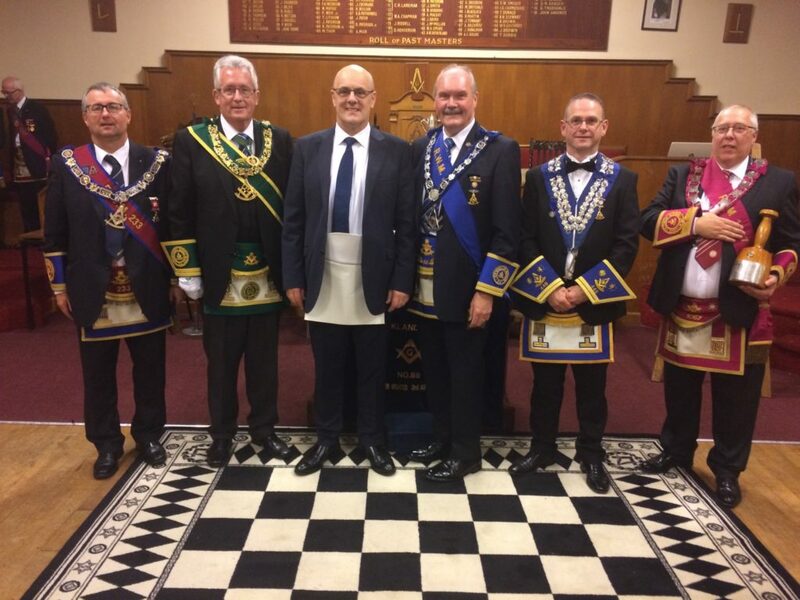 Gillespie, a member of 599 thanked the members of Lodge Livingstone Stonefield for their visit to the Netherlands earlier this year to his Installation and thanked also those Brethren from the Netherlands who had accompanied him on his visit to Scotland. An Exemplification of the F.C. Degree was then conferred to the highest standard. 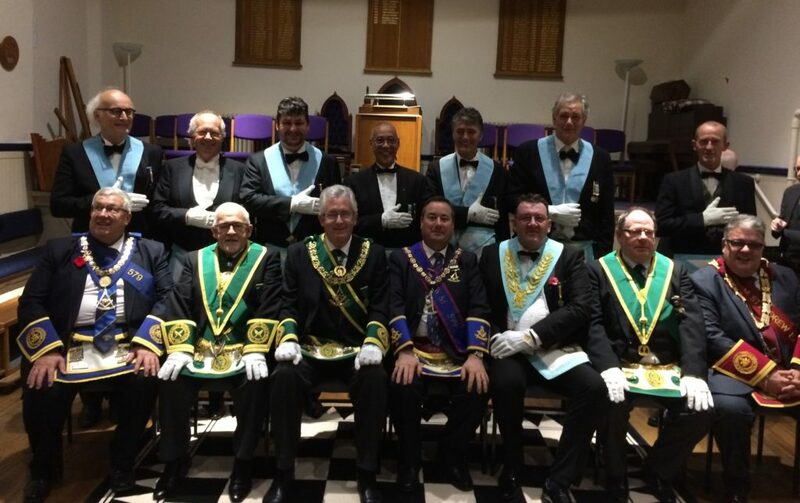 The Brethren then enjoyed some excellent 599 hospitality and harmony. 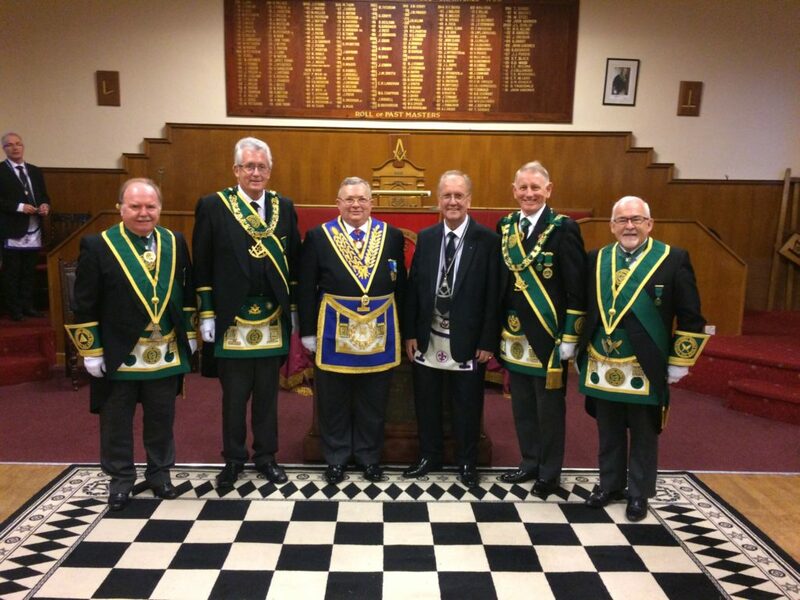 The Operative Lodge of Airdrie hosted the event and PGL thank them for their generous hospitality. Our Quizmaster, Bro. Tom Davidson once again tested the knowledge of the 21 teams taking part. 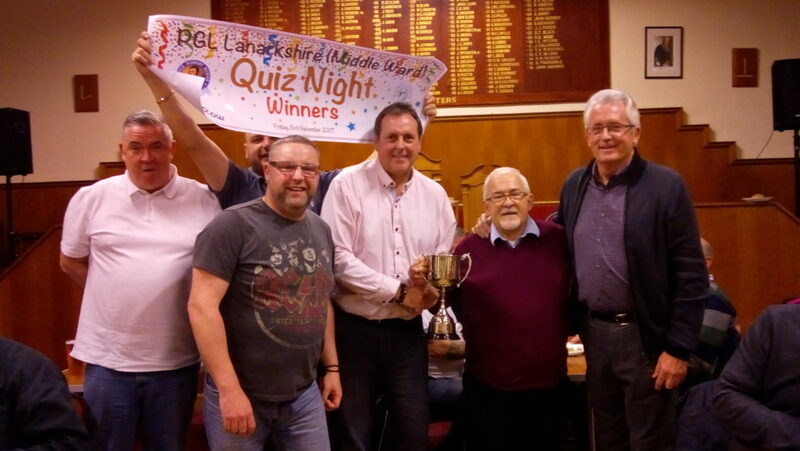 The quiz was a very close run thing, with the lead changing hands round after round, however Lodge Robert Burns “A” team came through in the final round to win by the smallest of margins, half a point, to pip Lodge Kirkhill and retain the Alasdair Dunlop Trophy. Three in a row for 440! Can they be stopped next year? Over £650 was raised for the Holiday Accommodation Fund and my thanks to everyone for their support and participation with a special thanks to those who assisted throughout the night. Raymond Dow, David Ross, Alan Smith, David Aitchison. Bro. Bill Perry PGM, Bro. Willie Craig PG Sec. and Bro Iain Brown PPGSW visited Lodge Livingstone Stonefield No. 599 at their Regular Meeting on 2nd November. RWM Bro. Andrew Walker gave a warm welcome to the many visitors present, with a special welcome to RWM Bro. Alastair Gillespie and the Brethren from Lodge De Drie Verlichie Torens ( The Three Illuminated Towers) No. 274 from the Netherlands. Bro. 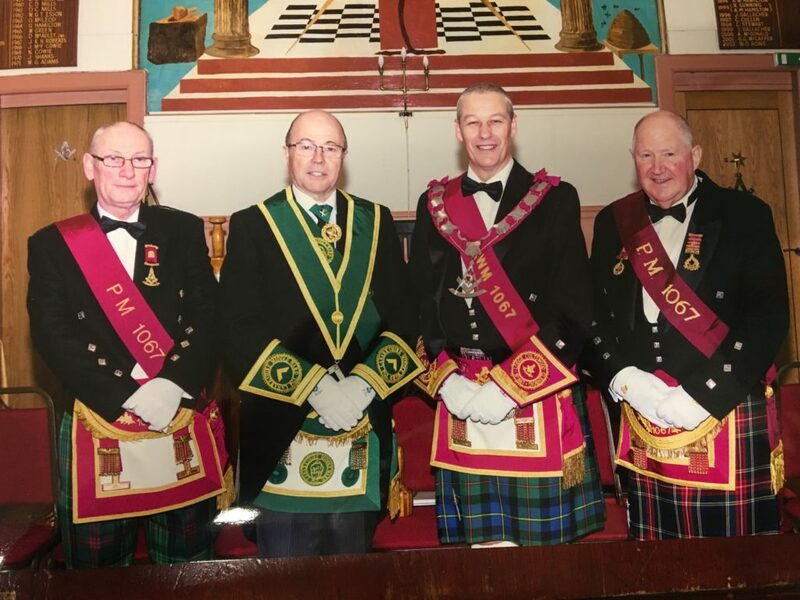 Gillespie, a member of 599 thanked the members of Lodge Livingstone Stonefield for their visit to the Netherlands earlier this year to his Installation and thanked also those Brethren from the Netherlands who had accompaniedŷ him on his visit to Scotland. An Exemplification of the F.C. Degree was then conferred to the highest standard. 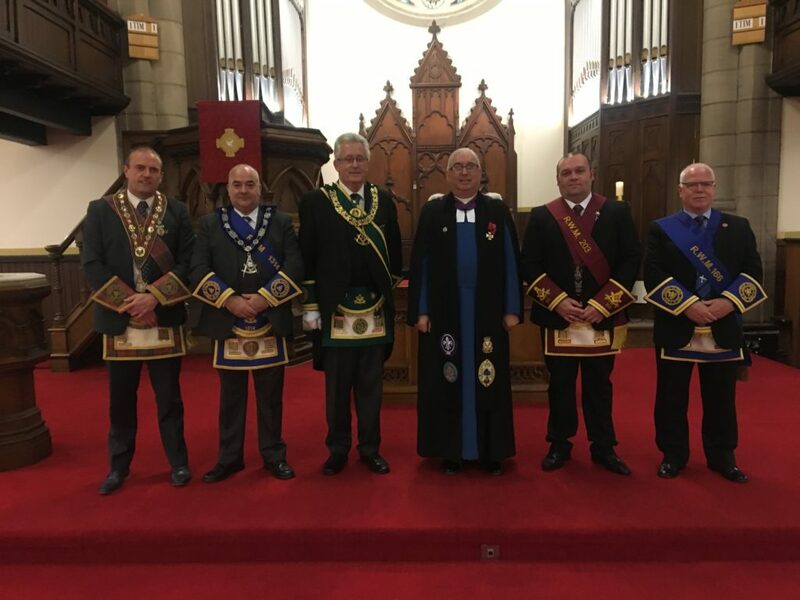 A large deputation from PGL Lanarkshire Middle Ward attended the annual divine service of PGL Ayrshire at Galston Parish Church which was conducted by Rev. Kristina Hine and Rev. Steve Clipston (P.G. Chaplain). 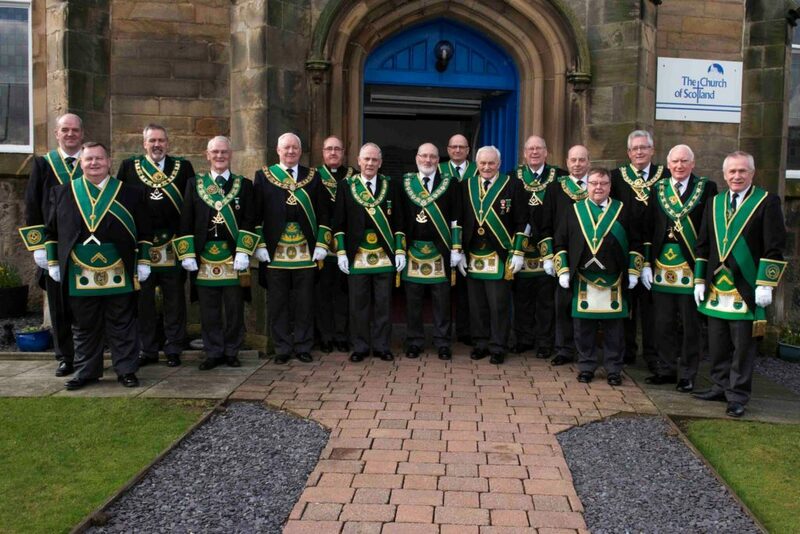 This was the last annual divine service in PGL Ayrshire before Bro. Robert Little RWPGM demits office at the end of January 2018. In attendance were Bros. Tom Davidson IPPGM, George R Kelly PPGM, Andrew D Millar DPGM, Norman M Carnegy, Alex R Kelly and Angus G Ross SPGMs. Bro. Colin Lees, RWM of Lodge Fluer-De-Lys No. 1722, welcomed W.. Bro. 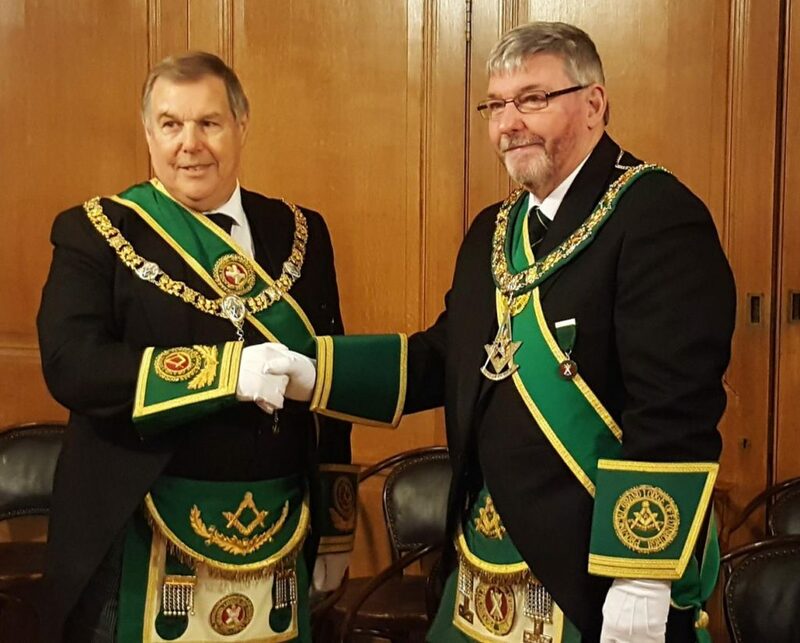 Tony Harvey, PGADC of the United Grand Lodge of England, to present a lecture on similarities of Scouting and Freemasonry, “Two Parallel Organisations”. Bro. Harvey was the Prestonian Lecturer of the UGLE in 2012. The assembled Brethren which included a Deputation from Provincial Grand Lodge, were given a great insight to the Scouting Movement with the many comparisons to our Masonic beliefs. At the conclusion, the RWM thanked W. Bro. Harvey on behalf of all present. Bro. Raymond King, Bro. Jim Ferguson Sen. PG Chaplain, Bro. Bill Perry PGM, W.. Bro. Tony Harvey, Bro. Colin Lees RWM, Bro. Tom Davidson IPPGM, Bro. Willie Craig PG Sec. RWM Bro. Bryce Morrison gave a warm welcome to all Brethren who were in attendance, on this very special occasion in the Lodge History. 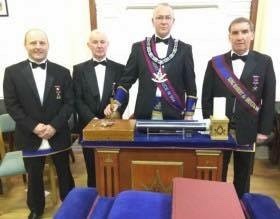 The RWM presented the Mallet to PGM Bro. Bill Perry who exchanged the normal formalities and introduced the members of the Deputation, Bro. David Stark Prov. Piper, Bro. Alex Hamilton PPGSW, Bro. Jim Vasey Prov. Junior Chaplain, Bro. Willie Craig PG Sec., Bro. Alex Kelly SPGM, Bro. George Kelly IPSGM and the Most Worshipful Grand Master of Kansas, Bro. B. Cole Presley. Bro. Perry thanked the Grand Master for visiting Lodge St. Bryde at the invitation of Bro. Jim Jack, PPGM, who is the representative of the Grand Lodge of Kansas at the the Grand Lodge of Scotland. The assembled Brethren gave the Grand Master a warm welcome at the call of the PGM. The Lodge then conferred an excellent FC Degree and at it’s conclusion the MW Grand Master, Bro. Cole Presley addressed the Brethren and congratulated the RWM and the members of 579 on the standard of the Ceremony. The Brethren then retired to enjoy some Lodge hospitality. Bro. Jim Jack PPGM, MW Grand Master Bro. B. Cole Presley, Bro. Bryce Morrison RWM, Bro. Bill Perry RWPGM, Bro. George Kelly IPSGM. 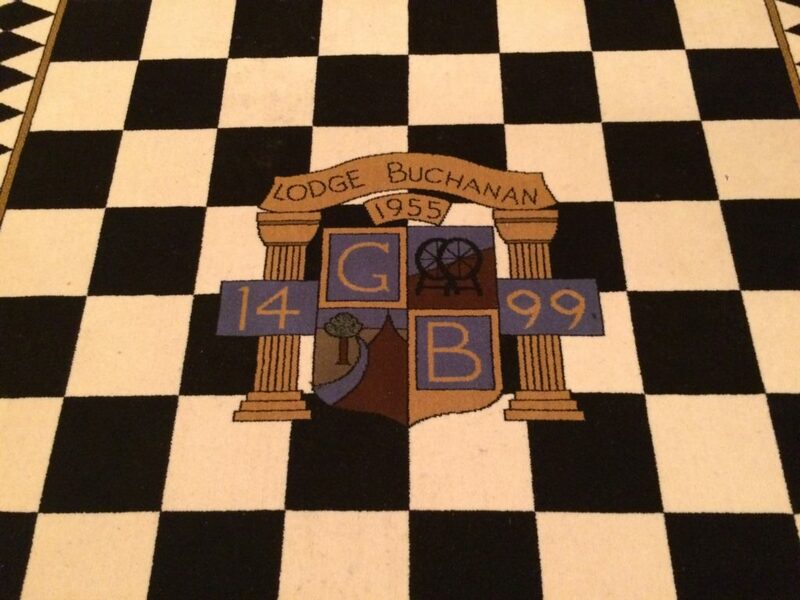 On Sunday 15th October, Lodge Buchanan No. 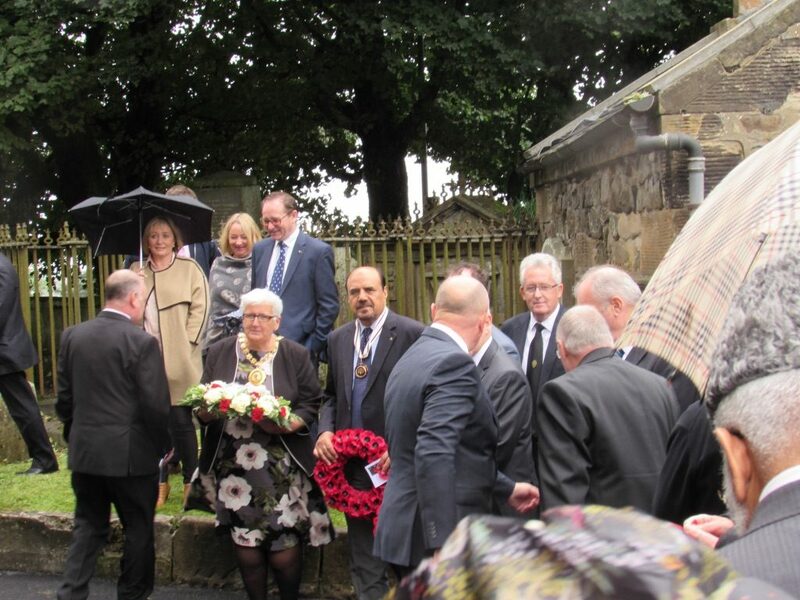 1499 held their Annual Divine Service at Cambuslang Parish Church.The service once again being conducted by Rev. Leslie Milton. Following the close of the service, the Brethren and congregation retired to the Church Hall for light refreshments. RWM Bro. Stuart Fotheringham thanked the Minister, the organist Jonathan Buchan and all Brethren and friends for their support. Bro. Bill Perry PGM and a large deputation from PGL joined Lodge Buchanan in this important event in the Lodge calendar. 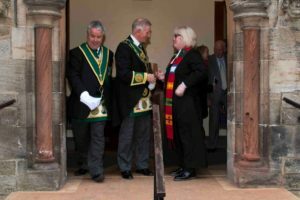 The Installation of Office Bearers of the Provincial Grand Lodge of East Lothian and Berwickshire was held at Haddington on Saturday 14th October. PGM Bro. Douglas Fergie gave a warm welcome to the visiting Provincial Grand Lodges and to the many Norwegian Brethren who were present.Bro. 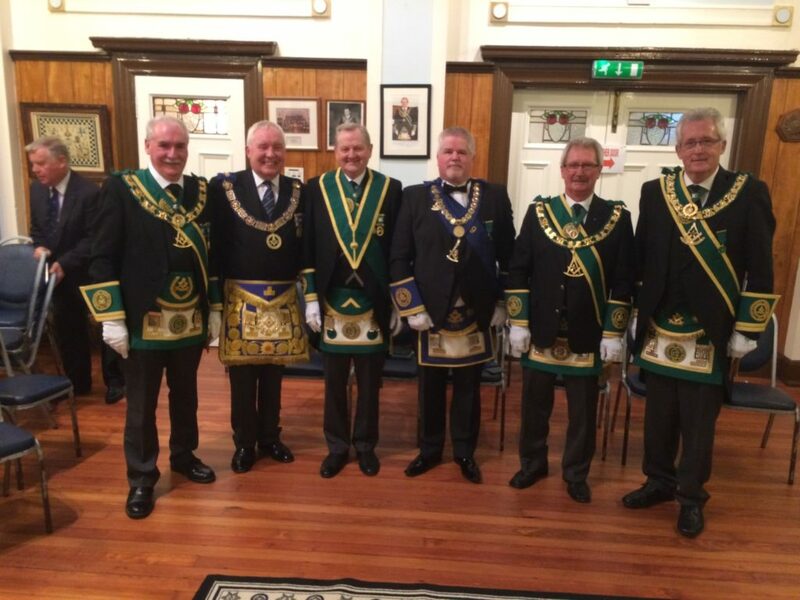 Bill Perry, PGM was accompanied by Bros. Willie Craig, Tom McCrone, Douglas Welsh and Billy Spencer. Following the completion of the Installation, Bro. Gordon Kilgour PM of Lodge Dunbar Castle No. 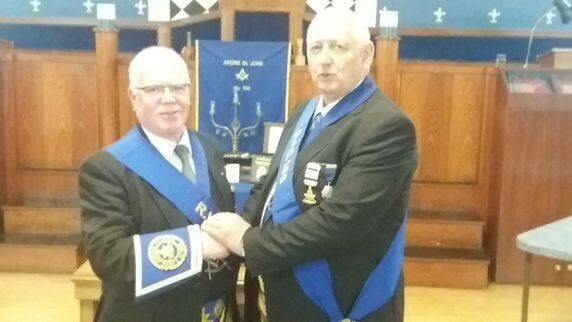 75 was presented with a Past Provincial Grand Senior Wardens Jewel to mark his service to the PGL of East Lothian Berwickshire. Bro. Douglas Welsh PGC, Bro. Gordon Kilgour PPGSW, Bro. Bill Perry PGM. Bro. Norman Carnegy SPGM headed a large deputation from PGL Lanarkshire Middle Ward including Bro. Tom Davidson IPPGM, Bro. James Shanks PDPGM, Bro. James Ferguson SPG Chap and Bro. Peter Ball PJPG Chap to the annual Installation meeting of St. Mary Coltness No 31 on Friday 13th October. Bro. Archie Sands and the Lodge Office Bearers were Installed in a very fine manner by RWIM’s, Bro. Archie Hall PM and Bro. Stan Sweeney PM. The meeting was well attended and most of the brethren remained to enjoyed an excellent meal and harmony. On Thursday 12th October, Bro. 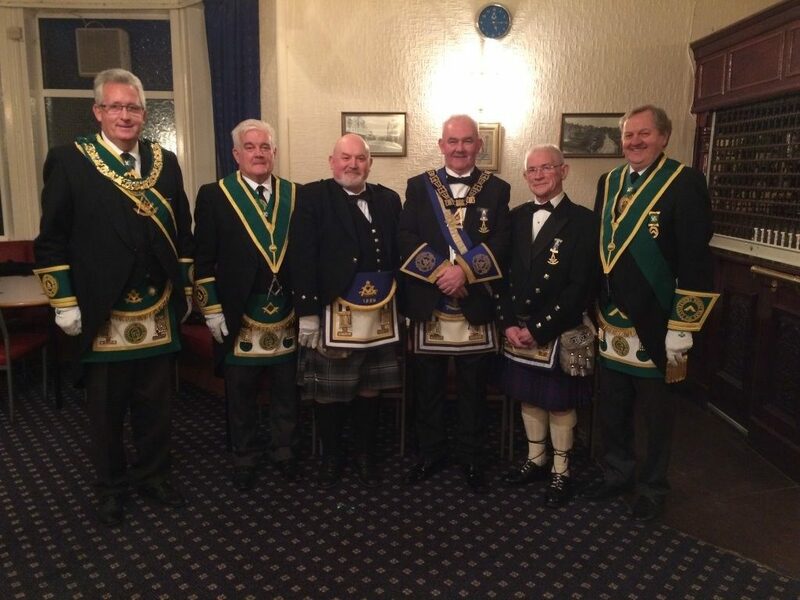 Bill Perry PGM visited Lodge Blantyre Kilwinning No. 557 and joined the deputation from Lodge St. Thomas No. 306, which was headed by RWM, Bro. Robert Cook. The RWM of 557, Bro Gary Mitchell gave a warm welcome to the Brethren who formed the deputation and presented RWM Bro. Robert Cook with the Lodge Gavel to conduct the FC Degree. The ritual was performed to the highest of standards by the Brethren from Lodge St. Thomas and Bro. Andrew Walker, RWM of Lodge Livingstone Stonefield No. 599 paid tribute to their excellent work. Prior to the meeting being concluded, Bro. Ian Faichney was awarded Honorary Membership of 557 for his great support of the Lodge over a number of years. On Monday evening, 9th October, RWM Bro. 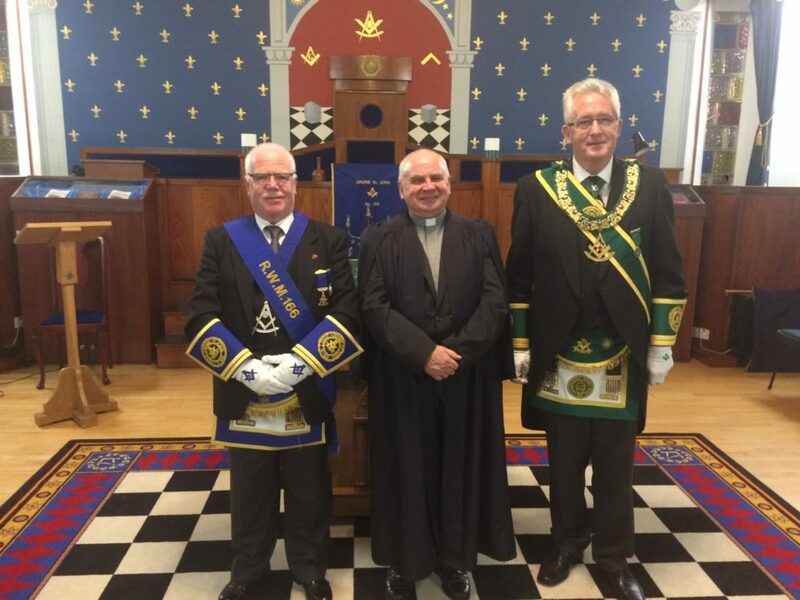 Iain Keltie and the Brethren of Lodge New Monkland Montrose No. 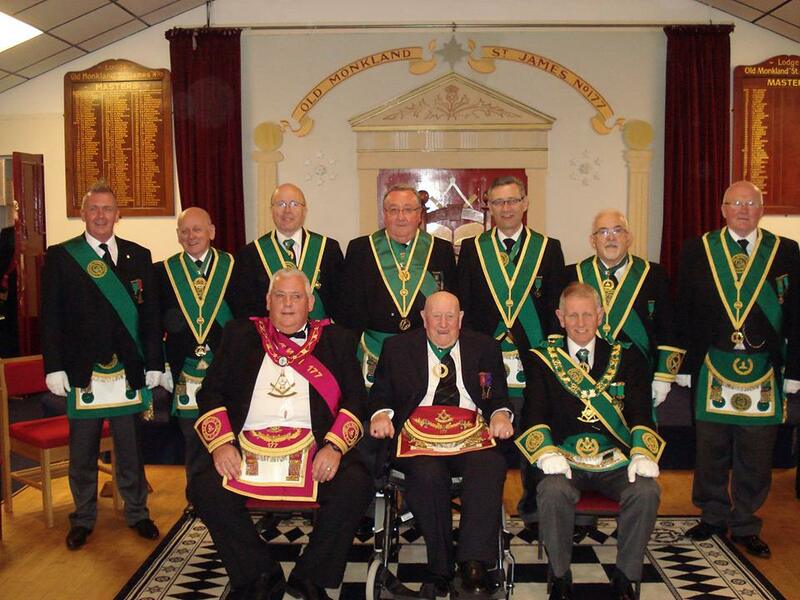 88, welcomed RWM Bro. 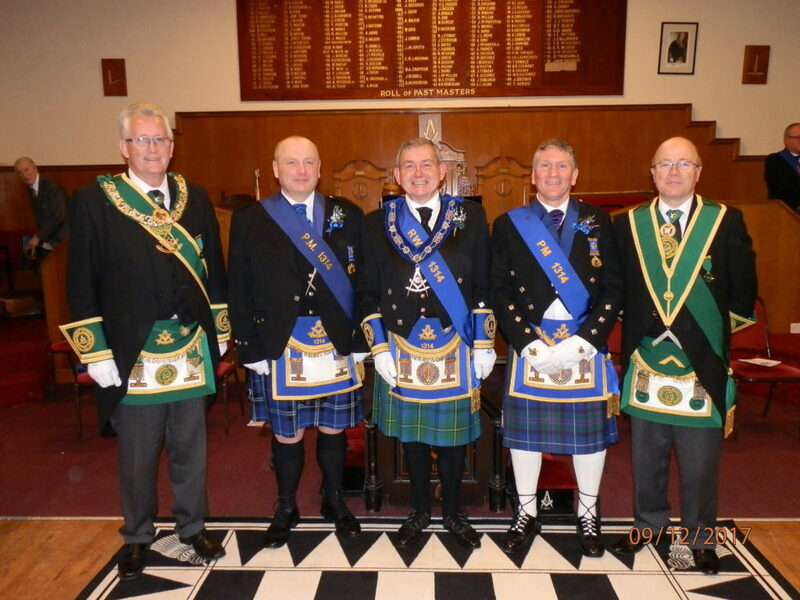 Derek Beaton and the members of Lodge Robert Burns No. 440, who had been invited to confer an EA Degree. The degree to Initiate the Candidate, Jim Burns, was carried out to a very high standard by the Past Masters and Office Bearers of 440. Lodge Coltswood No. 1067 were also present and collected the “Travelling Gavel”. 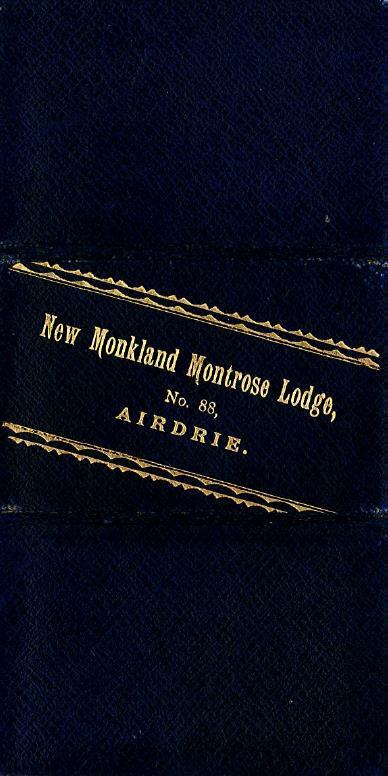 Following the close of the Meeting, the Brethren enjoyed the usual Lodge New Monkland Montrose hospitality. Willie Scott RWM 233, Bill Perry PGM, Jim Burns, Iain Keltie RWM 88, Derek Beaton RWM 440, Donnie McLeod RWM 1067. 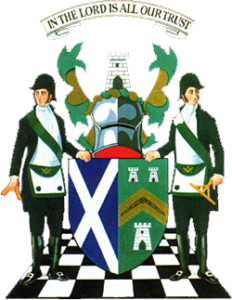 On Sunday 8th October, Lodge Robert Burns No. 440 held their Annual Divine Service at St. Andrews Church, Baillieston. RWM, Bro. Derek Beaton welcomed everyone and thanked them for their attendance, which included Bro. Bill Perry and a large deputation from Provincial Grand Lodge. The service being conducted by Rev. Neil Galbraith. At the conclusion of the service, the congregation retired to the Lodge for some light refreshments. Derek Beaton RWM, Rev. 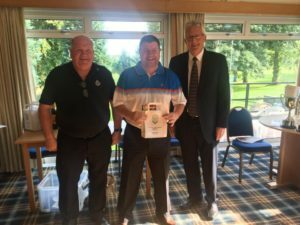 Neil Galbraith, Bill Perry PGM. 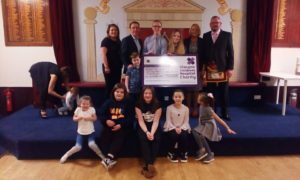 The Lodge presented a cheque for £16,150 raised from this year’s Boxing event to Aileen McConnell and Gary Donlin of Yorkhill Children’s Hospital Charity Foundation. Bro. 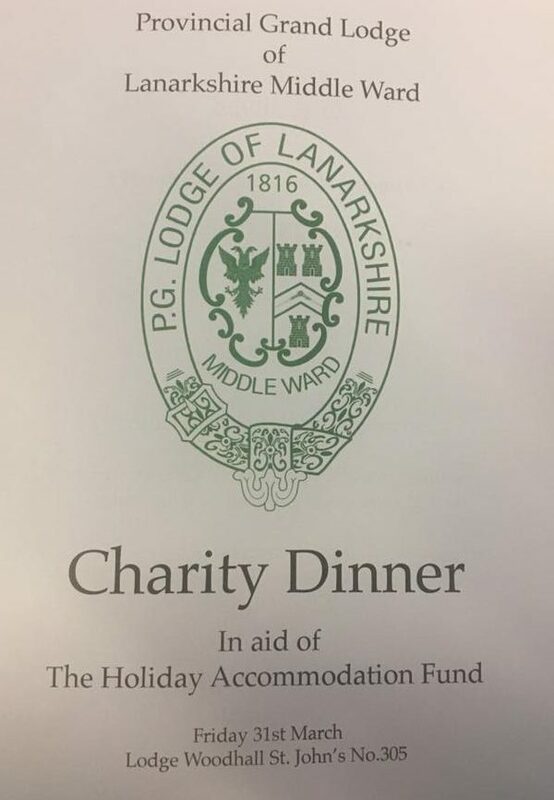 Allan Logan PM and the committee have put so much hard work into organising these events and this has taken the total raised by the Lodge to a phenomenal amount of £157,000 . As PM Allan commented this would not have been possible with the support of the Brethern, friends and families supporting these events over the past 10 years, a note they would like made public thanking each and every one of you for your kindness and support throughout the years . Bro. 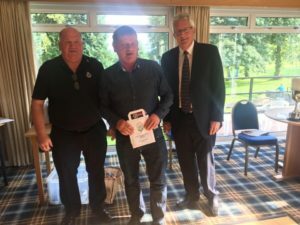 Graham Reid PM thanked Allan and his committee for the amount of work that had been put in by them and that it has left a legacy for his late son David, he would have been so proud to see the help being given to other people just like himself. Lodge Airdrie St. John No. 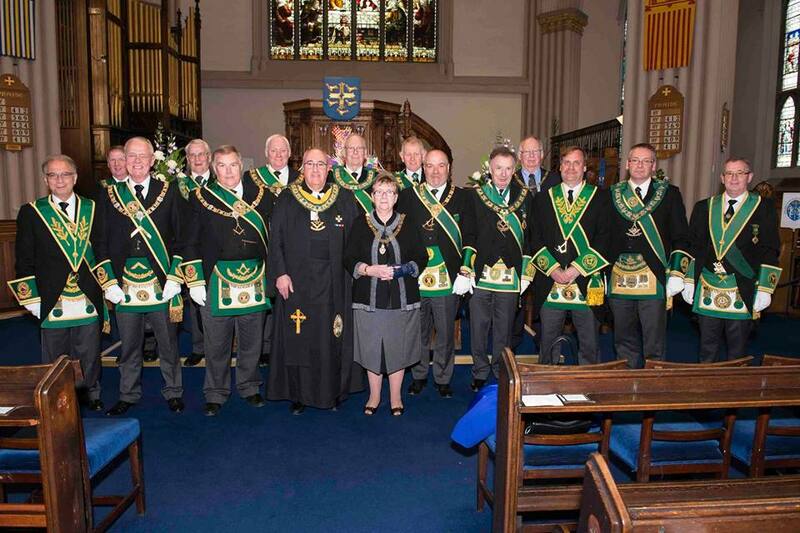 166 held their Annual Divine Service on Sunday 1st October in the Temple, Broomknoll Street, Airdrie. RWM, Bro. James Stewart gave a warm welcome to everyone present, which included the PGM Bro. Bill Perry and a large deputation from Provincial Grand Lodge. Rev. 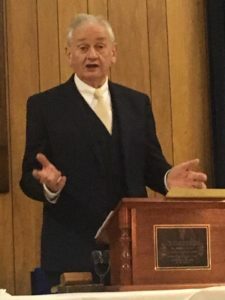 Bill Jackson, the minister of New Monkland Parish Church once again conducted the Service on behalf of the Lodge and was thanked by the RWM for the excellent sermon and choice of hymns. At the Regular Meeting, Bro. William Miller PM was awarded Distinguished Service Membership of the Lodge.Bro. 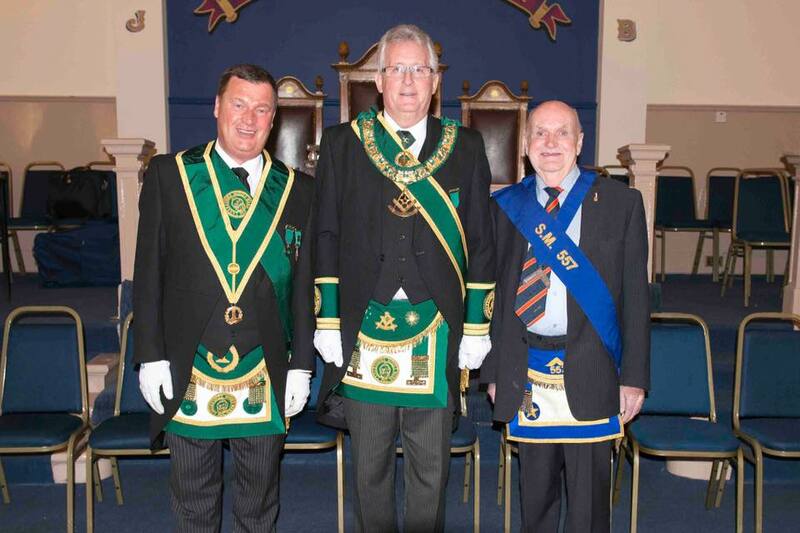 Bill Perry PGM and a large Deputation from Provincial Grand Lodge were invited by RWM Bro. Robert Cook to assist in the Presentation. The PGM gave a comprehensive account of the service given by Bro. 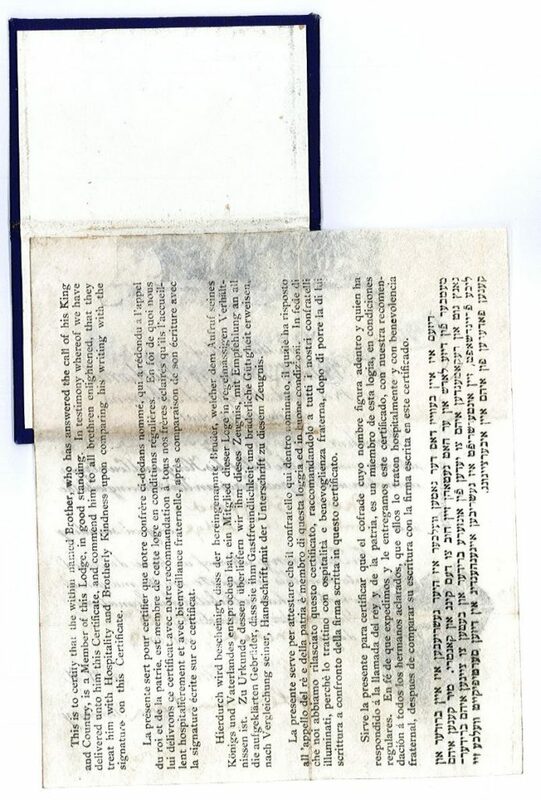 Miller to his Lodge over many years and in replying, Bro. 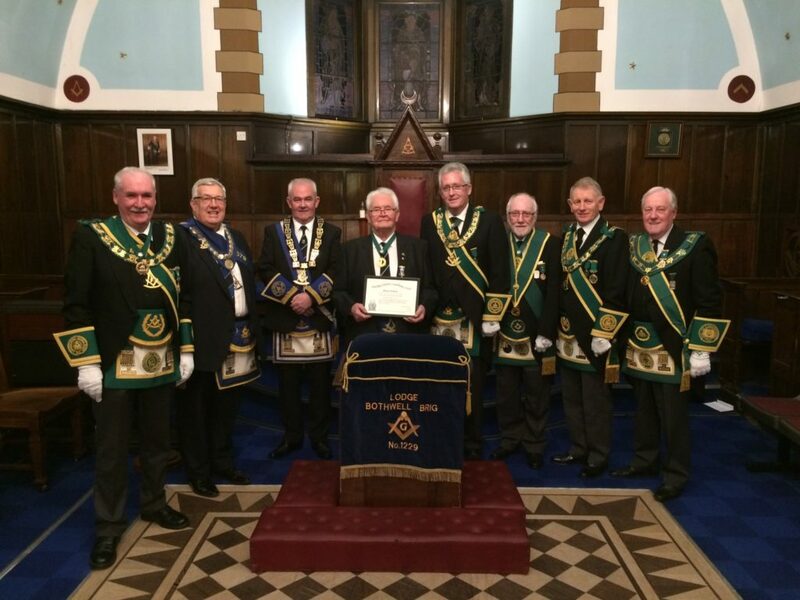 Miller thanked the RWM and Brethren of 306 for this honour. The Presentation being completed, RWM Bro. 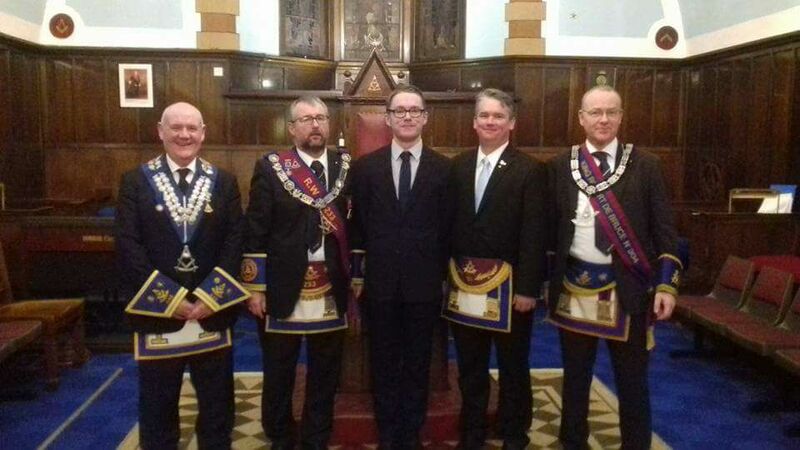 Stephen Campbell and the Brethren of Lodge St. Enoch No. 1288 conferred an excellent FC Degree. Bro. Stephen Campbell, Bro. Robert Cook, Bro. William Miller, Bro. Bill Perry, Bro. George Kelly. Bro. Bill Perry PGM together with Bro. Norman Carnegy SPGM, attended . Bro. Billy Buchanan RWM extended a warm welcome to all who were present. Following the opening of the Lodge, the RWM and the PGM had the pleasure of presenting Bro. 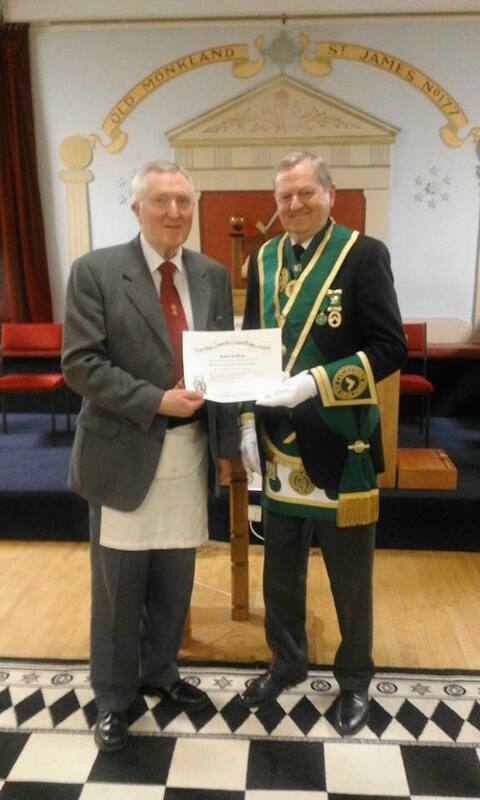 William Mason PM with his certificate and lapel badge to mark Bro. 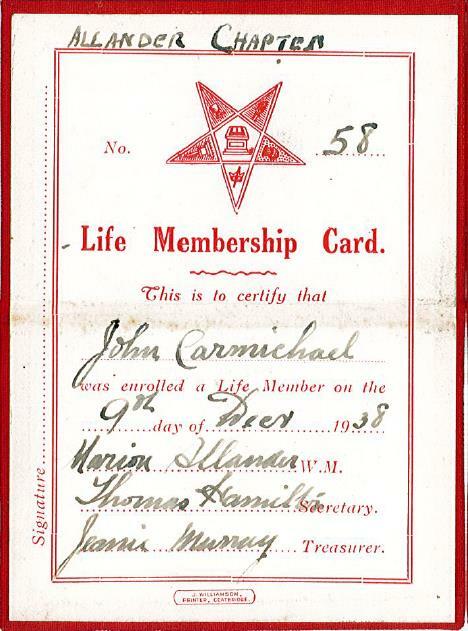 Mason’s 60 years membership of the Craft. Bro. Mason thanked the Lodge for the presentation and gave the Brethren a very interesting insight to some of his memories over the past 60 years. Also in attendance was a RWM Bro. 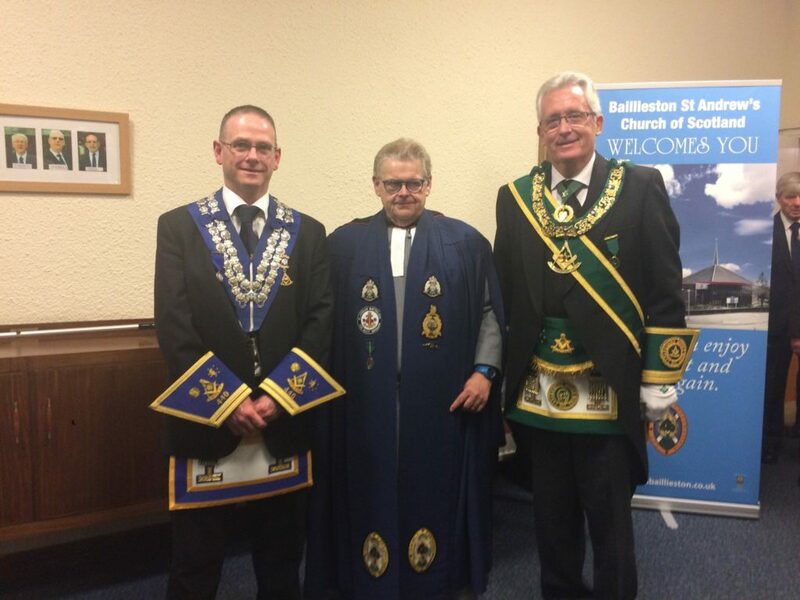 Ian Keltie and a deputation from Lodge New Monkland Montrose No. 88 who took the opportunity to claim the Travelling Gavel. Bro. Ross Goldie RWM extended a warm welcome to the Brethren present. 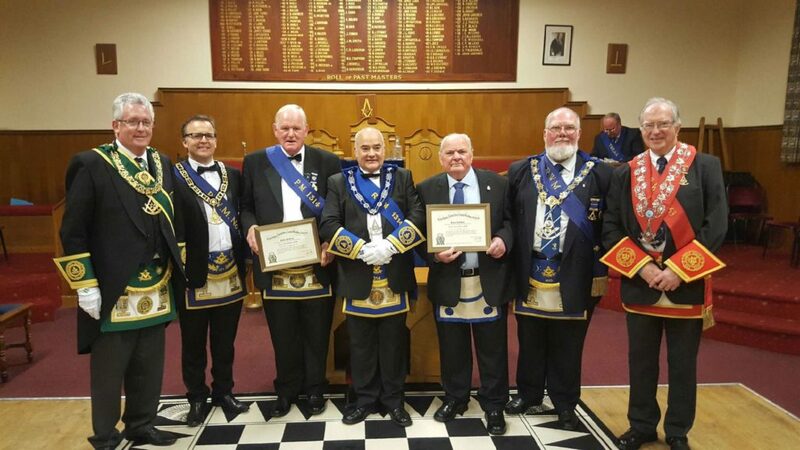 A deputation from Provincial Grand Lodge were invited to the meeting to participate in the presentation of 50 year Certificates to Bro. Willie Gilchrist PM and Bro. Hugh Murray PM. Both Brethren were thanked by the RWM for the service to the Lodge and the Craft and along with the PGM, Bro. Bill Perry, presented them with the Certificates and lapel badges. 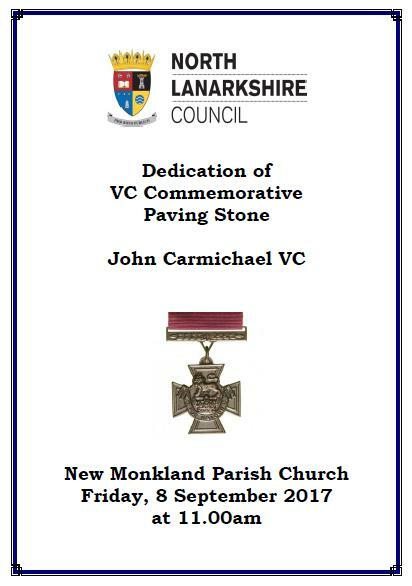 8th September 2017 – World War 1 hero Brother John Carmichael VC honoured with a memorial paving stone in his hometown of Glenmavis, Airdrie. 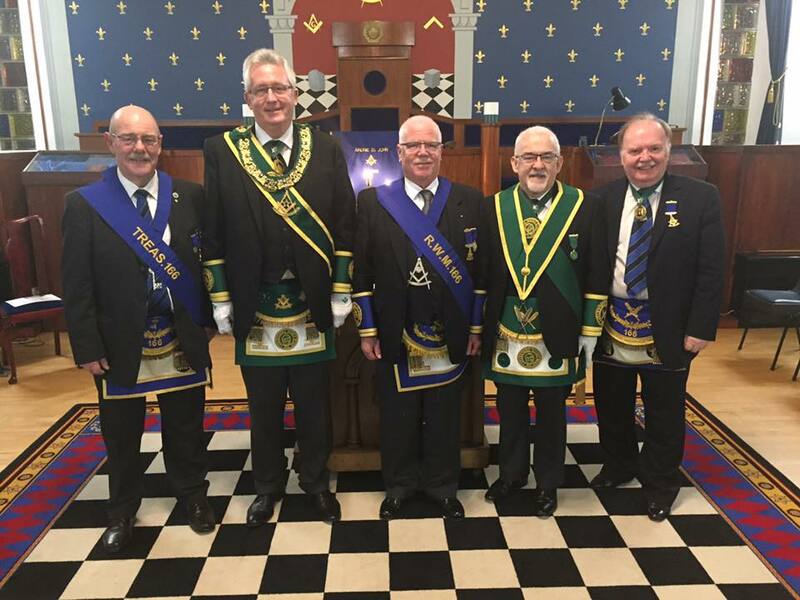 PGM Bro Bill Perry accompanied by SPGM Alex Kelly, DOC Tom McCrone & PM Stuart Jack of Lodge St. Bryde No. 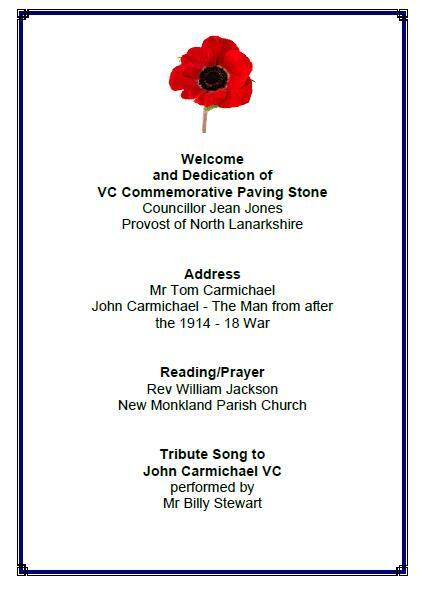 579 along with representative of local Lodges attended a memorial service for Brother John Carmichael VC, a member of Lodge New Monkland Montrose No. 88. 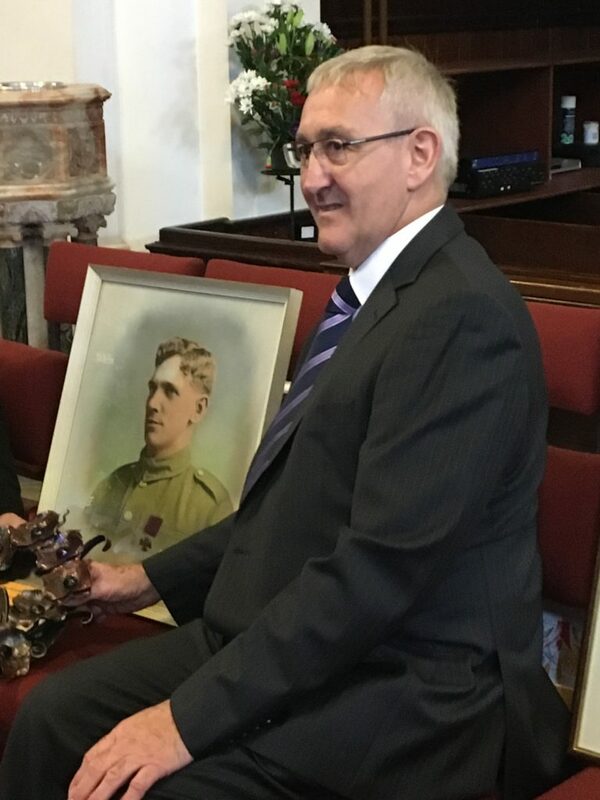 The Lanarkshire soldier earned his medal for outstanding bravery and sacrifice during the Great War 1914 – 1918 and a commemorative paving stone has been placed in his home town providing a lasting legacy within his local community. 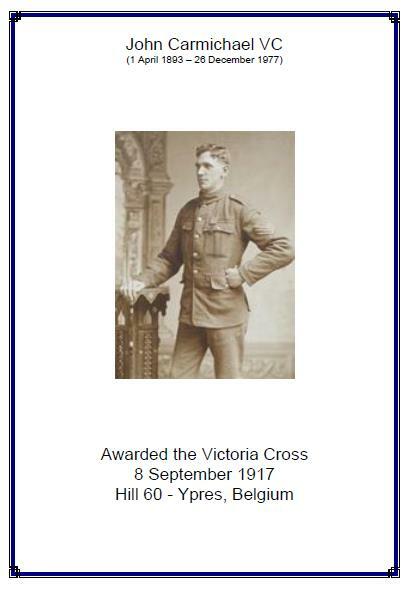 John Carmichael was awarded his medal following his heroic actions at Zwarteleen, Belgium on 8 September 1917. 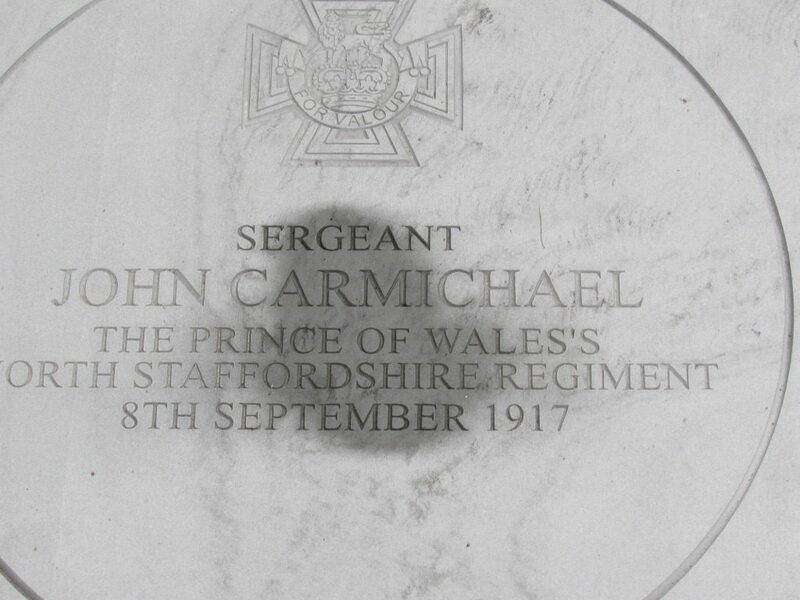 Sergeant Carmichael prevented life threatening danger to his fellow soldiers when a grenade was ready to explode in the trench they were in. John put his steel helmet over the grenade and then stood on top of the helmet. The grenade exploded, blowing him out of the trench causing him serious injuries, but his heroic actions ensured no one else was hurt. John died in December 1977. 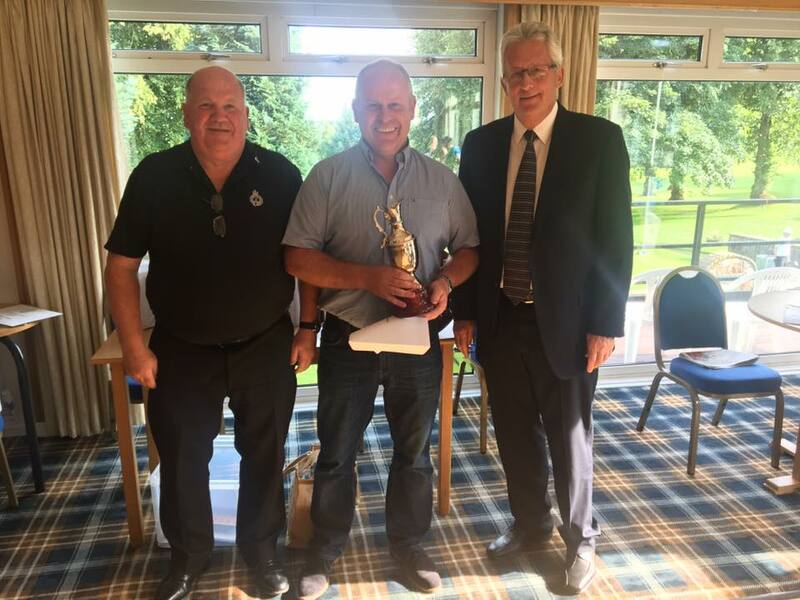 The annual PGL of Lanarkshire Middle Ward golf tournament was held at Drumpellier Golf Club on Sunday 20th August. The sun was shining and considering the recent rain the course was is great condition. The winner of the overall and Amicoil trophy was Bro. Garry Spiers of The Operative Lodge of Airdrie No. 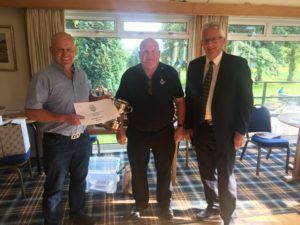 203 with 42 points, with Lodge 203 also winning the overall team prize.The trophies were presented by RWPGM Bill Perry assisted by the event organiser Bro. 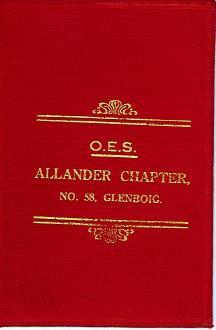 John Gardiner of the Operative Lodge of Airdrie No. 203, who did a fantastic job organising the day. 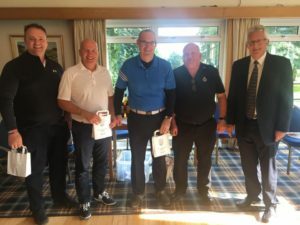 Provincial Grand Lodge of Lanarkshire Middle Ward would like to thank the Commitee, members, bar and catering staff of Drumpellier Golf Club for the use of the course and facilities once again. During the summer months the Lodge Caldercruix St. John No. 1314 held their annual sponsored walk in aid of local charities. 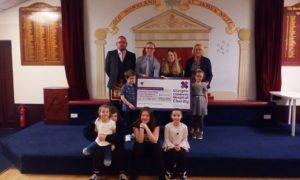 They raised a total of £1,300 and donated £200 to each of these well deserving causes, Airdrie Hospice, Parkinson’s, Maggies, Moira Anderson Foundation, Hope for Autism and The Erskine Hospital as well as a donation of £100 to The PGL Caravan Fund. Great effort and giving to these deserving charities. 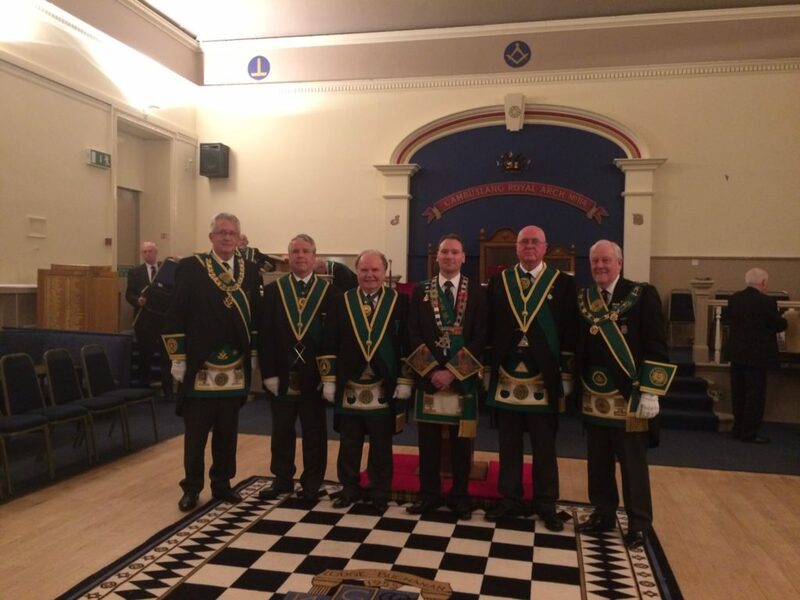 Prior to the summer recess Lodge Airdrie St. John No. 166 held its’ annual ‘Live Entertainment Charity Day’ that saw a full house being enthralled by a large number of Cabaret acts who agreed to perform free of charge at the event. 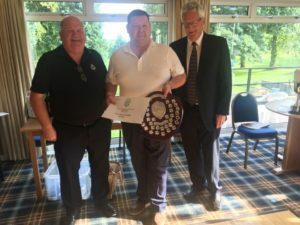 As well as the entertainment the audience participated in an auction with varied items donated by a large number of Lanarkshire businesses and organisations. At total of £3,116 was raised, what a great effort. The Lodge are indebted to Bro. 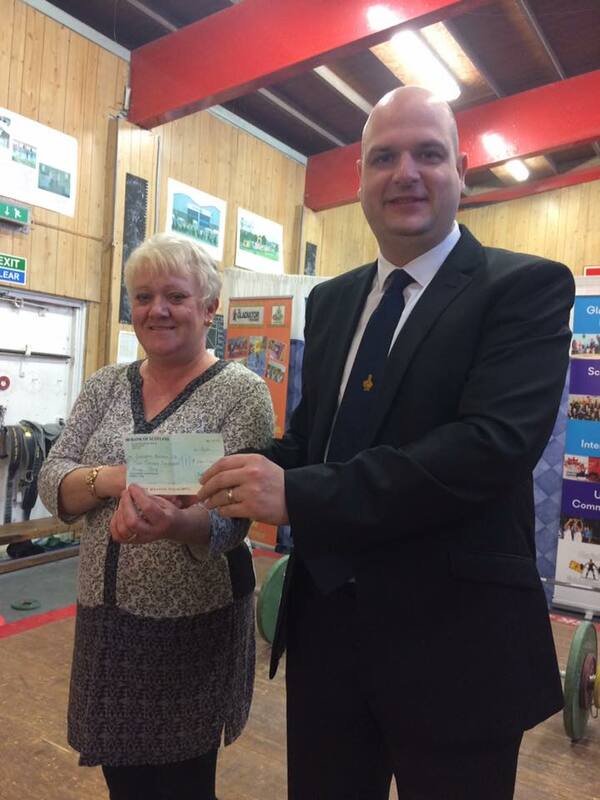 Jackie Lang for organising the event and he is seen here presenting the proceeds of the event to the RWM Bro. James Stewart. The fundraising proceeds have been added to the Lodge Charity Fund and these will be presented to a number of Charity organisations at the Lodge Annual Charity Cheque presentation evening. We have World Champions in our Province ? 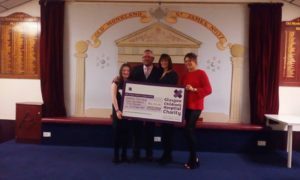 A cheque for £3359.72 was presented to REACH Lanarkshire Autism by Lodge Bothwell Brig No. 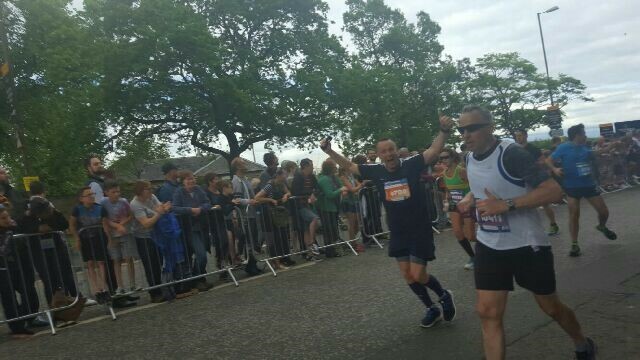 1229, Bro Capt David Johnston IPM ran the Edinburgh Marathon and raised funds after being inspired by Thomas Downey who is holding the cheque. Thomas is pictured with his grandfather and uncle Brothers Gerry Furlong PM and John Furlong PM. Bro Capt David Johnston IPM, Thomas Downey who is holding the cheque, Brothers Gerry Furlong PM and John Furlong PM. Bro.Bill Perry RWPGM attended the AGM and Nomination of Office Bearers for 2017 – 2018 of Lodge Meridian No. 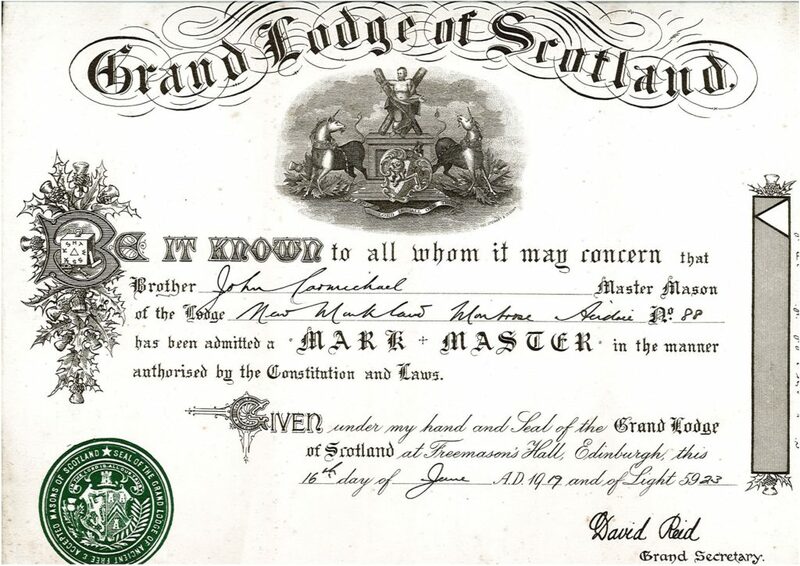 1779 where Bro William Lang PM was nominated as RWM elect for the ensuing 12 months, the Installation will be held at Masonic Temple, Gardenside Street, Uddingston G71 7BX, September 12th at 1pm. Bros. Andrew D Millar DPGM and Alex R Kelly formally represented our PGL at the installation of Bro. 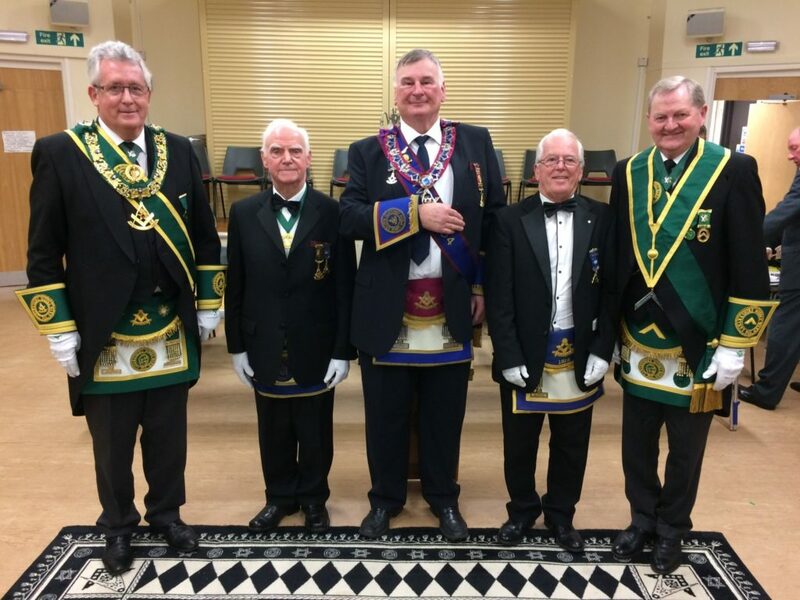 Russell Logan RWPGM and his commissioned officebearers. Bro. W Spencer PG Committee Member also attended. In addition Bros. Tom Davidson and Tom McCrone attended with the Grand Lodge deputation. 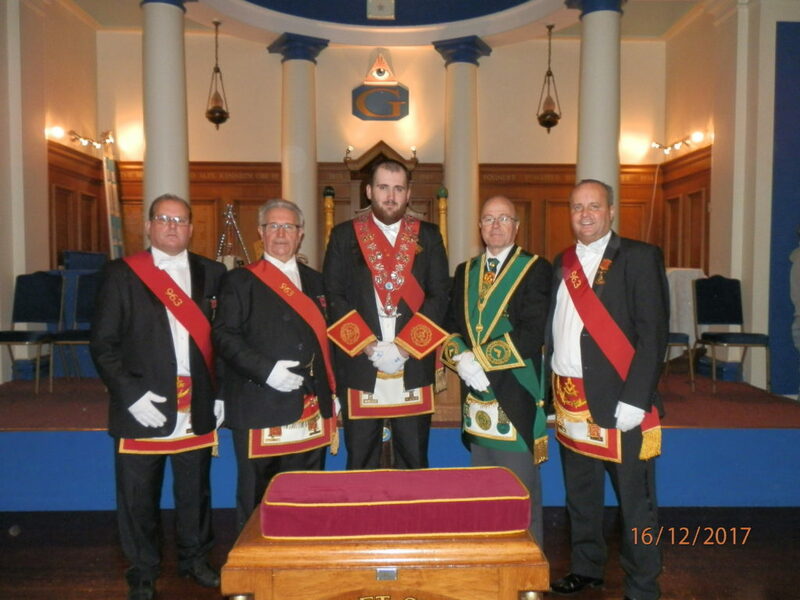 The installation was carried out by Bro. 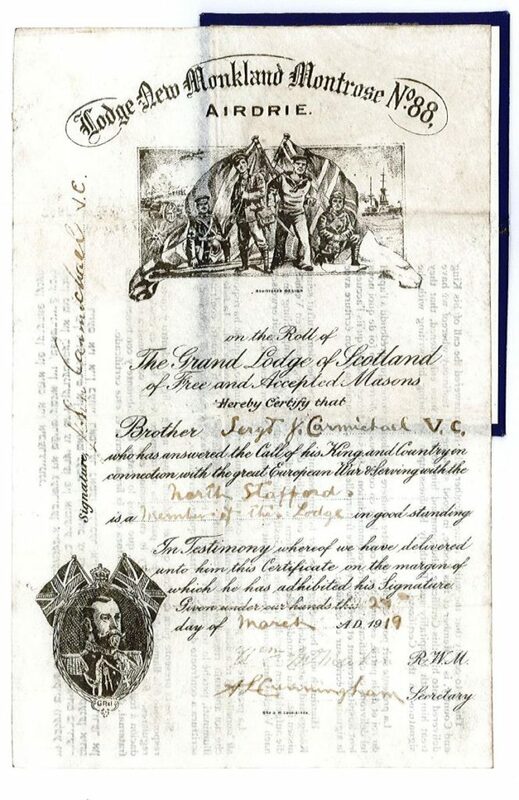 Charles Iain Robert Wolrige-Gordon or Esslemont, MWGMM in the tightly packed, splendid premises of Lodge Scoon and Perth No.3. Bro. Russell Logan RWPGM is originally from Airdrie. 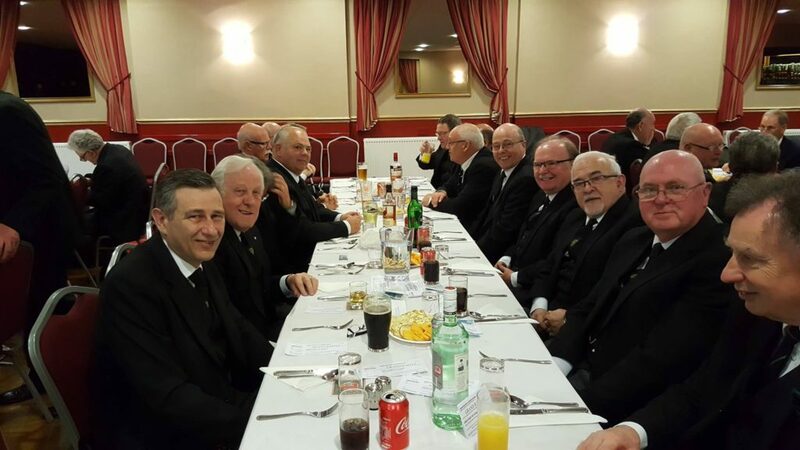 After the meeting the brethren retired to dinner at the Dewar Leisure Centre where they were well looked after by the brethren of PGL Perthshire East. 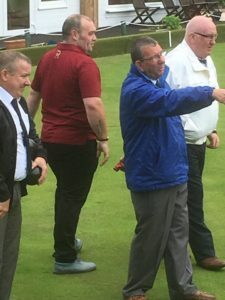 A great day was had by all and the weather was kind to all who attended, so far a magnificent sum of £1160 has been raised for the Masonic home. Bro. 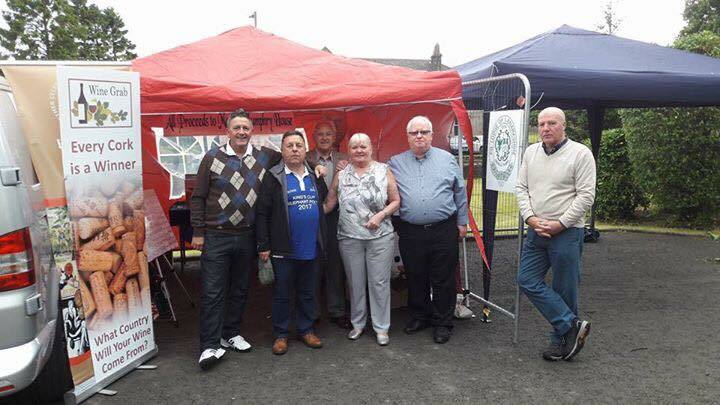 Bobby Ferguson headed the fundraising accompanied Bro.Tommy Reid and his wife Margaret who prepared and managed the wine tombola, everyone was a winner with the Gallon whisky football card won by Bro. McIndoe, Lodge New Monkland Montrose No 88. The stall alone raising over £1160 and Bro. Bobby and Tommy are looking to expand the fundraising profile and discuss with PGM their next big idea. 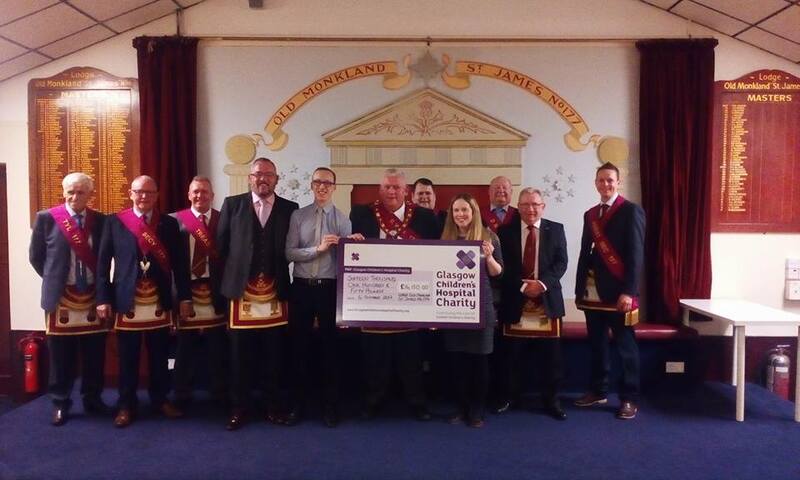 A great big thank you to all the lodges and individual brethren in the Lanarkshire Middle Ward for their donations of wine, this made it such a successful day, the fundraising and Marcus Humphrey House team really appreciate all your assistance and support. Thanks go out to all teams who took part, making it a fantastic day, in particular to Bro. Brother Andrew Crichton of Lodge Robert Burns No. 400 for his tireless efforts arranging and administering the event. 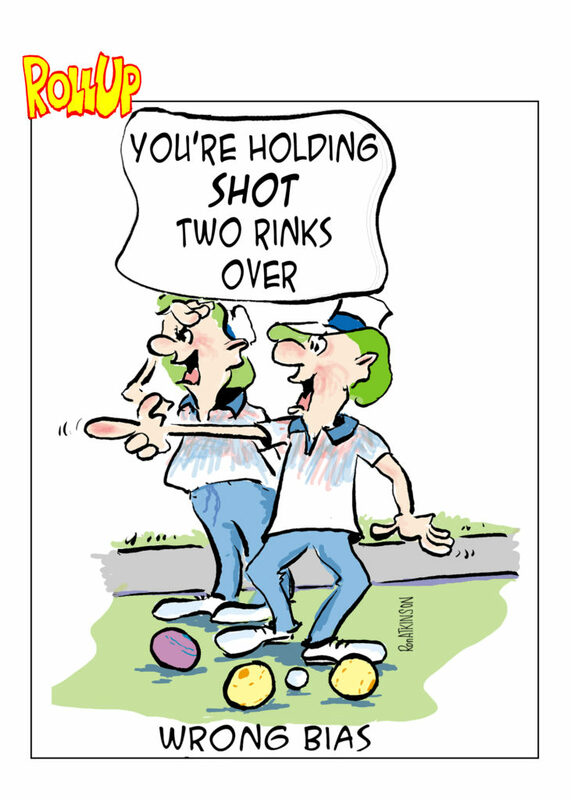 Provincial Grand Lodge would also like to thank Coatdyke bowling club for the use of the rink and their hospitality. Bros. Stephen Campbell and Angus Ross formally represented our PGL at the installation of Bro. 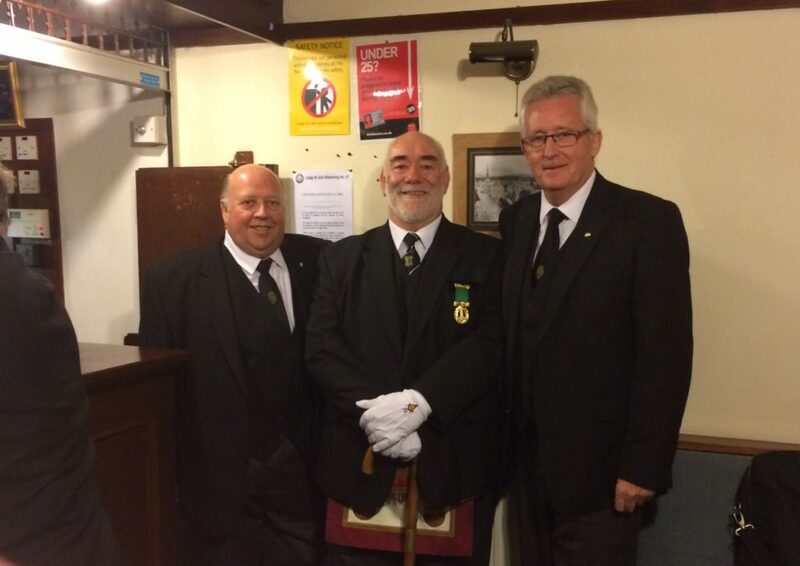 Stewart Quigley’ RWPGM and his commissioned officebearers. In addition Bros. George Kelly, Jim Jack, Tom Davidson and Tom McCrone attended with the Grand Lodge deputation. 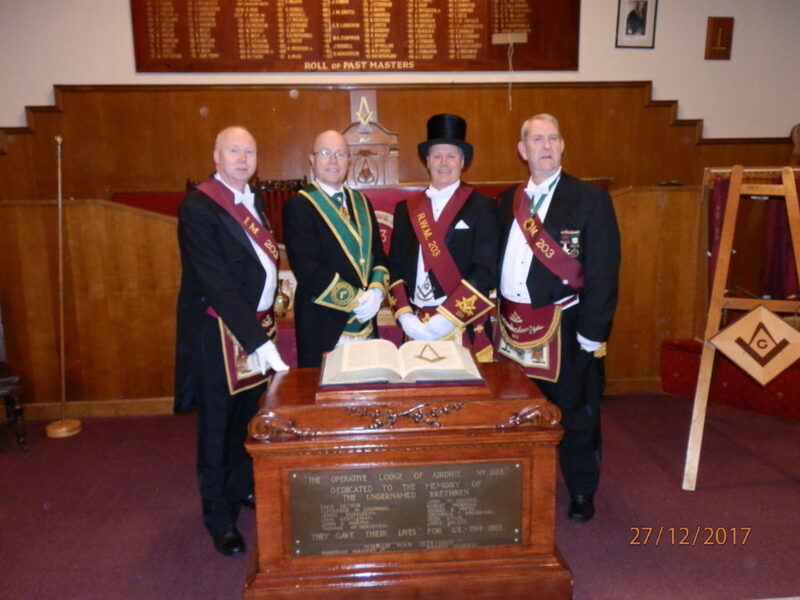 The installation was carried out by Bro. 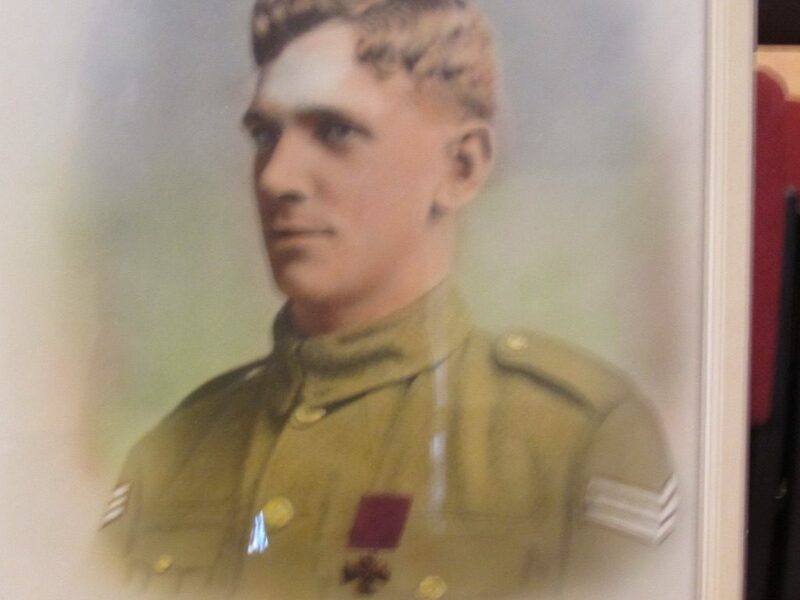 Charles Iain Robert Wolrige-Gordon or Esslemont, MWGMM assisted by his RWDGM and RWSGM. After the meeting the brethren retired to dinner. This was a very special meeting for Lodge Coltswood No.1067 in Glenboig. An evening during which they would receive a large deputation of visiting brethren from Lodge Fidelite Occitane No.1067 and other lodges of the Grande Loge Nationale Francaise headed by Bro. Christian Henri Bonzi, PGM of the PGL of Terres de Temple. Bro. Donald MacLeod, RWM of Lodge Coltswood No.1067 further welcomed a deputation from Lodge St. Bryde No.579 headed by their RWM, Bro. Bryce Morrison. 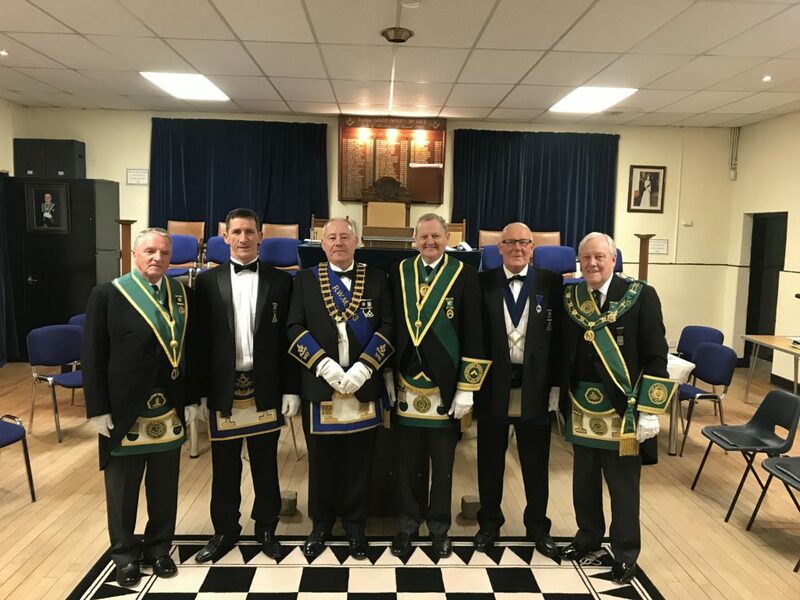 Lodge St. Bryde No.579 had been invited along to carry out a Fellowcraft Degree later in the evening, this was carried out in a very expert manner. 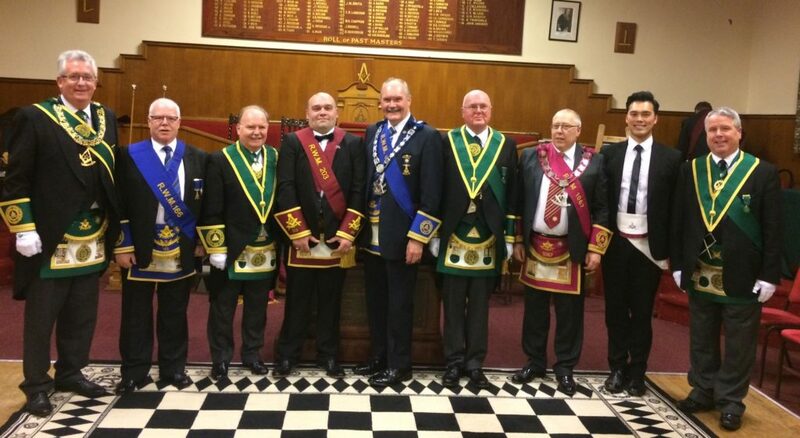 Also in attendance were deputations from PGL Lanarkshire Middle Ward headed by Bro. Tom Davidson IPPGM and a deputation from the Grand Lodge of Scotland headed by Bro. 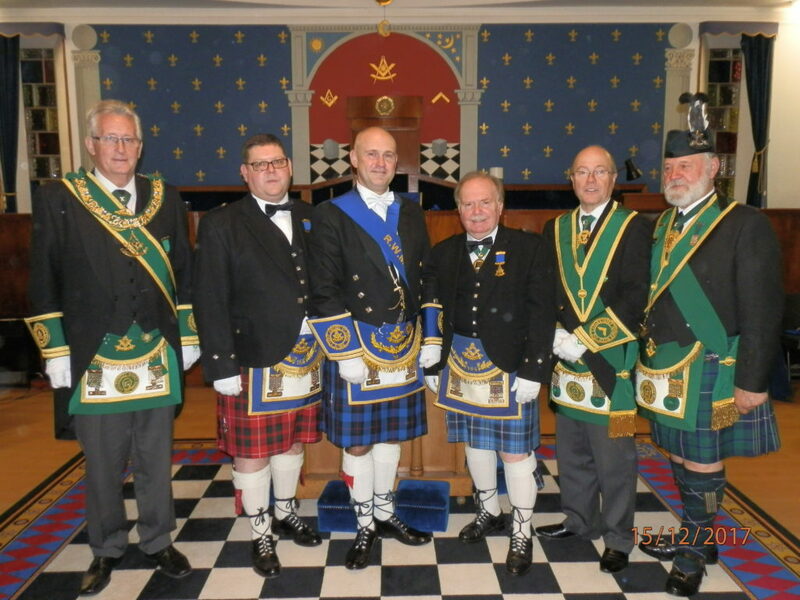 Ramsay McGhee, RW Depute Grand Master who was accompanied by senior members of Grand Lodge. 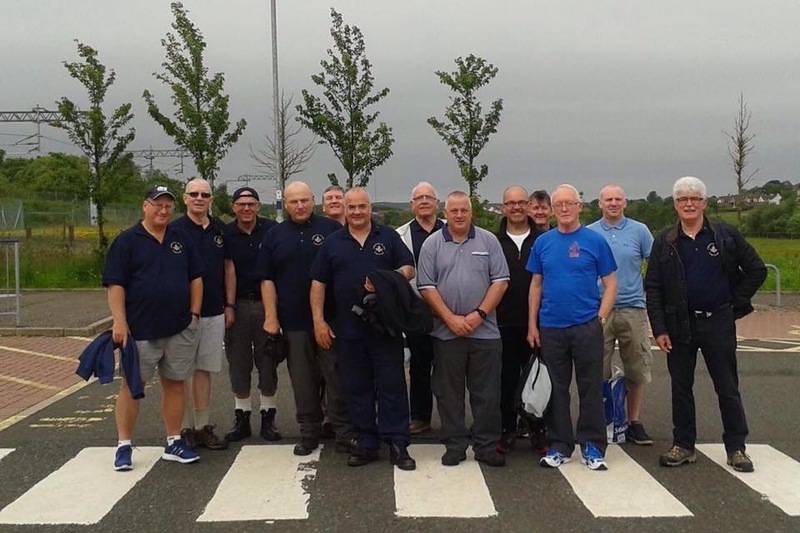 Lodge Coltswood No.1067 and Lodge Fidelite Occitane No.1067 have built a close relationship over a number of years with annual visits occuring in both Scotland and France. The lodges, with support from their respective Provincial Grand Lodges, were meeting tonight to sign a formal twinning agreement and charter between the lodges. 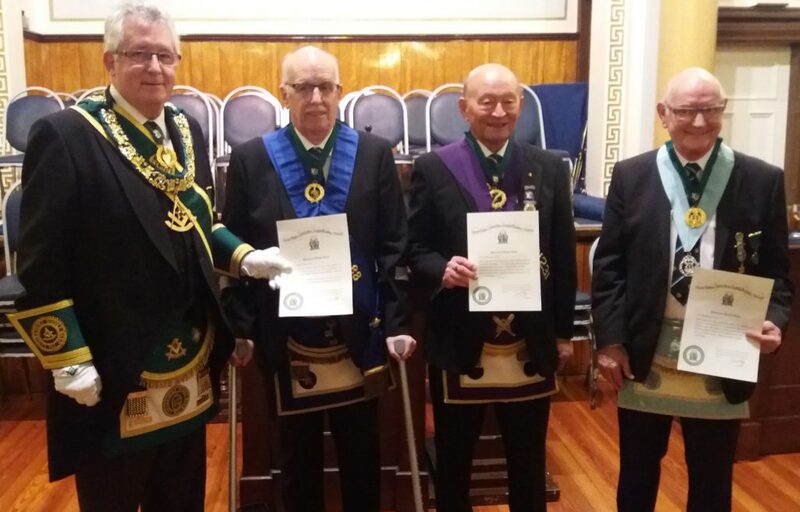 Following the twinning ceremony and the Fellowcraft Degree the RWM invited the IPPGM to transact the special business on behalf of Provincial Grand Lodge. Bro. 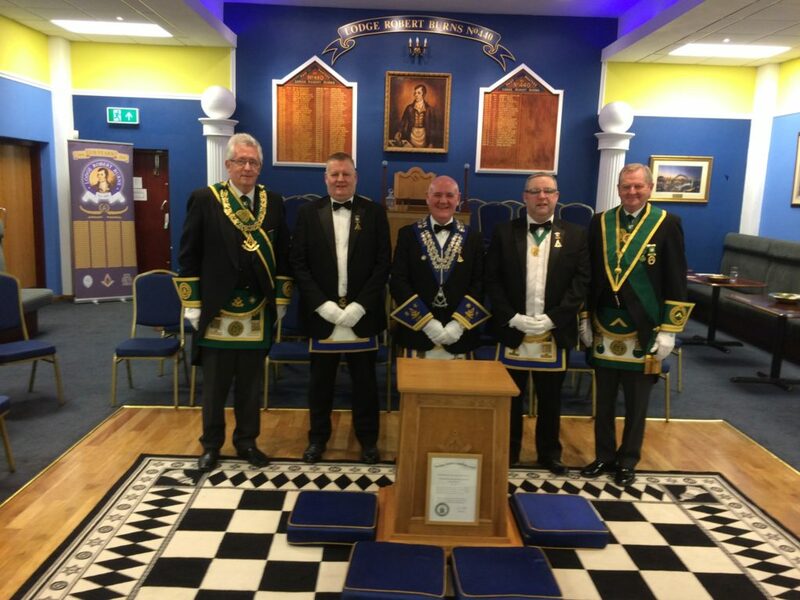 Christian Bonzi was presented at the edge of the carpet , offered and accepted Honorary Membership of PGL Lanarkshire Middle Ward. The Depute PGM was invited to present Bro. Bonzi with a glass plaque as a token of the growing relationship between the two provinces. Bro. Bonzi suitably replied. Following the meeting the brethren were joined by the French and Scottish ladies and all enjoyed an excellent harmony and a very extensive buffet meal. A great night was had by all. Congratulations to Lodge Coltswood No.1067 for their initiative and organisation of a very full week-end for their visitors. The week-end culminated in a golf match between the Scottish and French brethren. A veil will be pulled over the exact result, however the infamous term “nil point” was heard and not in reference to the Scots. Bro. 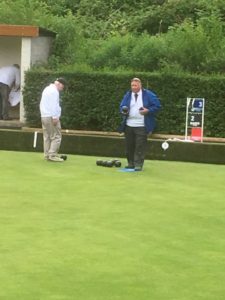 Christian Bonzi, the Provincial Grand Master of PGL Terres de Temple finds his ball in a difficult lie during the golf match between the visiting brethren from France and the team representing Lodge Coltswood, Glenboig No.1067. A deputation from PGL attended a special meeting of Lodge Old Monkland St. James No.177 organised to honour Bro. 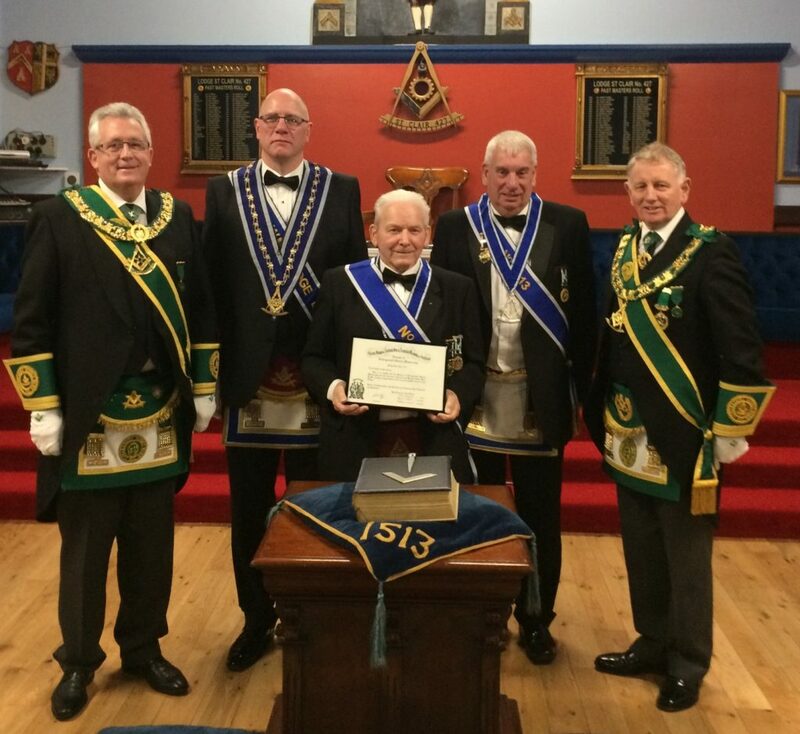 James Wood PM and present a diploma to mark his 70 years of service to the lodge. Bro. William Buchanan RWM welcomed the deputation into the lodge.The deputation was headed by Bro. Tom Davidson IPPGM and included Bros. Stewart Wood PDPGM, Norman Carnegy and Stephen Campbell SPGMs, Bill Craig PG Secretary, Peter Ball PPG Chaplain, Robert Stanfield PPGSW and Gordon Currie PG Committee.The RWM invited the IPPGM to address the brethren and make the presentation of the diploma. 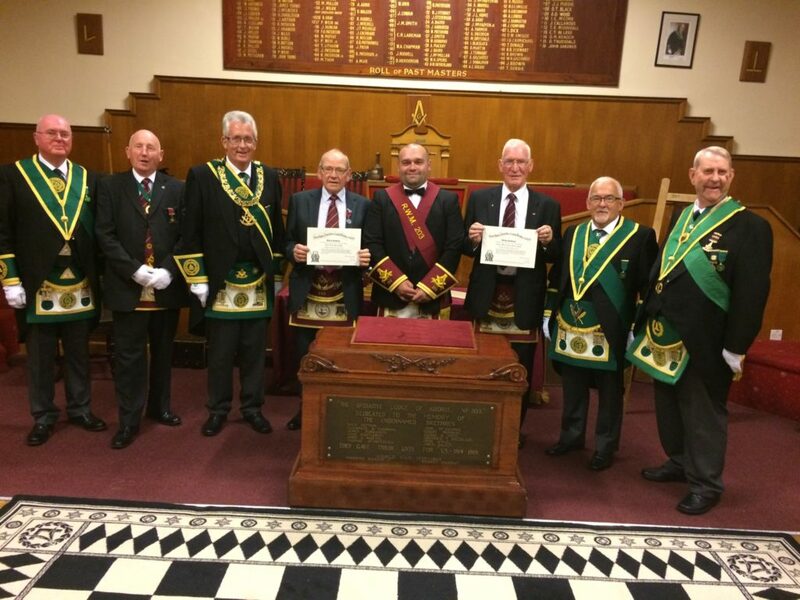 The lodge DOC presented Bro. James Wood PM at the edge of the carpet. The IPPGM was assisted by Bro. Stewart Wood PDPGM in informing the brethren of the extensive masonic service of Bro. James Wood PM over his 70 years.Bro. James Wood PM was then surprised when the IPPGM announced that he was also to receive Distinguished Service Membership of the lodge.The IPPGM invited Bro. William Buchanan, RWM and Bro. Stewart Wood PDPGM to join him in presenting the diplomas and congratulating Bo. James Wood PM who later suitably addressed the brethren.The brethren retired to enjoy a buffet meal in the lodge. Following the meeting the lodge presented a generous cheque to the IPPGM for the PGL Holiday Accommodation Fund. Bro. Tom Davidson IPPGM and his wife Joyce represented the province at the Summer Ball of PGL Renfrewshire West. 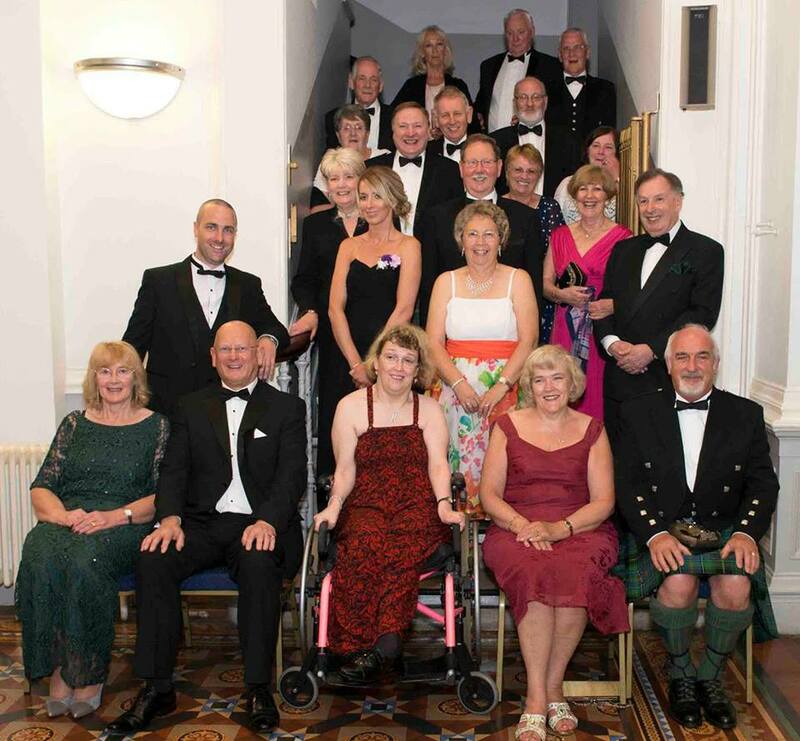 The Ball was held in the Town Hall in Greenock and was hosted by Bro. Jim Livingstone PGM. On a very warm evening in Inverclyde, a warm welcome was extended to all the brethren and guests attending the annual Provincial Summer Ball. Guests were welcomed from the Provinces of Argyll and the Isles, Ayrshire, Dunbartonshire, Glasgow, Lanarkshire Middle Ward and Stirlingshire. 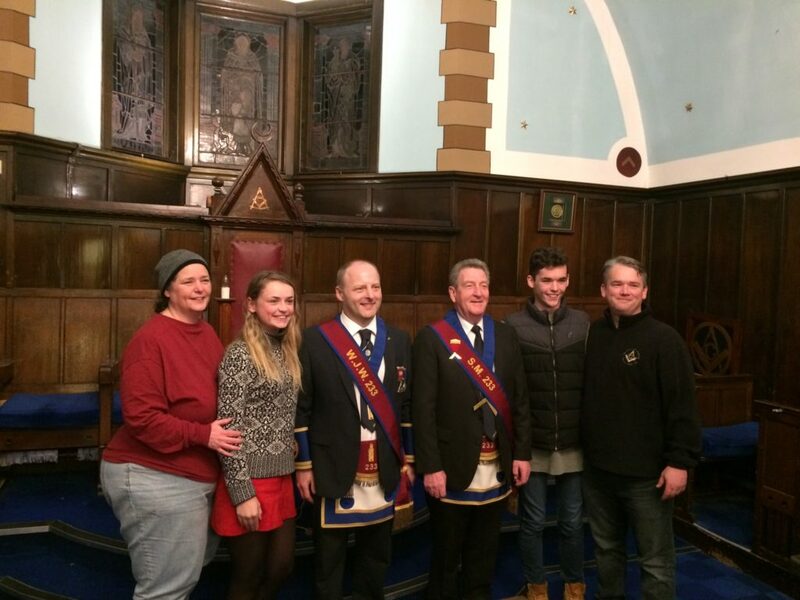 The PGM welcomed special guests, Margaret McGowan and Keira McCarthy representing Reach for Autism, Inverclyde. Reach for Autism is the PGL Charity for this year and during the evening the charity representatives were presented with a cheque for £10,000. A great evening was had by all with an excellent meal followed by the dance to the music of a 17 piece big band. 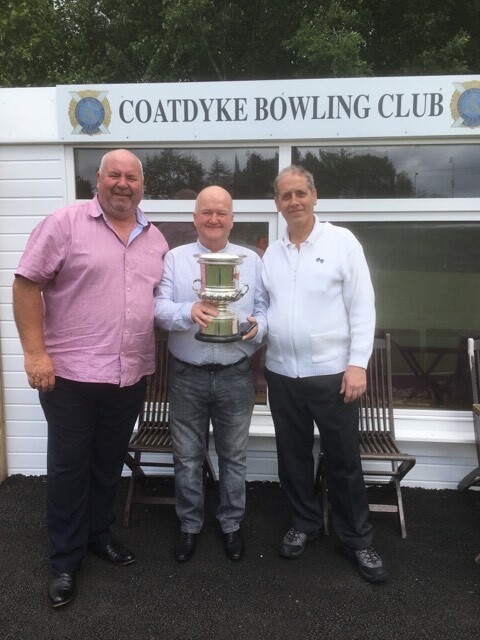 The Annual Provincial Grand Lodge of Lanarkshire Middle Ward, Robert King Stewart Bowling Competition shall take place on the 24th June 2017, at Coatdyke Bowling Club, time slots to be confirmed to the lodges bowls convenor (time slots shall be 10am and 1pm). 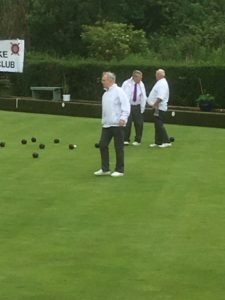 The game shall be a triples consisting of 15 ends.Entry fee, £10 per team to be sent along with the tear off slip on the correspondence sent to Lodge secretaries last week. Any cheques being sent should be made payable to, Provincial Grand Lodge, Any donations will be gratefully received. All completed slips and entrance fees to be received no later than 16th June 2017. Bro. 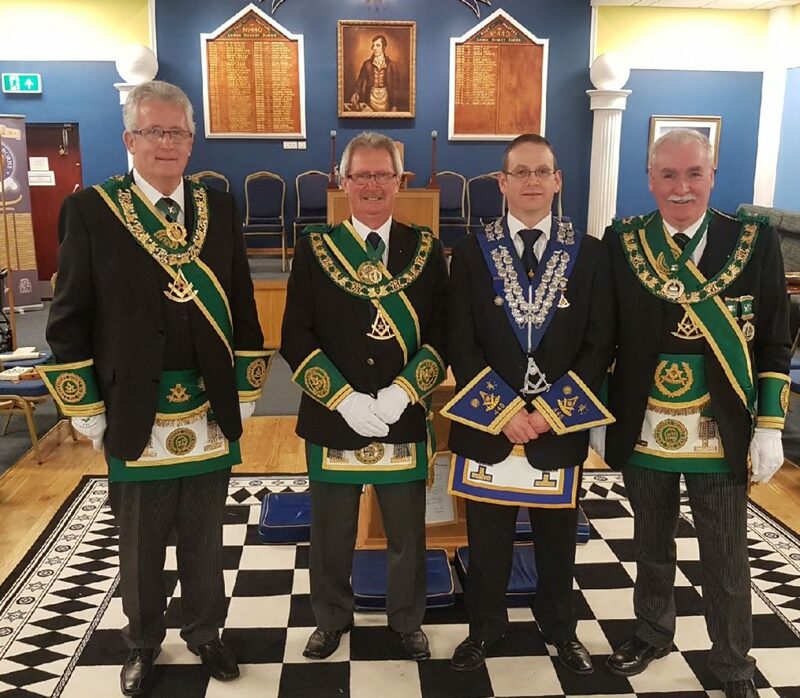 Stephen Campbell, SPGM headed a deputation from PGL Lanarkshire Middle Ward into Lodge Meridian No.1779 for their annual visit. The deputation also included Bros. Tom Davidson IPPGM, David Steele PPGSW, and members of PG Committee David Brocket and John Anderson. After the formal business the deputation witnessed an emulation of a Fellowcraft degree by the lodge officebearers. Lodge Meridian No.1779 is unique in the province in that it is a daylight lodge and only meets during the spring and summer. 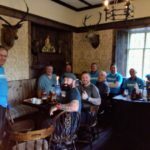 Meeting are held at the Masonic Temple at Gardenside Street, Uddingston at 1pm on the second Tuesday of the months of April through September. In the photo are the members of the deputation along with Bro. Alex R Kelly, RWM of the lodge. 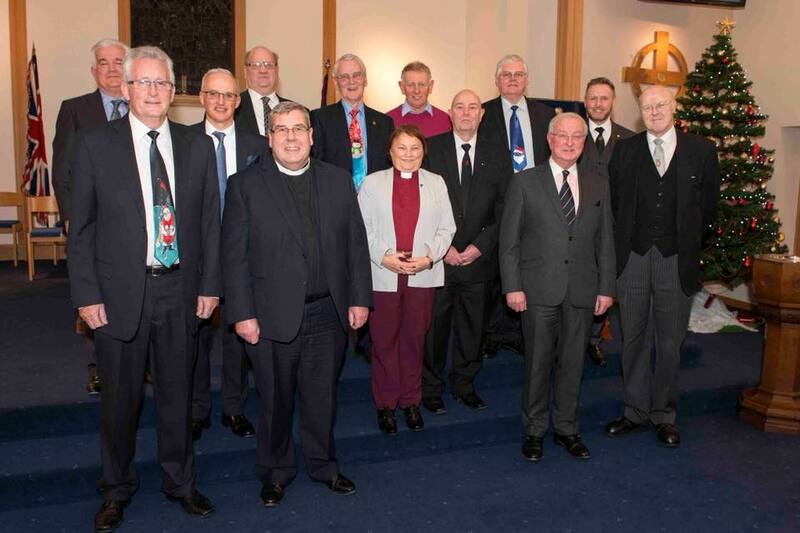 On Friday evening, a large deputation of commissioned office-bearers and elected office-bearers from our province attended the Installation of Office bearers of our sister province PGL Lanarkshire Upper Ward. They witnessed an excellent installation and later joined the brethren for dinner and harmony. 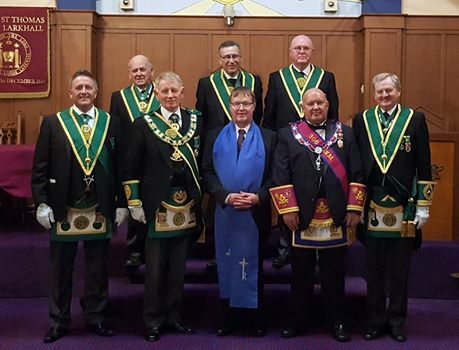 The deputation comprised Bros. Tom Davidson IPPGM, George Kelly PPGM, Andrew D Millar DPGM, Norman Carnegy SPGM, Angus Ross SPGM, Stephen Campbell SPGM, Bill Craig PG Secretary, Jim Ferguson PG Senior Chaplain, Jim Vasey PG Junior Chaplain, Tom McCrone PG DOC and Billy Spencer. Congratulation to all the new office-bearers of PGL Lanarkshire Upper Ward. 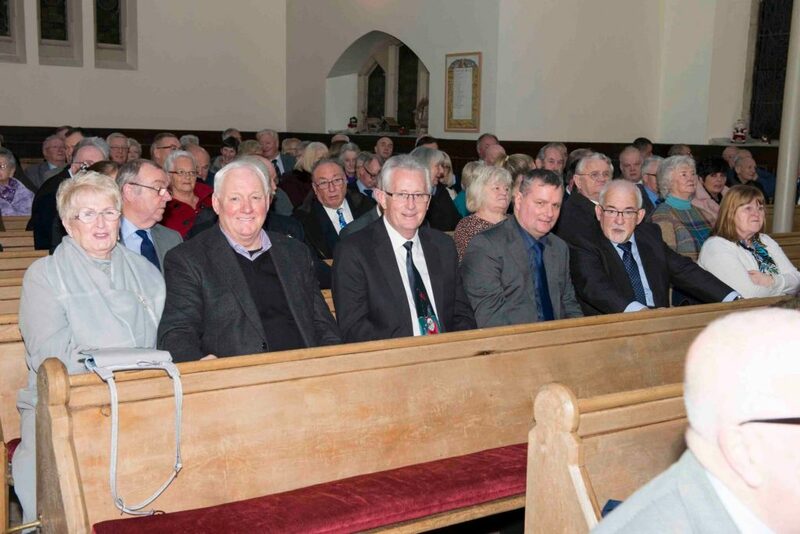 About 200 Freemasons and friends attended The Annual Divine Service organised to mark the Bicentenary of the Provincial Grand Lodge of Lanarkshire Middle Ward. The service was held in The Old Parish Church, Uddingston which has been most supportive over the last decade in hosting these special services. The brethren in attendance were again made most welcome by the minister and members of the church. Regrettably Bro. Bill Perry, RWPGM, was unable to attend due to illness, prayers were offered for his quick recovery to full health. The service was conducted by the Rev Fiona McKibbin who delivered a thought provoking sermon. Readings were by Bros. James O Ferguson PG Senior Chaplain and Gordon McCaffer PG Treasurer. 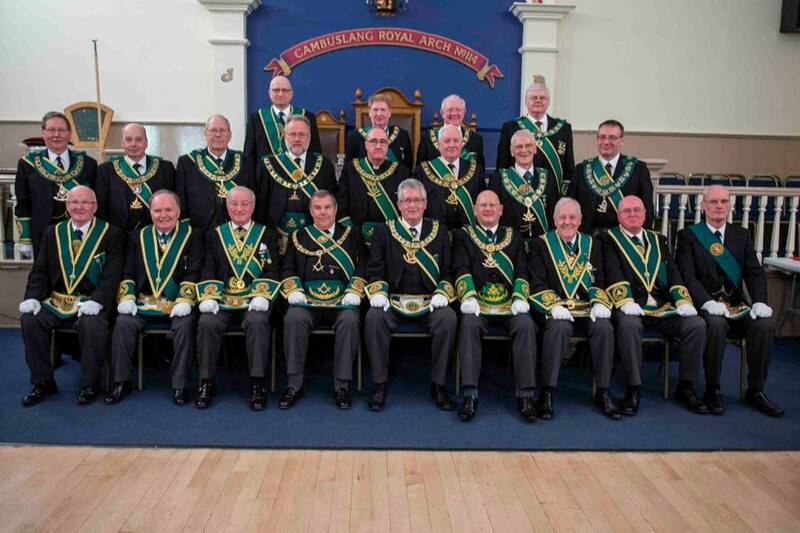 The province was well supported by sister Provincial Grand Lodges and the other Masonic orders within Lanarkshire. Following the service the brethren, guests and members of the congregation retired to the church hall where they shared fellowship and tea and coffee. 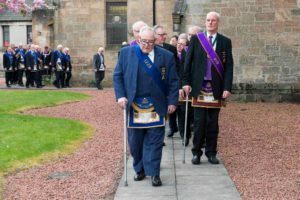 Bros. Tom Davidson IPPGM and Norman Carnegy SPGM represented the province at the Annual Divine Service of the District Grand Priory of Strathclyde at St. Mary’s Church in Kirkintilloch. The service was conducted by Rev. Mark E Johnstone and the readings were by the Right Eminent Frater Robert S M Stewart and Venerable Frater Robert D McWhannel. Bro. Tom Davidson, IPPGM headed a large deputation from PGL Lanarkshire Middle Ward into Lodge Major Ness No.948 where they were welcomed by Bro. Andrew Buchanan, RWM. 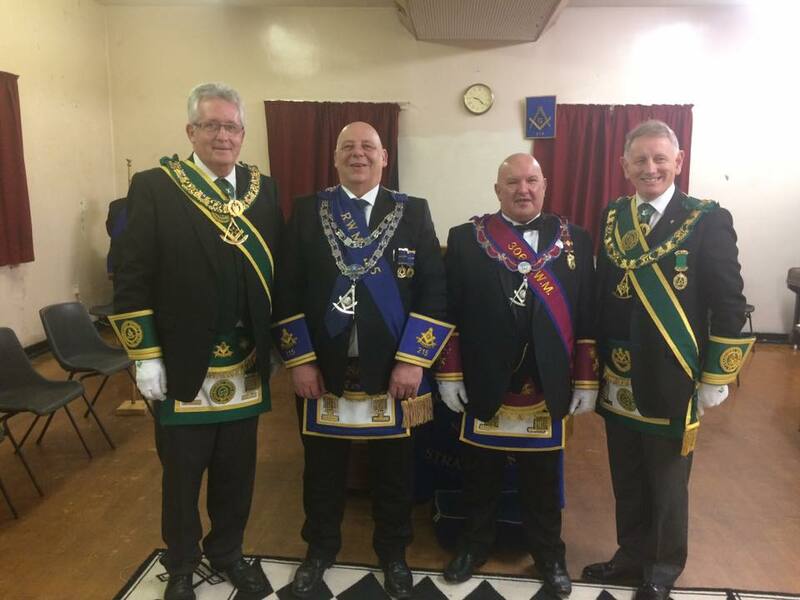 The deputation had attended to support the lodge and assist in the presentation of 3 No. 50 year Jubilee Certificates. 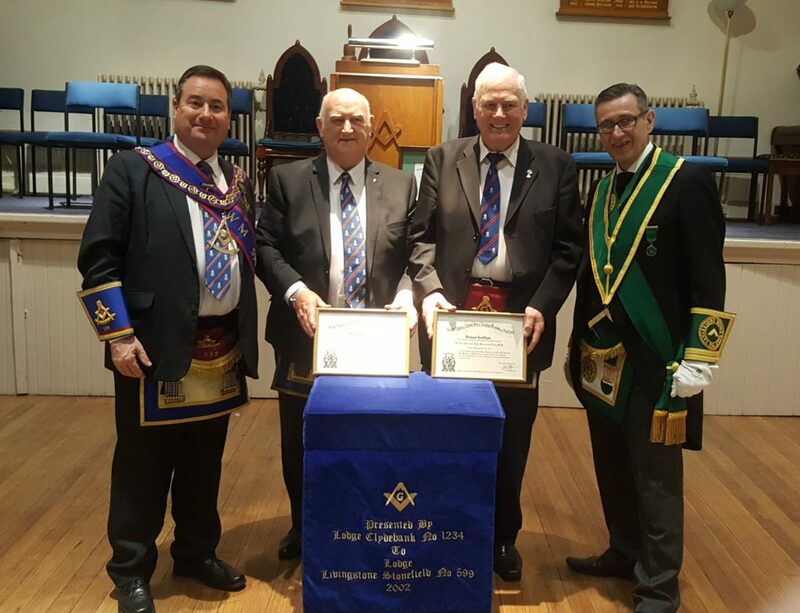 Certificates were presented to Bros. Roy Evans (PM), George Wright and David Stark who had all now reached the landmark of 50 years membership of the lodge. Bro. Andrew Buchanan, RWM addressed the three brethren before asking the IPPGM to continue with the presentation. Bro. Colin Stark, PM Secretary gave a detailed account of the brethren’s individual service to the lodge. A large deputation from PGL Lanarkshire Middle Ward headed by Bro. 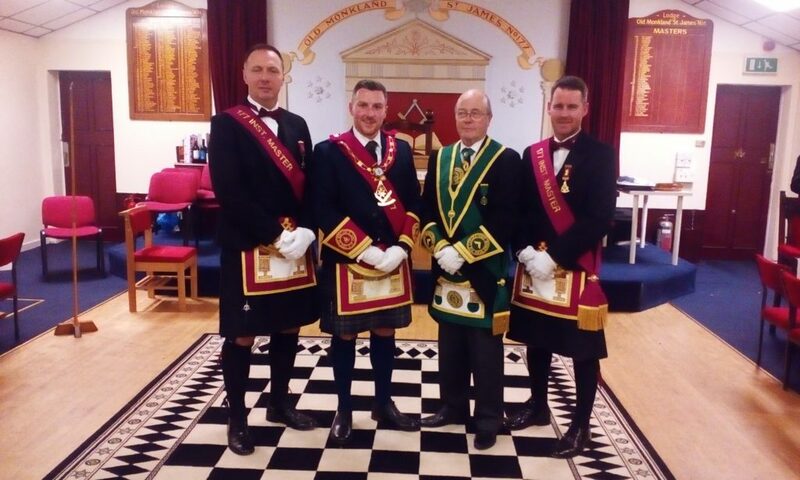 Tom Davidson IPPGM joined the brethren of Lodge Hamilton Kilwinning No.7 and Lodge Hamilton No.233 for their annual joint divine service in the evening at Hamilton Old Parish Church. The service was conducted by Rev. Ross Blackman. Readings were delivered by the RWMs of both lodges, Bro. 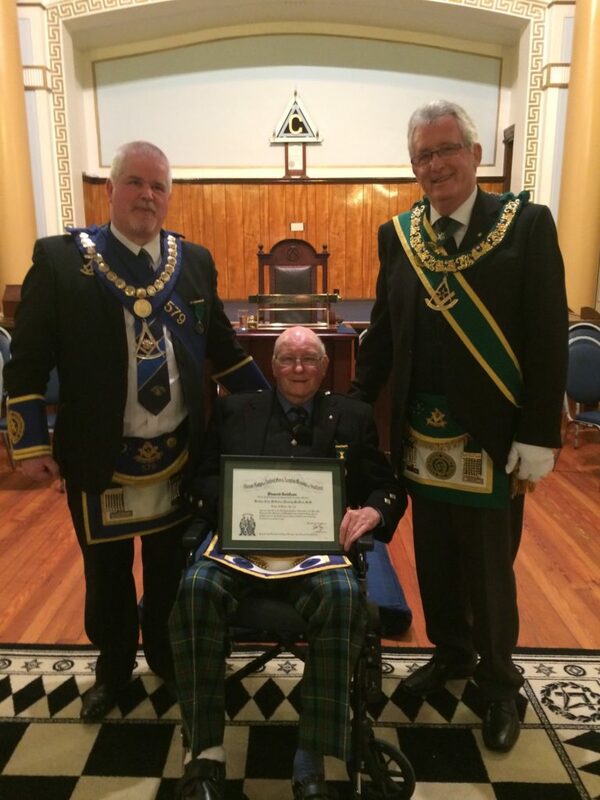 John A Anderson (Lodge Hamilton Kilwinning No.7) and Bro. Alexander Watson (Lodge Hamilton No.233). 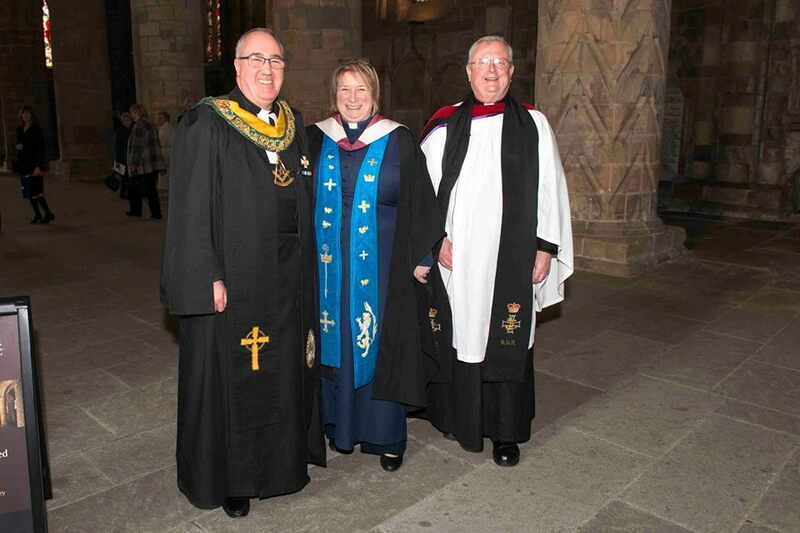 Bros. Tom Davidson, IPPGM and Andrew S Millar DPGM represented the province at the annual divine service of PGL of Fife and Kinross at Dunfermline Abbey. The service was very well attended and is the last in the commission of the Bro. Rev. Andrew E Paterson RWPGM. The service was conducted in the historic surroundings of the abbey by Rev. 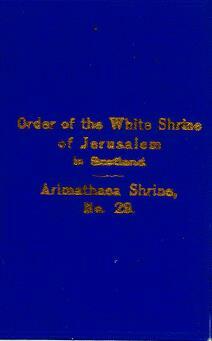 Mary Ann R Rennie (Minister of Dunfermline Abbey), Rev. Andrew E Paterson RWPGM and Rev. Canon J J Morrow (The Lord Lyon, King of Arms and Past Grand Master Mason) who delivered the sermon. 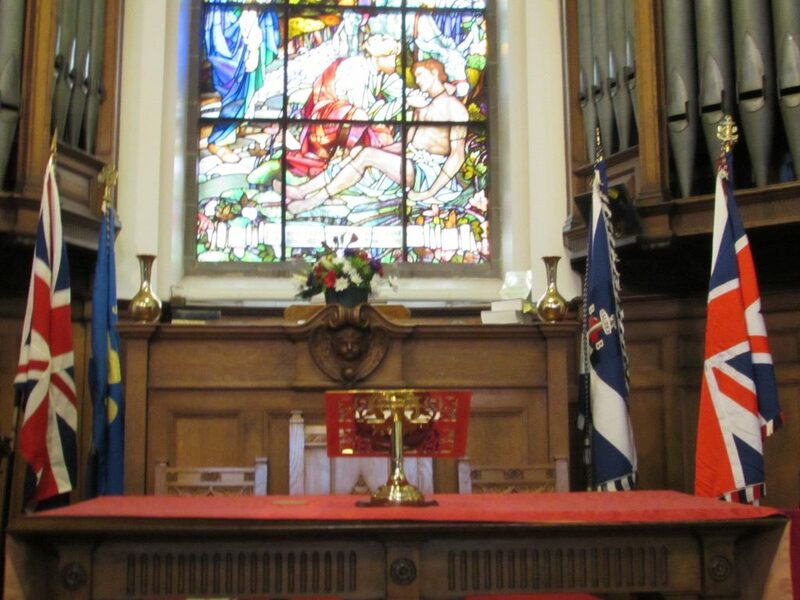 At the conclusion of the service, all of the congregation were invited to join together for hospitality in Dunfermline City Chambers. The Regular Meeting of Lodge Caldercruix St. John No. 1314 was held on Tuesday 18th February. RWM, Bro. John Hamilton extended a warm welcome to everyone present. Bro. Bill Perry PGM, who was accompanied by Bro. Andrew Millar DPGM, Bro. Billy Cowan PPGSW and Bro. Tom Reid PG Bard, presented Bro. David McMeekin PM and Bro. 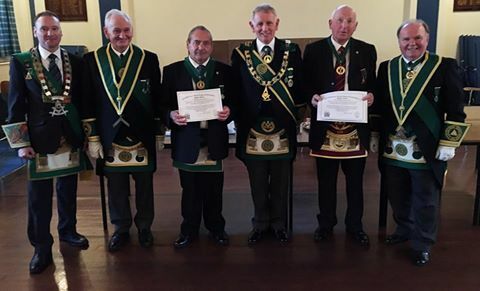 Charles Bulloch with Jubilee Certificates to mark their 50 year service to the Craft.Following the presentations, Lodge St. John Slamannan No. 484 conferred an excellent FC Degree. The Brethren then retired an enjoyed some fine 1314 hospitality. Provincial Grand Master Bro. William A. Perry has asked me to write to all Lodges in the Province in connection with the Garden Fete which is due to be held in the grounds of the Home on Saturday 24th June between 2.00pm and 4.00pm As you are probably aware this Province is one of 11 Provinces who support the group and are currently represented by Bro. Bobby Ferguson (Lodge No.306) and Bro. Tom Reid (Lodge No. 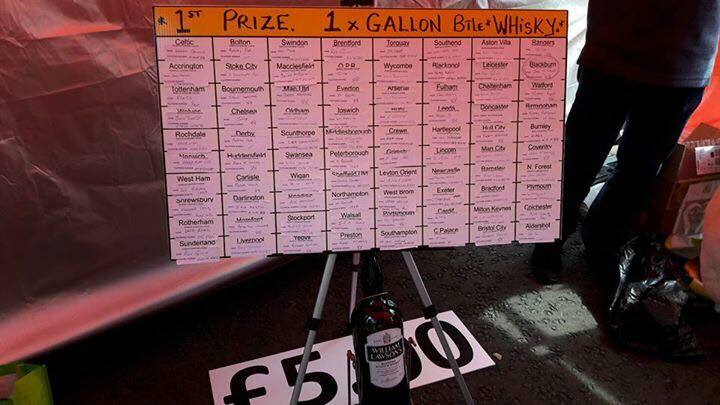 88) who are running a “Corks in a Bucket Tombola Stall” with the successful corks winning a bottle of wine. 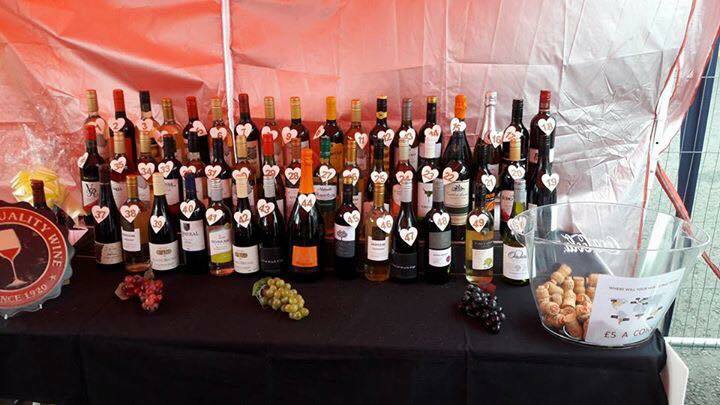 It is hoped that every Lodge in the Province will donate at least one bottle of wine to the stall, with additional bottles being more than welcome, as around 300 people are expected on the day. If your Lodge is able to make a donation your Lodge Representative could hand this in at the next Communication of P.G.L. 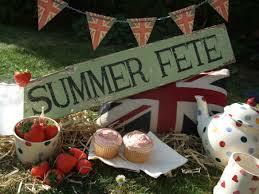 on Friday 2nd June at Lodge St Andrew Coatbridge No. 544, or by contacting Bobby Ferguson or Tom Reid at the telephone numbers shown below. May I thank you in anticipation for both your support for the “Wine” donation and hope that some of your Brethren will be able to attend on the day to support the work of this worthwhile group. On Wednesday 5th April, Bro. 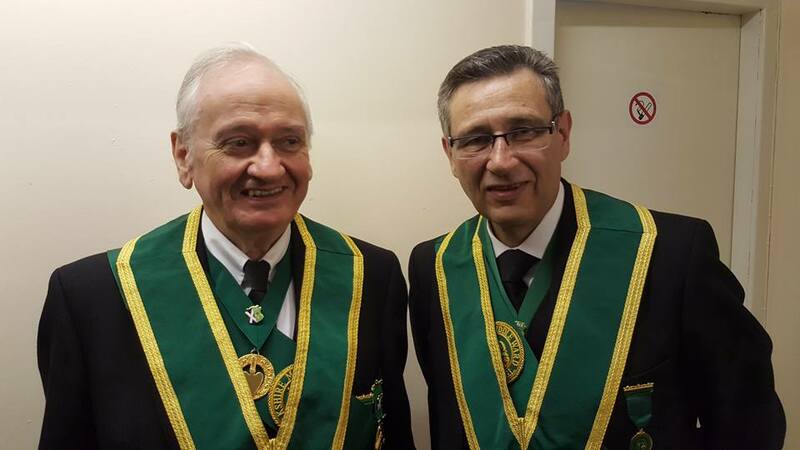 Bill Perry PGM had the great privilege to accompany Bro. Alex Watson RWM of Lodge Hamilton No. 233 and the Lodge Almoner, Bro. Scott Campbell PM to the home of Bro. Alex Crookston and to present him with his 70 year Certificate and lapel pin. 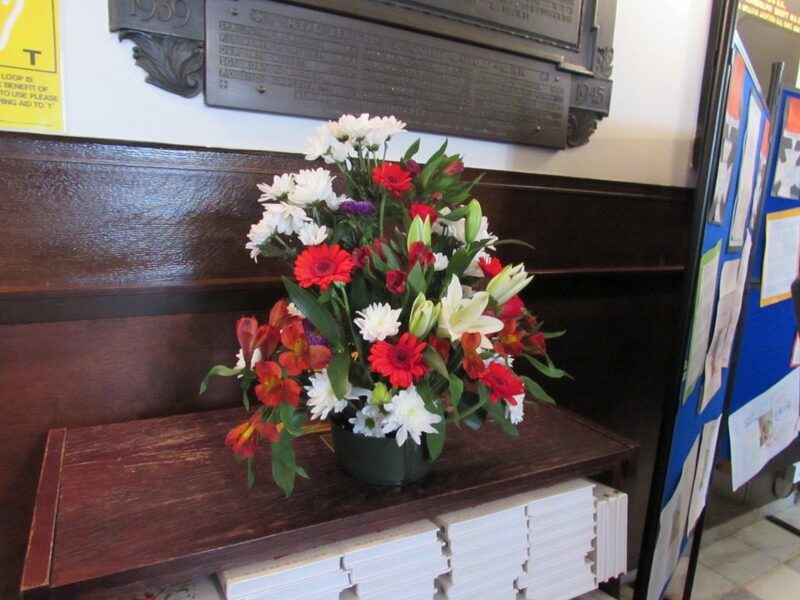 The Lodge also presented Mrs. Crookston with a bouquet of flowers to mark the occasion. Bro. Colin Crookston, WJW of Lodge Clydesdale No. 551 was also in attendance. The PGM thanked Bro. Alex for the many years of dedicated service to Lodge Hamilton, joining in 1947. Unfortunately due to ongoing health problems he has difficulty in walking great distances, which has prevented him visiting the Lodge in recent times. However special arrangements are being made to visit Lodge Clydesdale next January, when his grandson Adam will be Initiated. Next year will also be the 70th wedding anniversary of Alex and Hannah. Bro. Colin Crookston, Bro. Alex Crookston, Bro. Bill Perry PGM, Bro. Alex Watson RWM, Bro. 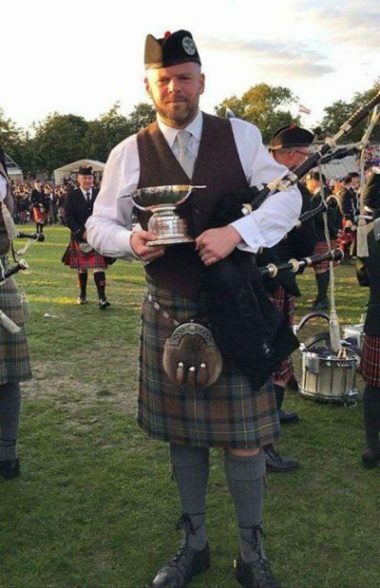 Scott Campbell PM Almoner. At both Aberdeen on Saturday and again at Barrhead last night, Bro. Ramsay McGhee, RW Depute Grand Master informed brethren of the new website launched by Prostate Scotland. 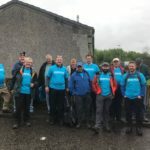 He also thanked the brethren for their generosity and support for the charity and updated the brethren on the amount raised since the end of 2012 by Scottish Freemasons in support of Prostate Scotland, the amount has now passed £360,000. 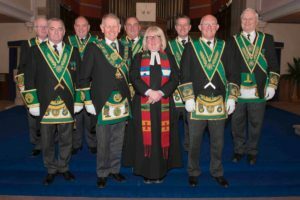 “We would like to acknowledge and thank the Freemasons from across Scotland for their kind donations which have assisted and helped enable this new website, as well as support many other projects. 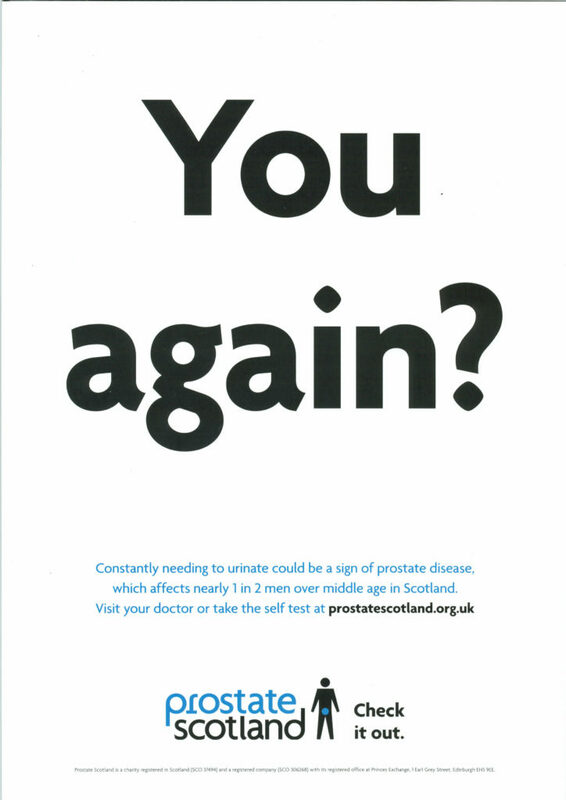 We have very much appreciated the support and partnership with the Grand Lodge of Scotland and Freemasons across the country, which is enabling us to create greater awareness of and reach many more men and their families with information and help about the most common cancer in men. We would like to also thank Union Digital for their creativity, expertise and skill to enable us to develop this new multi-functional website”. I think you will agree that this is a very positive message. Well done Brethren for all the support you have given to date, if you wish to help further, please share information about the new website with your friend and contacts. A number of brethren from PGL Lanarkshire Middle Ward here attending the installation of Right Worshipful Provincial Grand Master Bro. Ian Williamson. It was a pleasant surprise to find Bro.Edgar Moxey from DGL of the Bahamas was also attending. 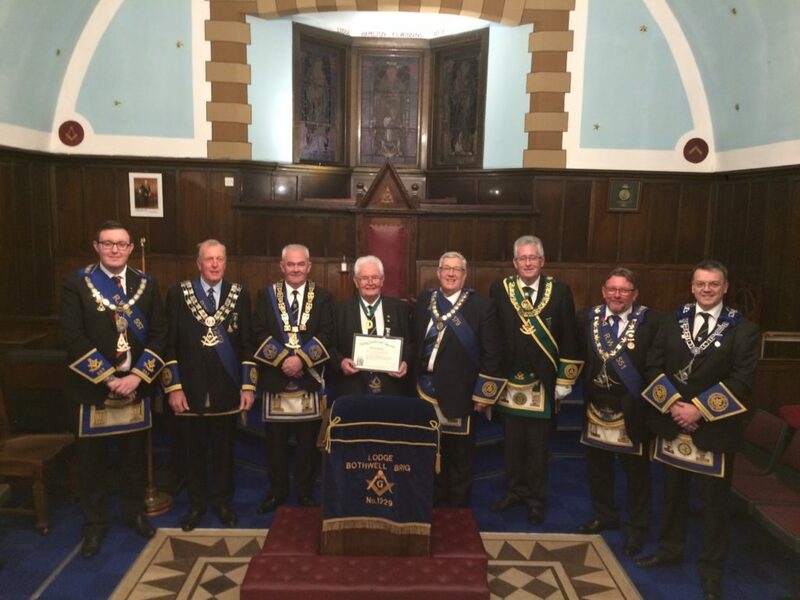 Edgar is an honorary member of the Provincial Grand Lodge of Lanarkshire Middle Ward. 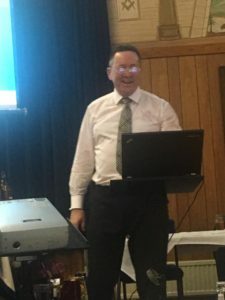 A dinner was held in the above evening to raise funds for the Holiday Accommodation Fund, the dinner was chaired in the usual informative and witty manner by SPGM Bro. 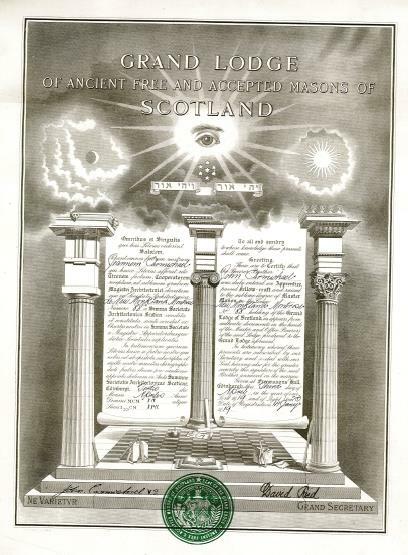 Angus Ross, over 100 Brethern were educated on two subjects, Firstly a very detailed and academic delivery on the history and foundation of the Societas Rosicruciana by Bro. Jim Rae followed by a humorous and very animated presentation by Bro. David B. Vennard on the not so well known Scottish poet Robert Service, if you haven’t heard of his works, it would be well worthwhile doing some research on this infamous career. The night was further enhanced with music provided the the PGL Organist Bro. Allan Gowans and our very own PGL Piper Bro David Stark.Provincial Grand Lodge would like to thank Brethern of Lodge Woodhall St. John No. 305 for the use of the temple and the hospitality received, a further update will be available shortly on the funds generated for the Accommodation fund. Bro. 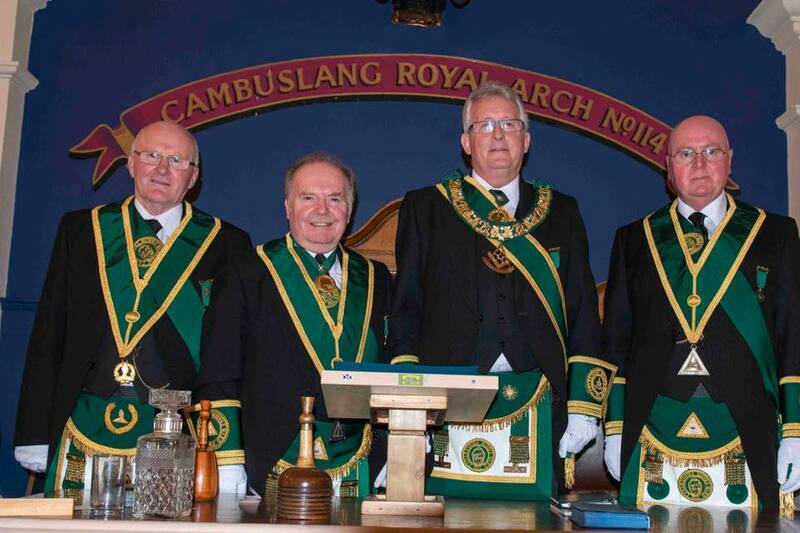 James Forrest was installed as the RWPGM of Dunbartonshire on Saturday 25th March. The Installation being conferred by the MWGMM and the Office Bearers of Grand Lodge. Bro. 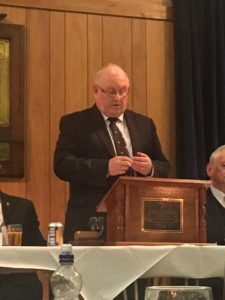 Bill Perry PGM had the honour of leading the Deputation from the Sister Provincial Grand Lodges and also delivered the toast to the Province of Dunbartonshire. Bro. Alex Kelly SPGM and Billy Spencer were also in attendance representing PGL. Bro. George Kelly IPSGM, Bro. Tom Davidson GIG and Bro. Tom McCrone Grand Steward, formed part of the large Deputation from Grand Lodge. Bro. 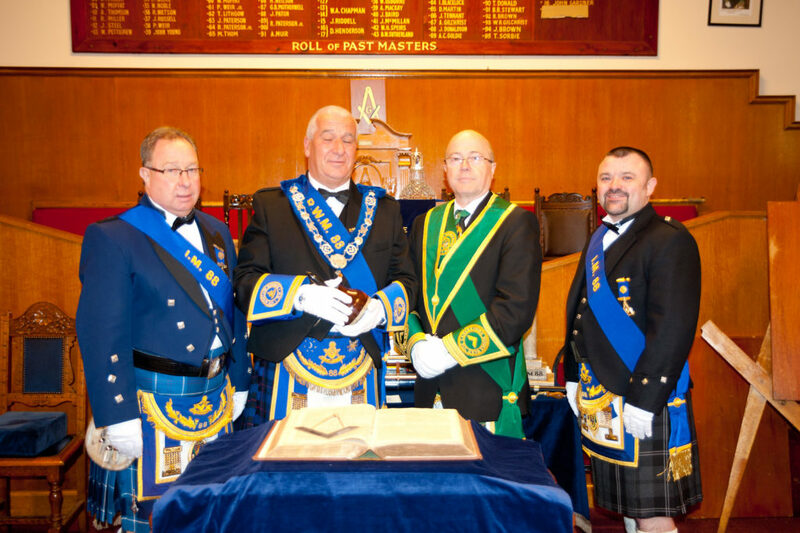 Neil Fraser was installed as RWPGM of the PGL of Renfrewshire East. 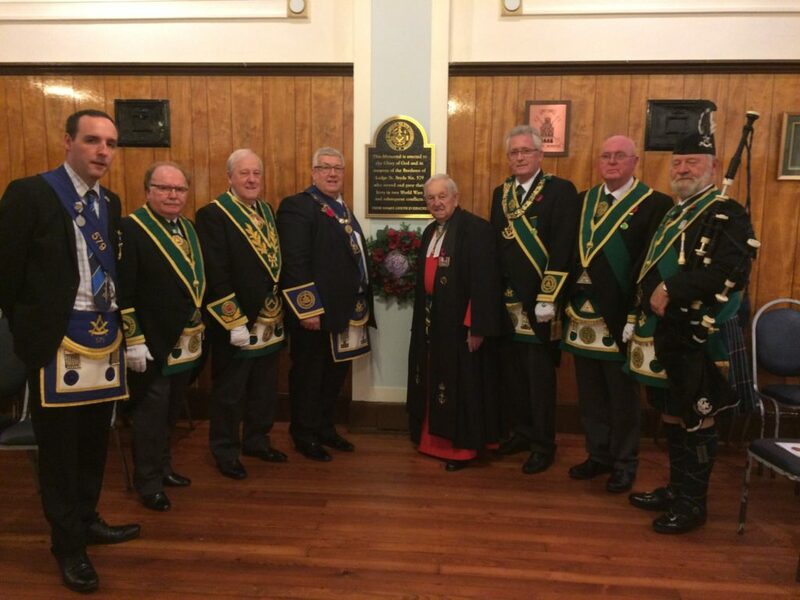 The Installation was carried out by the MWGMM and the Office Bearers of Grand Lodge. PGL of Lanarkshire MW were represented by Bros. Bill Perry PGM, Andrew Millar DPGM, Angus Ross SPGM, Tom McCrone PDOC and Billy Spencer. Bros. George Kelly IPSGM and Tom Davidson, Grand Inner Guard were also present as part of the Deputation from Grand Lodge. Photos Bro. Bill Perry PGM headed a deputation from PGL on the Annual Visit to Lodge Coltswood No. 1067. Bro. Donald McLeod RWM gave a warm welcome to the visiting Brethren. After giving his report,the PGM thanked all the members of 1067, especially Bro. Gordon Rowe IPM, for the very successful year during his stewardship of the Lodge. He also thanked the IPM and his brother Les, for the work carried out within the premises during the past 12 months. 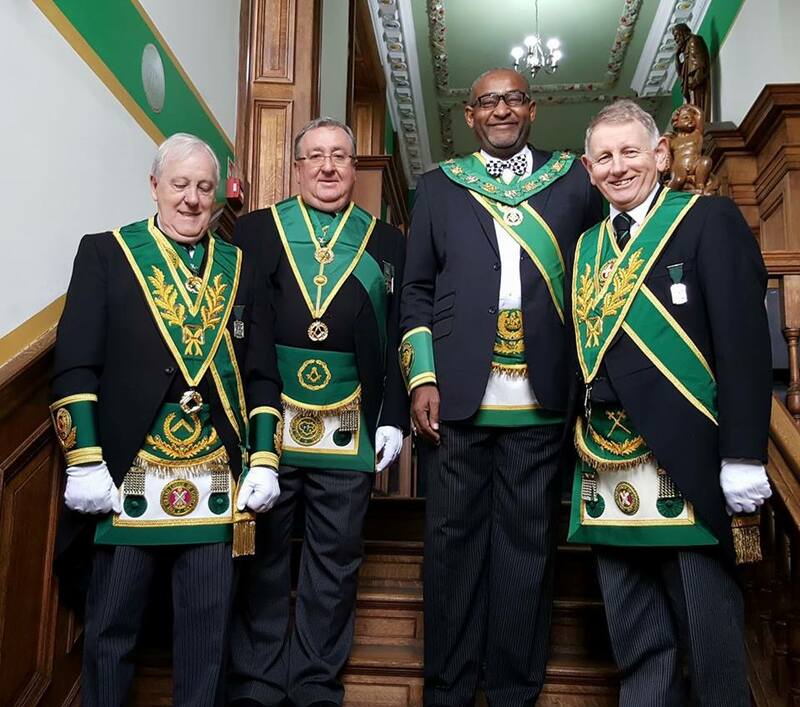 SPGM Bro Stephen Campbell headed the Provincial Grand Lodge Deputation on their Annual Visit to Lodge Livingstone Stonefield No 599 on Thursday 16th March. Following the business of Provincial Grand Lodge and an excellent EA Degree conferred by the Brethren of the Lodge the RWM, Bro Andrew Walker, assisted by the Substitute Provincial Grand Master, presented Bro Alex Craig with his Diamond Jubilee Certificate marking 60 years service to the Lodge and PM Bro Lindsay McDade with his Jubilee Certificate marking 50 years service. There was a brief reflection on their contribution to the Lodge and the Craft over the years, congratulations were offered and both Alex and Lindsay suitably replied. At the conclusion of the meeting the Brethren from Provincial joined the Brethren of the Lodge for a spot of hospitality and harmony. 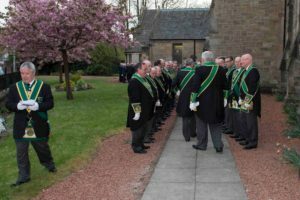 The joint Annual Divine Service of Lodge Kirkhill No. 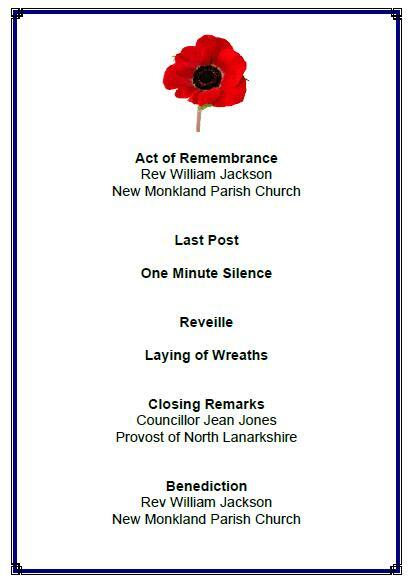 1230 and Cambuslang Royal Arch Lodge No. 114 was held on Sunday 12th March at Cambuslang Parish Church. The Service was once again conducted by Rev. Dr. Leslie Milton, who gave a warm welcome to those present. A large deputation from Provincial Grand Lodge supported both Lodges in this important date in their calendars. Following the service, the congregation retired to the church hall to enjoy an excellent buffet. 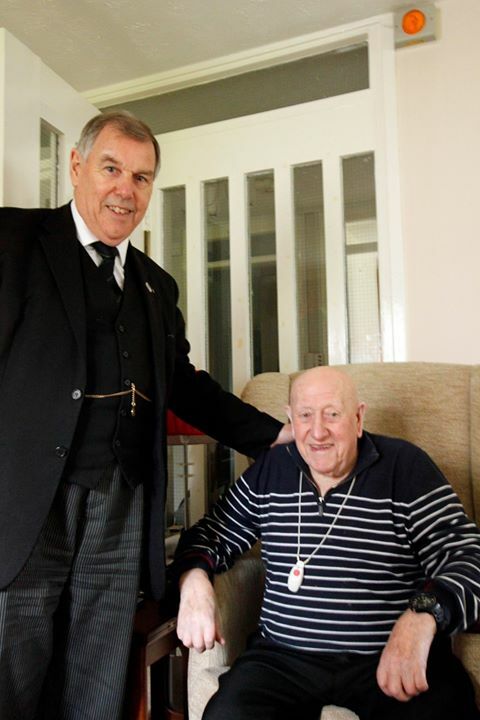 RWM Andrew Millar and RWM Gordon Hope both thanked Rev. Milton and the Church Session for granting permission to worship in their Church. Bro. Alex Kelly SPGM headed a large Deputation from PGL, to the Installation Meeting of Lodge Griffin No. 1254, which was held in the Community Hall, Gartcosh on Tuesday the 7th March. Bro. Reg Sutherland RWM welcomed the Provincial Deputation and the large number of visitors who were in attendance to support the Lodge. Bro. Isaac Thirsk was Installed as Master in an expert fashion by Bro. William Gow PM 219, PM 1779 and Bro. Robert Robertson PM 1515 Installed the Office Bearers in an equally impressive manner. At the conclusion the Brethren were treated to a fish supper tea, an excellent harmony and the usual 1254 hospitality. On Monday Bro. Bill Perry PGM, went to Cambuslang, to visit Lodge Buchanan No. 1499. The RWM, Bro. Stuart Fotheringham extended a warm welcome to the Brethren of the Lodge and to the many visitors who were present. An excellent Master Mason degree, was conferred by Bro. 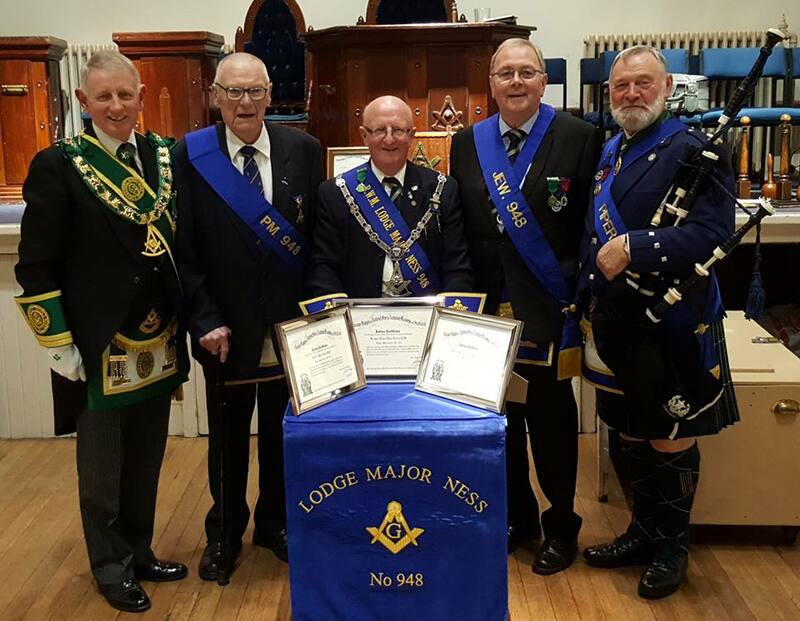 Stewart Wilson PM and the Past Masters of the Lodge. Following the close of the Lodge, the Brethren retired and enjoyed the usual 1499 hospitality. William Mather RWM 1223, Bryce Morrison RWM 579, Bill Perry PGM, Stuart Fotheringham RWM 1499, Gordon Hope RWM 114, Ian McCutcheon RWM 524 and Hugh Twaddle lurking at the Secretaries desk! 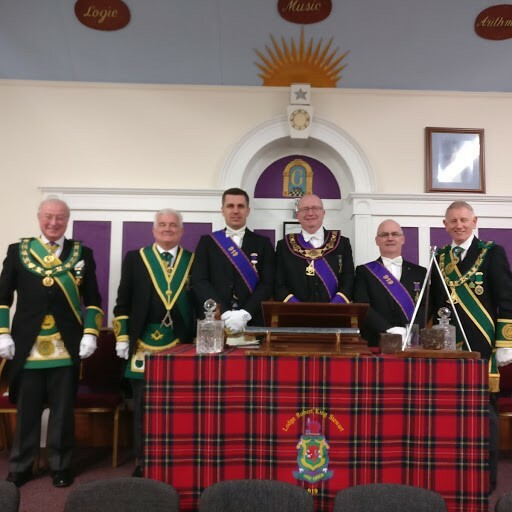 On Sunday 5th March, the Provincial Grand Lodge of Stirlingshire held their Annual Divine Service at the Allan Church in Bannockburn. The service being conducted by Rev. James Landels. Bro. Alastair Marshall, PGM and the Brethren of the Stirlingshire extended a warm welcome to the visitors. At the close of the Service, an excellent buffet was provided by the Province. Provincial Grand Lodge Installation of Office Bearers was held on Friday 3rd March at the premises of Cambuslang Royal Arch Lodge No. 114. PGM Bro. Bill Perry gave a warm welcome to the many Brethren of the Province who were in attendance. A Deputation from twelve Sister Provinces, headed by Bro. 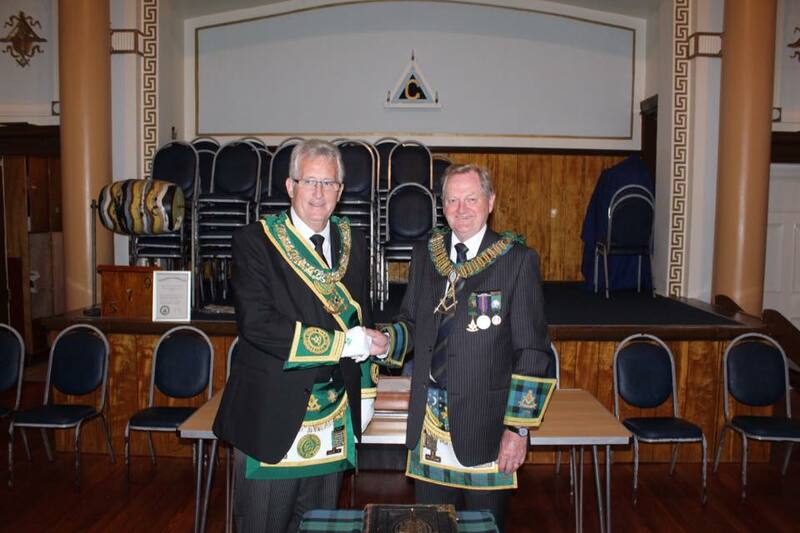 Jim Livingstone, RWPGM of Renfrewshire West then were introduced by the DOC Bro. Tom McCrone. Bro. McCrone then presented a Deputation from the Grand Lodge of Scotland, Bro W. Ramsay McGee, RWDGM heading the Deputation. The Installation was in the very capable hands of Sen PG Chaplain, Bro. Jim Ferguson, Jun PG Chaplain, Bro. Jim Vasey and PPGSW, Bro. Robert Stanfield. Following the Installation, Bro. 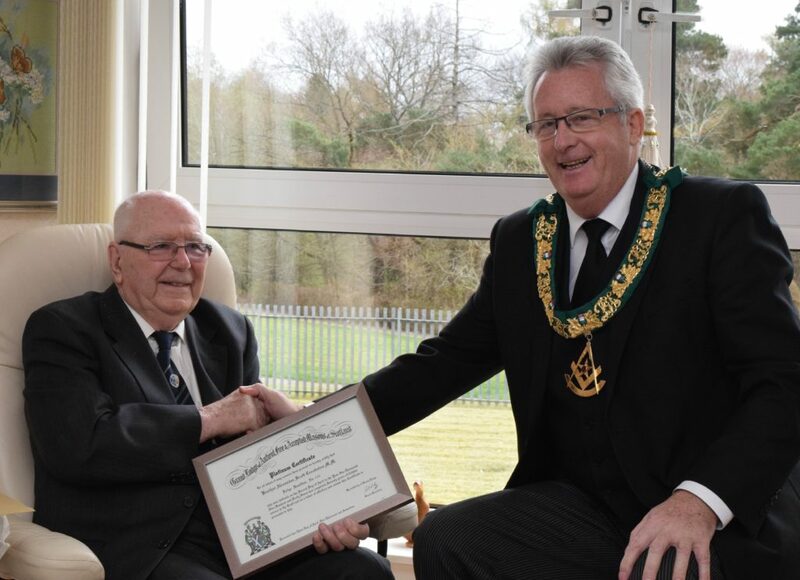 Jim Lees completed his twenty year journey as a Provincial Office Bearer when the PGM presented him with a set of PPGSW’s regalia and his Service Certificate. Bro. Robert Lees, Jim’s father, then invested his son with his PPGSW’s Jewel. Bro. Jim Livingstone who was asked to comment on the proceedings, highly praised the standard of the ceremonial of Installation and congratulated the newly Installed Office Bearers. He also congratulated Bro. Lees on his achievement. 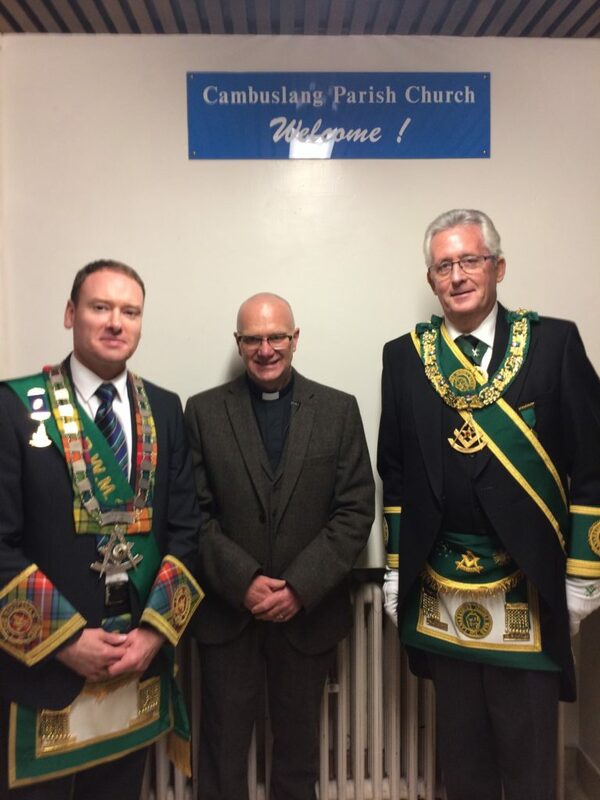 The meeting was closed and the Brethren enjoyed a light supper and some Lanarkshire hospitality. On Wednesday 1st March, RWM Bro. 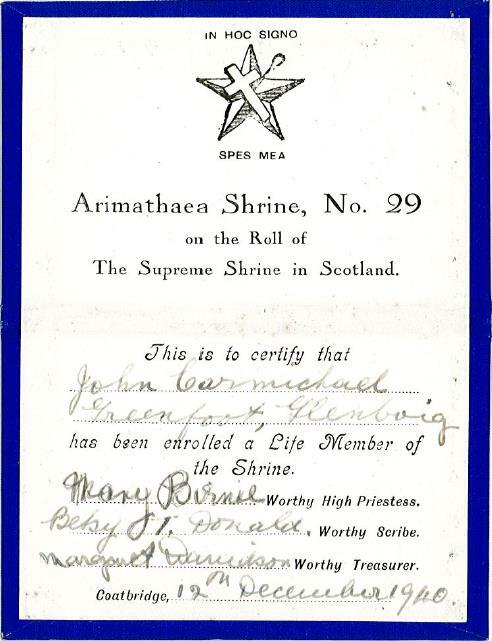 James Stewart of Lodge Airdrie St. John No. 166 welcomed PGM Bro. Bill Perry and PG Secretary Bro. Willie Craig to the Regular Meeting of the Lodge. The Lodge business being completed, the Brethren retired to the lounge. Representatives from eight local charities were then each presented with a cheque for £250 on behalf of the Lodge. 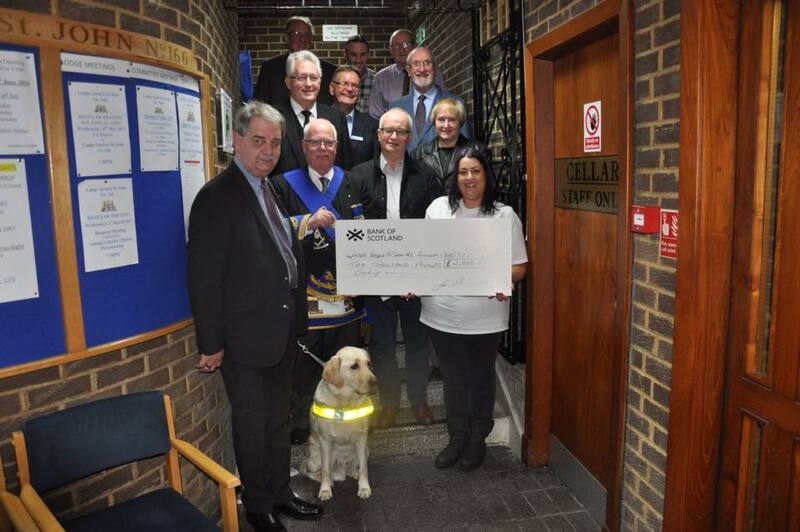 This is the 17th annual presentation to local charities, with a total of £37,500 being distributed to various organisations during this period. Each of representatives thanked the Lodge for their most generous support and gave the assembled Brethren an insight of the work done by their charities. 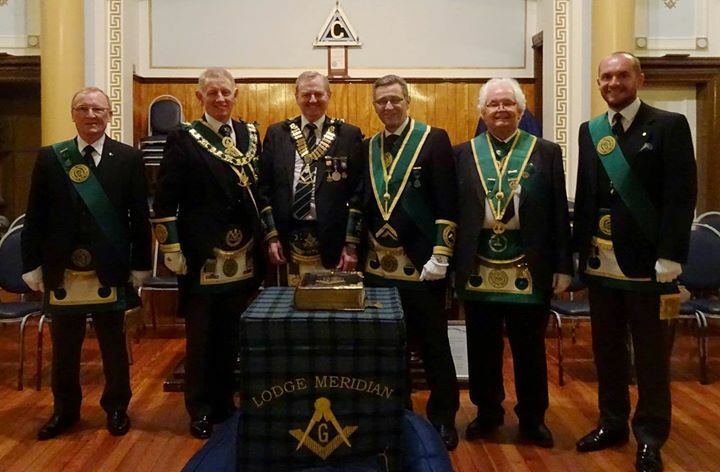 The Provincial Grand Lodge of Stirlingshire held their Annual Installation of Office Bearers on Saturday 25th February, in the premises of Lodge St. Andrew (Denny & Loanhead) No. 176, Denny. The Provincial Grand Master, Bro. Alastair Marshall gave a warm welcome to the many Brethren from the visiting Provincial Grand Lodges. The Provincial Deputation was headed by Bro. 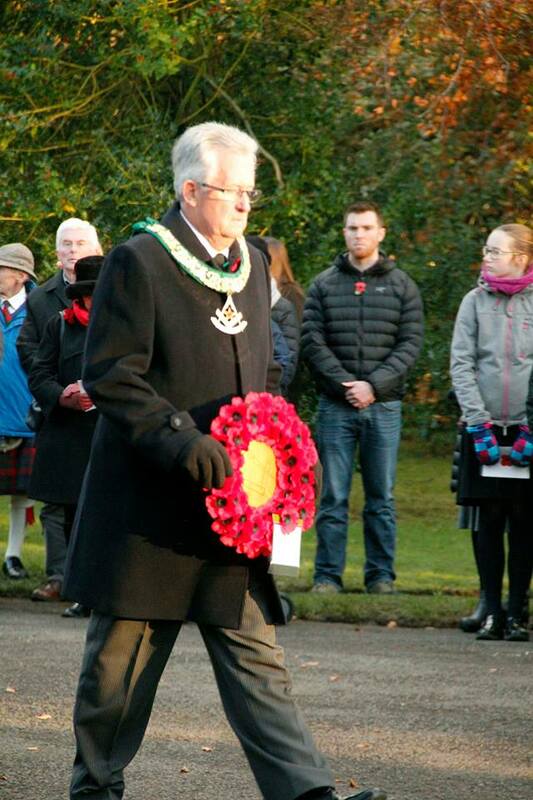 Douglas Fergie, PGM of the PGL of East Lothian and Berwickshire. 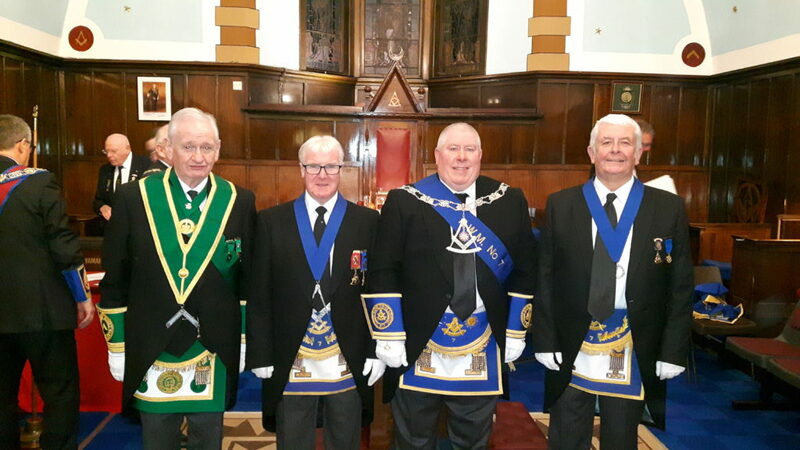 PGL of Lanarkshire MW were represented by PGM Bill Perry, SPGM Stephen Campbell, SPGM Norman Carnegy and Senior PG Chaplain Jim Ferguson. The Installation Ceremony was conferred in an expert manner by SPGM’s, Bro. Sandy Thomson and Brian Wright. 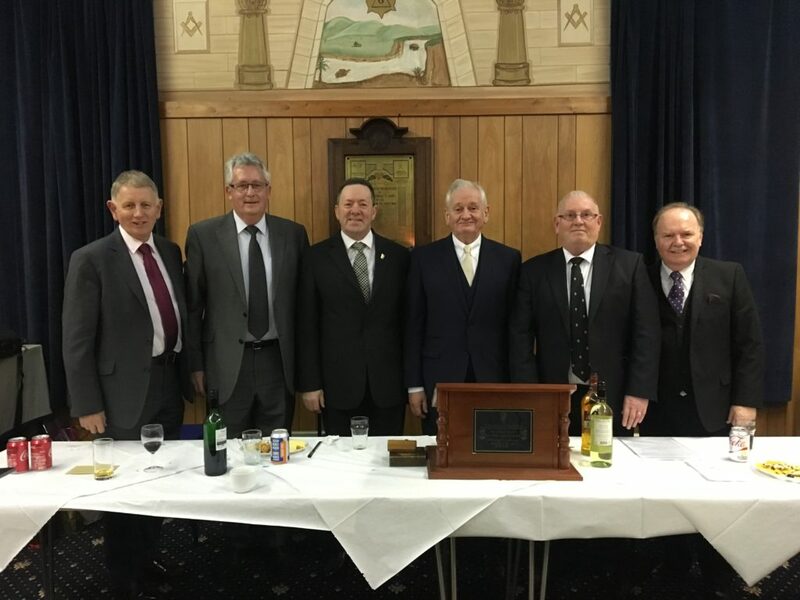 The Annual Installation of the Lodge was held on Saturday 18th February, Bro. 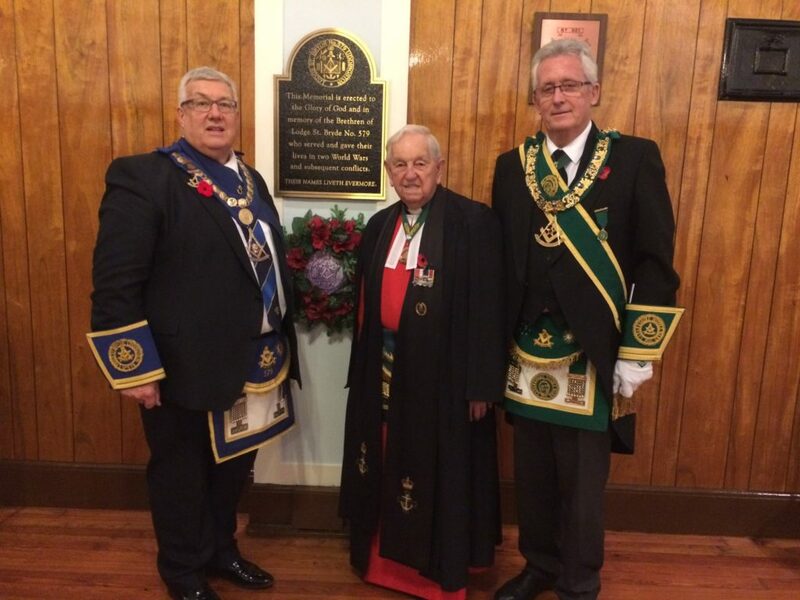 Maxwell Baillie RWM was installed by Bro. Derek Bell PM with the Office Bearers being installed Bro. William Elliot PM. Both are Past Masters of Lodge St. Andrew East Kilbride and were a credit to Lodge St Andrew and their Province. An excellent Festive board followed which was well attended. On Wednesday 14th February, Bro. Bill Perry PGM, accompanied the RWM, Bro. 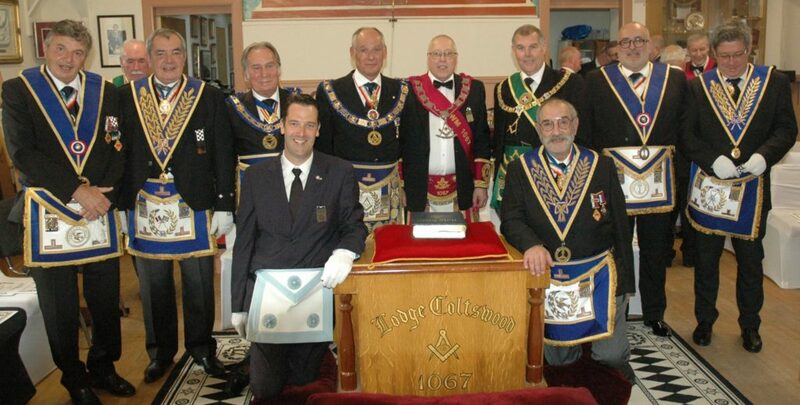 John Hamilton and the Brethren of Lodge Caldercruix St. John No. 1314 on a visitation to Lodge Airdrie St. John No. 166. Bro. 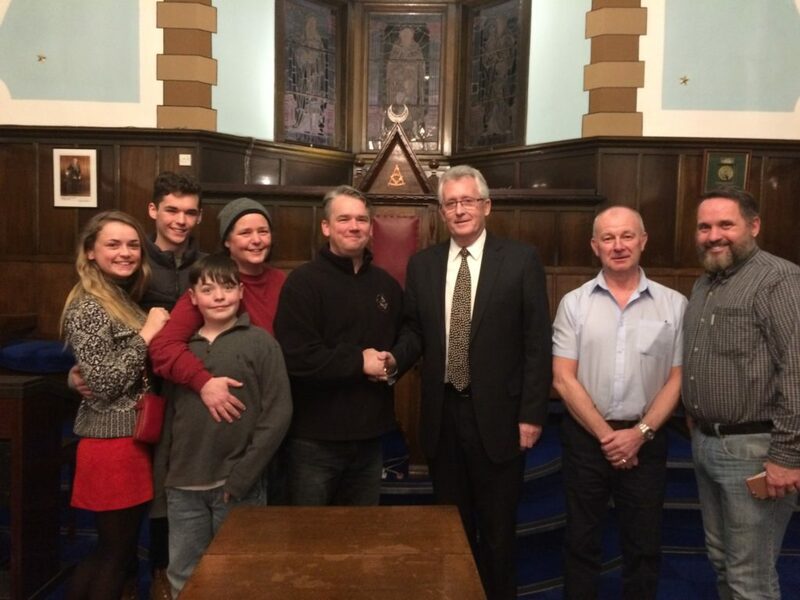 Jimmy Stewart RWM extended a warm welcome to the many Brethren in the Deputation. 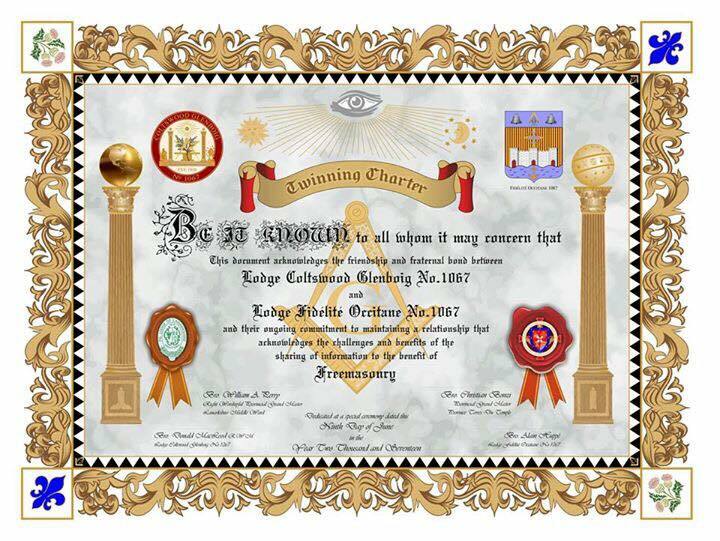 An exemplification of the EA degree was then conferred in an expert manner by the Past Masters and Office Bearers of 1314. Harmony and the usual 166 hospitality then followed the close of the meeting. The Regular Meeting of Lodge Murdostoun Castle No. 1096 was held on Tuesday 13th February. RWM Bro. Derek Douglas gave a warm welcome to Bro. Hunter Maxwell RWM and the Brethren of Lodge Livingstone St. Andrew No. 573, who conferred an excellent exemplification of the EA Degree. Bro. Bill Perry PGM who had joined the Deputation commented most favourably on the standard of the ceremonial presented by 573. 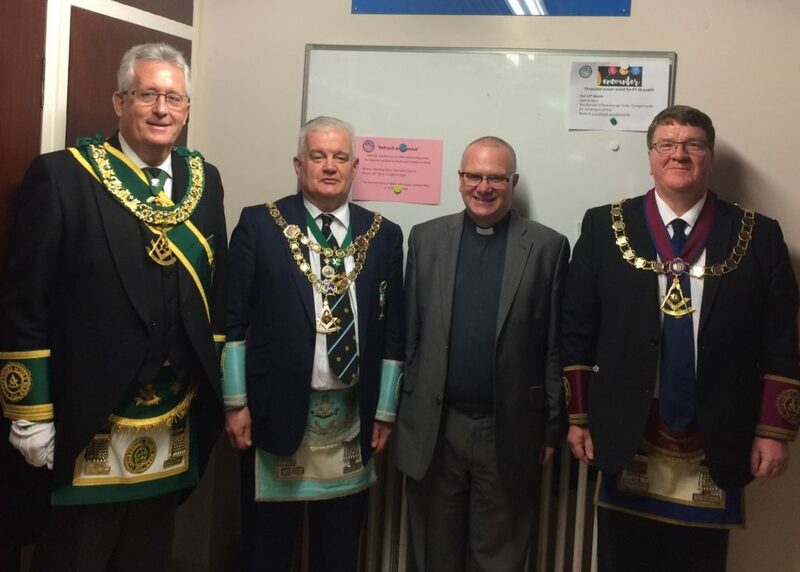 The Lodge was closed and the Brethren enjoyed the hospitality of the Lodge. On Wednesday 8th February, Bro. 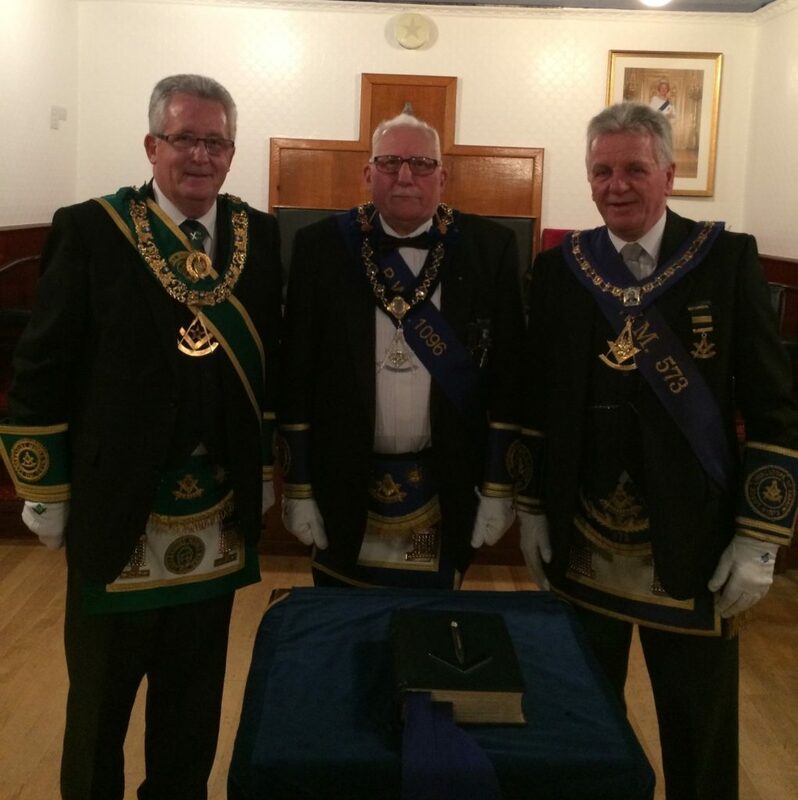 Bill Perry PGM and a large deputation from Provincial Grand Lodge visited the Operative Lodge of Airdrie No. 203. The RWM Bro. 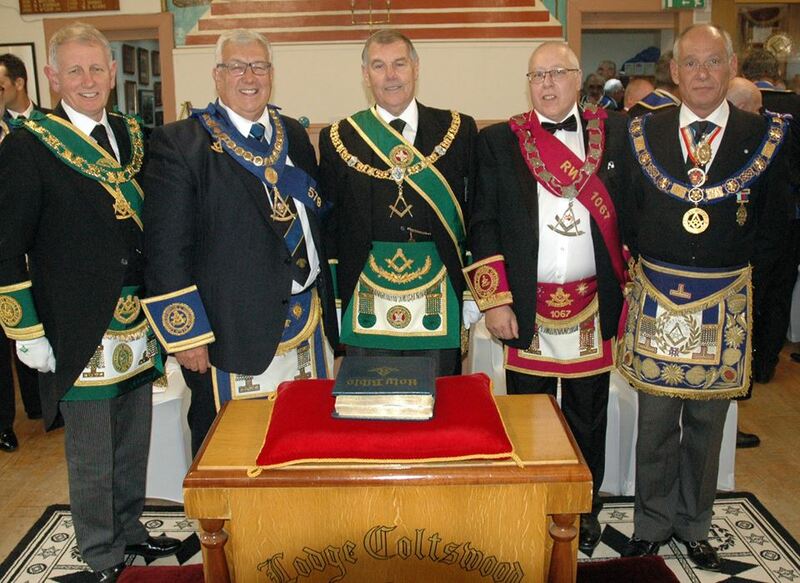 Ross Goldie and the Brethren of 203 had invited the PGL to carry out the ceremony of Dedication of new Lodge Regalia. The ceremony was conferred in an excellent manner by Bro. Jim Ferguson, Senior PG Chaplain, Bro. Jim Vasey, Junior PG Chaplain and Bro. Tom McCrone PG DOC. 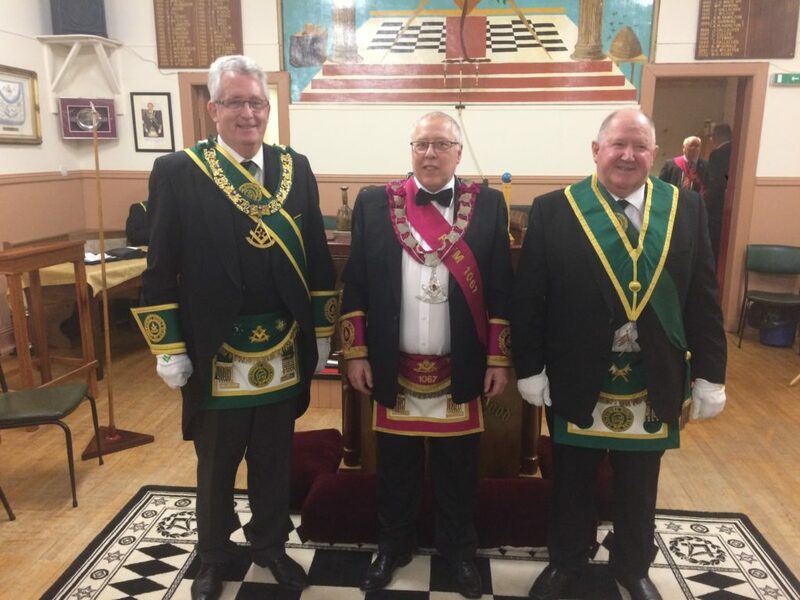 Following the Dedication of the Regalia, Lodge New Monkland Montrose No. 88, headed by RWM Bro. Iain Keltie conferred the FC degree on Bro. Ken Ho in an exemplary manner. The meeting was then closed and the Brethren enjoyed some 203 hospitality. Bro. Alex Kelly SPGM attend the Lodge this evening and witnessed an excellent Entered Apprentice Degree by the Lode Office Bearers, following a fine vote of thanks Bro. Kelly then presented Bro John McKenzie with his 50 Year Diploma which he so rightly deserved for his service to his Mother Lodge. 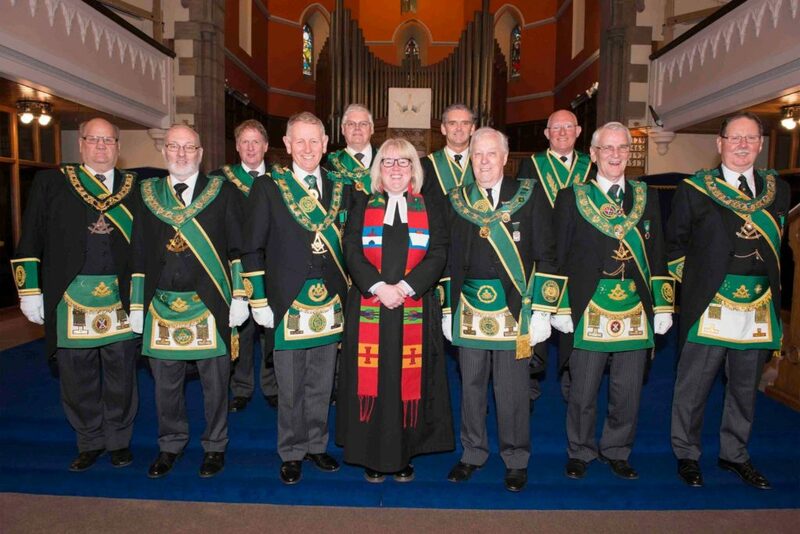 This fantastic sum was the result of the collection at the 2016 Xmas Carol Service, together with the do…nations from the various Masonic Orders who took part in the Service. Rev. 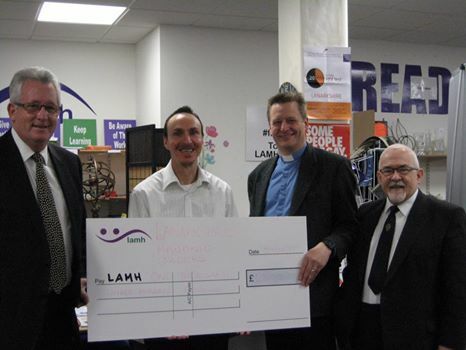 Ross Blackman, who had conducted the Service at the Hamilton Old Parish Church in December nominated LAMH as the charity to benefit from this annual event in the calendar of the Freemasons within Lanarkshire. Hugh Cairns on behalf of LAMH thanked everyone for their support and for the kind donation which would be put to good use within the Lanarkshire Community. RWM Bro. Bert Anderson extending a warm welcome to all Brethren present, which included Bro. Bill Perry PGM and Bro. Tom Davidson IPPGM. Bro. 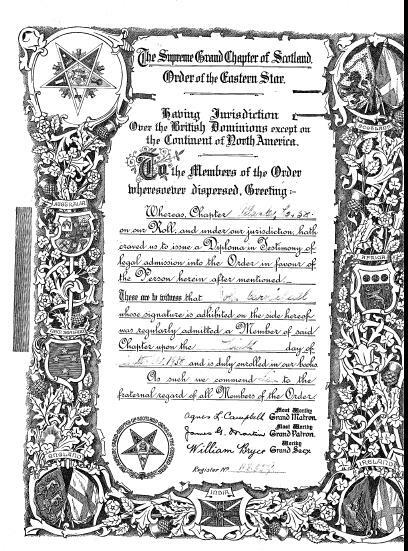 Robert Cook RWM and the Brethren of Lodge St. Thomas No. 306 who had been invited by Lodge St. Andrew, conferred an excellent exemplification of the FC Degree. Bro. 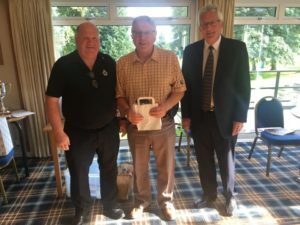 Perry congratulated both Lodges on the standard of the meeting and of the ritual, he also thanked Lodge St. Andrew for the donation previously forwarded to PGL on behalf of the Holiday Accommodation Fund, which had been raised at a charity golf day. On Saturday 4th February, Bro. Andrew Paterson RWM of Lodge Larchgrove No. 1518, welcomed Bro. Bill Perry PGM and a deputation from Provincial Grand Lodge to the Installation of the RWM and Office Bearers. Bro. Paterson was Installed for his second term as Master, by RWIM’s, Bro. William Love PM and Bro. Gordon Love PM, who conferred an excellent ceremony of Installation. Following the close of the meeting, the Brethren enjoyed a fine meal and Lodge hospitality. Bro. 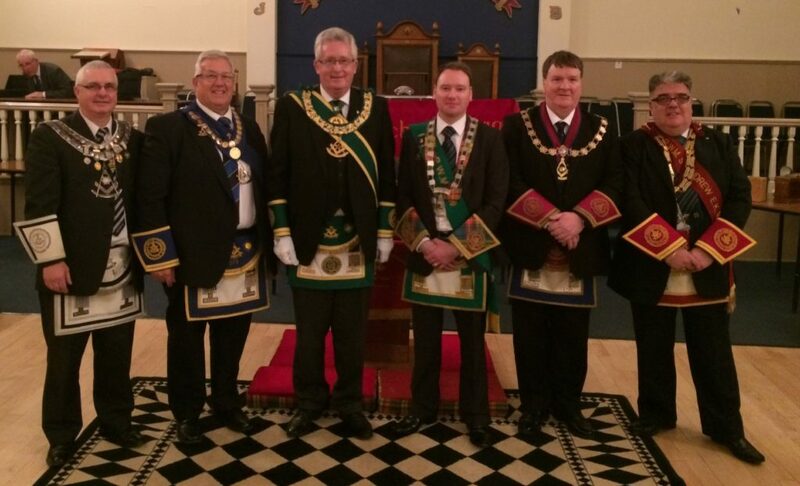 Alex Kelly SPGM represented PGL Lanarkshire Middle Ward at the installation of Bro. Norman MacLeod, the new RWPGM of PGL Edinburgh. 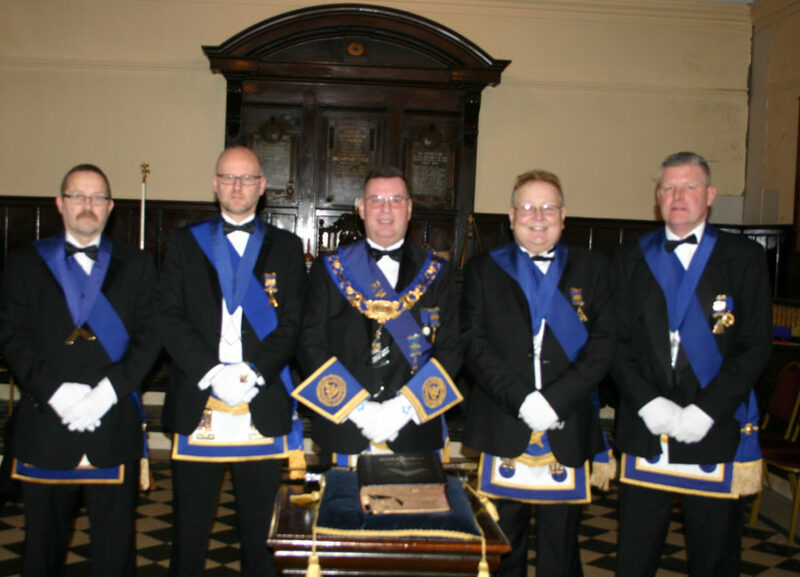 The installation was held in Freemasons’ Hall and was conducted by Bro. Ramsay McGhee RWDGM. Also present from PGL Lanarkshire Middle Ward as part of the Grand Lodge deputation were Bros. George R Kelly, James L Jack and Tom Davidson. Bro. Ramsay McGhee congratulates Norman MacLeod on his installation. 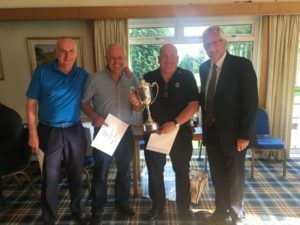 RWM Alex Watson joined the following Brethren, Brothers Danny Farquhar, Jack Cheape, Frank Craig (Larkhall Golf Club) Gordon Mather, Willie Scott and Ian Young. Missing from photograph Bro. George Gray. 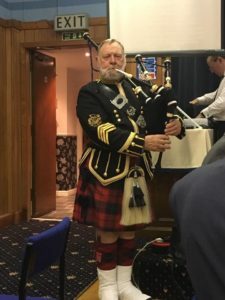 This was the ninth burns supper at the golf club, run by RWM Alex Watson, on this occasion a wonderful sum of £1500 pounds was raised, well done Brethern. Bro. Andrew Millar DPGM headed a deputation to Lodge Burns Immortal No. 1730 and witnessed the Installation to Right Worshipful Master Bro. 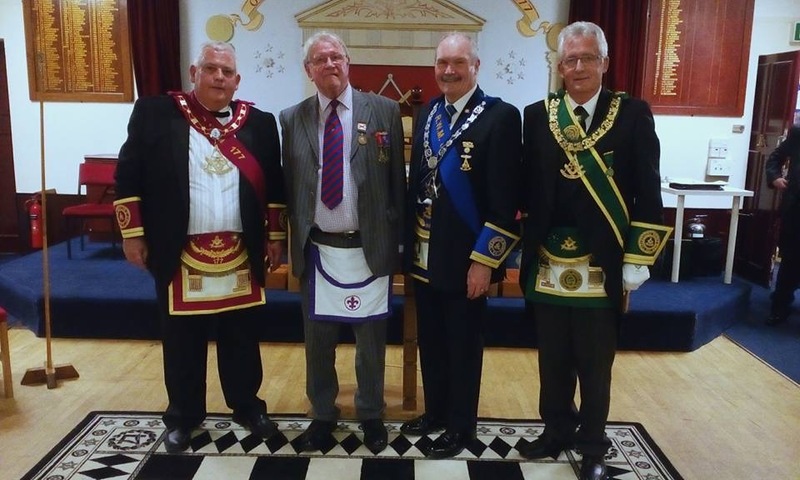 William Ruddock by Installing Masters Bro. David McMorris PM and Bro Gordon Mather PM, following the ceremony the brethren joined in some Lodge harmony. 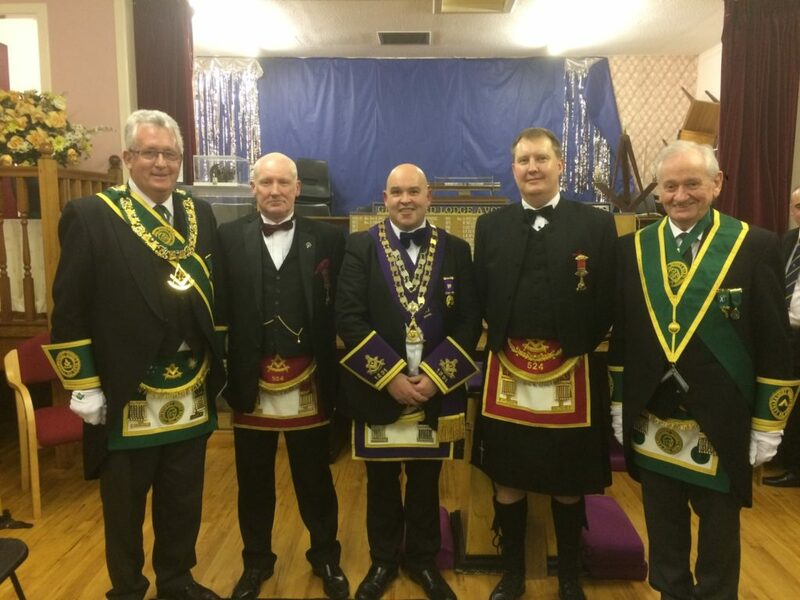 Provincial Grand Lodge were invited to attend the meeting of Lodge Airdrie St. John No. 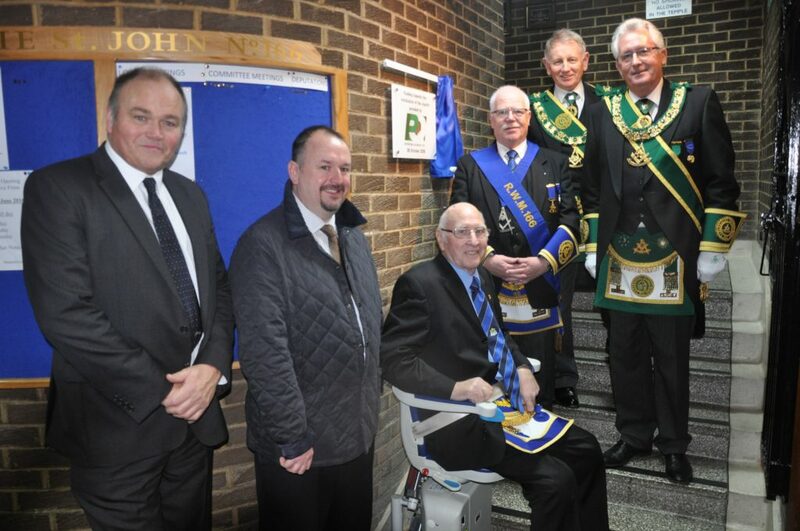 166, on Wednesday 18th January, to take part in the unveiling of the plaque to celebrate the installation of the Stair Lift Chair which was recently commissioned at the Temple. Bro. James Ferguson PM Secretary gave thanks on behalf of the Lodge for the contribution of many Brethren and their families and others who had given great assistance in this project. Special thanks was given to Bro. Tom Davidson IPPGM and to Councillor Alan Beverage, both had sent letters in support of the application, also in attendance was Mr. Stephen Reece representing Patersons Quarries’ Bro. Tom Davidson who was asked to unveil the plaque, congratulated the Lodge on the installation of this wonderful asset which would allow those with physical difficulties to access the Lodge Room and other facilities on the upper floor. Prior to the unveiling, Bro. 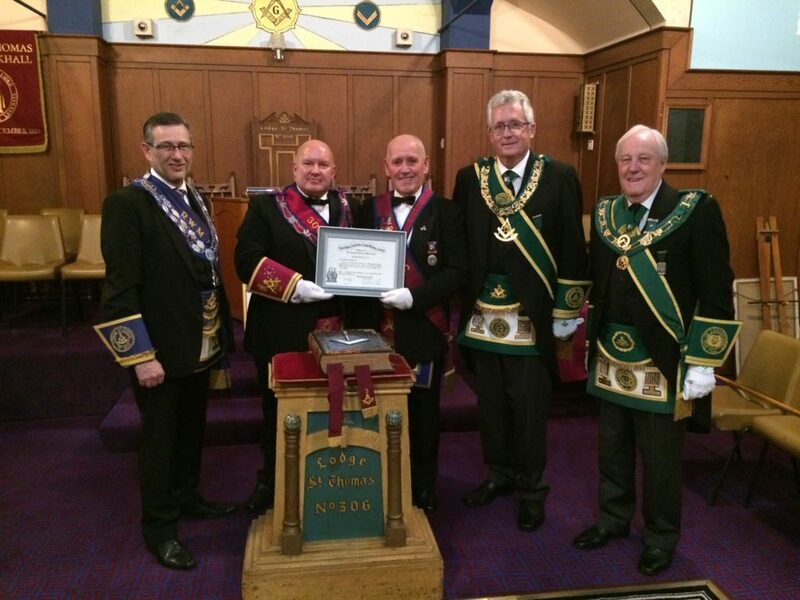 Bill Perry PGM was delighted to accept Honorary Membership of Lodge Airdrie St. John No. 166. Bro. James Stewart RWM obligated Bro. Perry and presented him with his Honorary Membership Certificate. On Monday 16th January, RWM Bro. Andrew Alston extended a warm welcome to Bro. 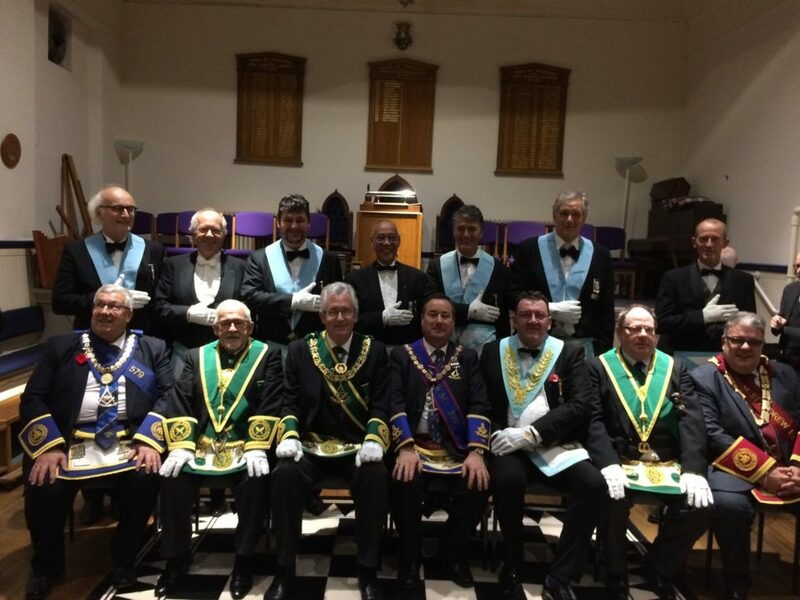 Bill Perry PGM and the visitors who were attending Lodge Garrowhill No. 1413. An excellent EA degree was conferred by the Past Masters and Office Bearers of the Lodge on candidate, Blair Duthie. Following the degree the RWM presented Bro. Robert Getty PM with his 50 year Diploma and thanked Bro. 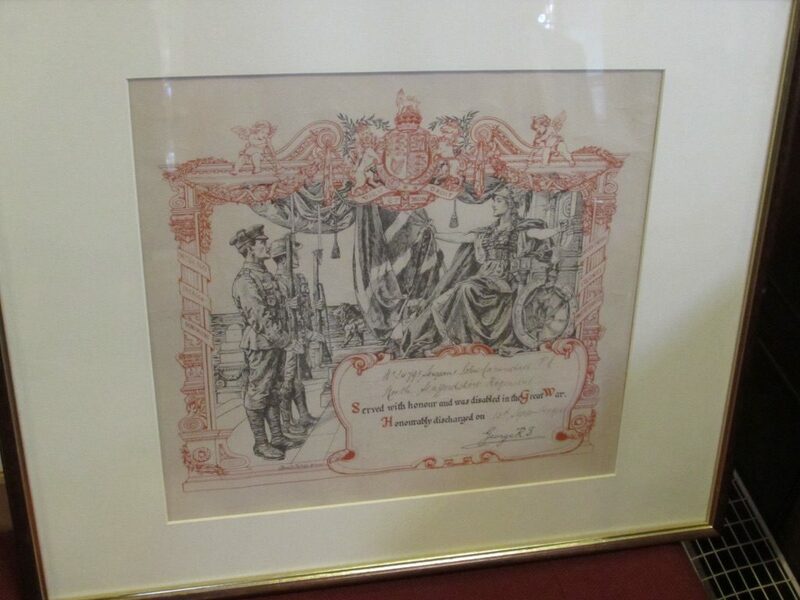 Getty for the dedicated service given by him to Lodge Garrowhill. Bro. Bill Perry also congratulated him and gave a glowing report of his many years in PGL, in which he is a Past Provincial Grand Senior Warden. 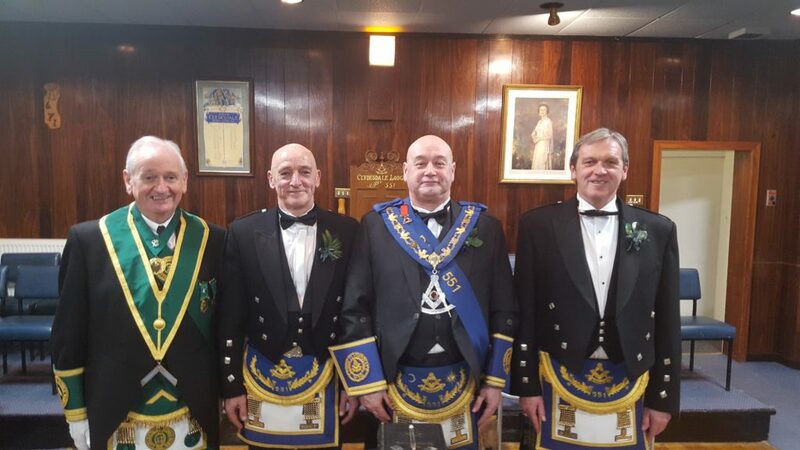 On Saturday 14th January two brethren from Lodge Hamilton 233 came from the west to the east seeking more Masonic light when two of your own were the Principle (superior) Installing Masters at the Installation of Bro Duncan McCartney a son of 233! On the occasion of him being Installed into the Chair of King Robert De Bruce no 304. The two brethren Bro’s Derek Rodger and Colin Taylor certainly did their Lodge and your Province credit, in fact they did more than that, they brought Masonic light to the East and it was a joy to witness their work that was ably assisted by one of King Robert De Bruce’s own Bro Danny Cuthbert. All in all it was an excellent night of freemasonry and a warm welcome will always be extended into the Province of Fife and Kinross for the brethren of 233! The AGM of Provincial Grand Lodge was held on Friday 13th January at the premises of Lodge St. Bryde No. 579, Uddingston. Following the usual business of the AGM, the Director of Ceremonies Bro. Tom McCrone, presented the three latest recipients of Honorary Grand Rank to the Provincial Grand Master, Bro. Ian McIndoe PM of Lodge New Monkland Montrose No. 88, Honorary Junior Grand Deacon, Bro. 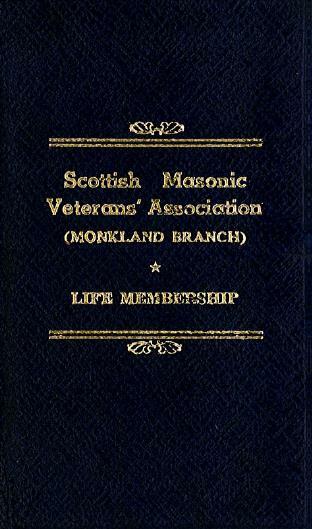 Morris Smith PM of Lodge Kirkhill No. 1230, Honorary Grand Organist and Bro. Archie Baillie PM of Lodge Avon No. 1231, Honorary Assistant Grand Secretary. 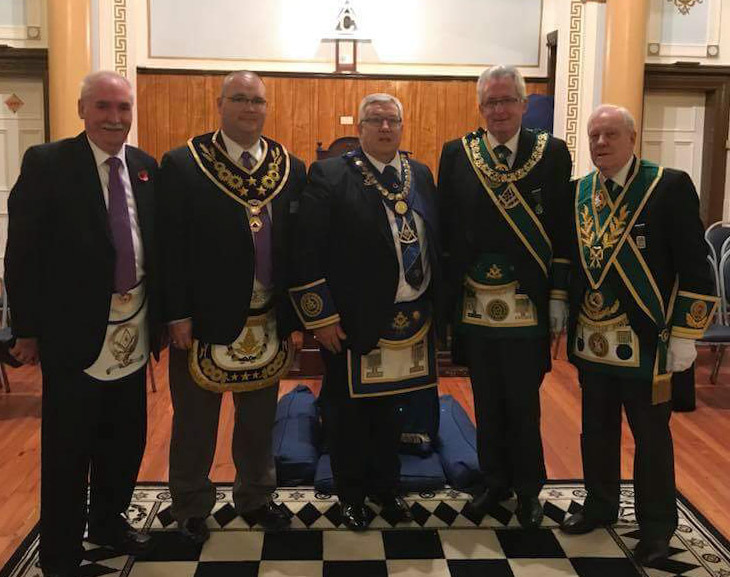 The PGM then gave the assembled Brethren a brief summary of the dedicated service that all three had given to their Lodges, Provincial Grand Lodge and to the Craft. The PGM then presented the Brethren with their Certificates and the RWM’s, on behalf of the respective Lodges invested the worthy Brethren with their Honorary Grand Lodge jewel’s. All three Brethren then thanked the PGM and their Lodges for the presentations. The meeting was then closed and the Brethren enjoyed excellent hospitality provided by Lodge St. Bryde. 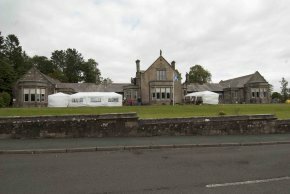 Lodge Kirkhill No. 1230 held their Regular Meeting on Thursday 12 January. RWM Bro. Andrew D Millar gave a warm welcome to all the Brethren who were in attendance. Bro. Bill Perry PGM who was present, witnessed RWM Bro. 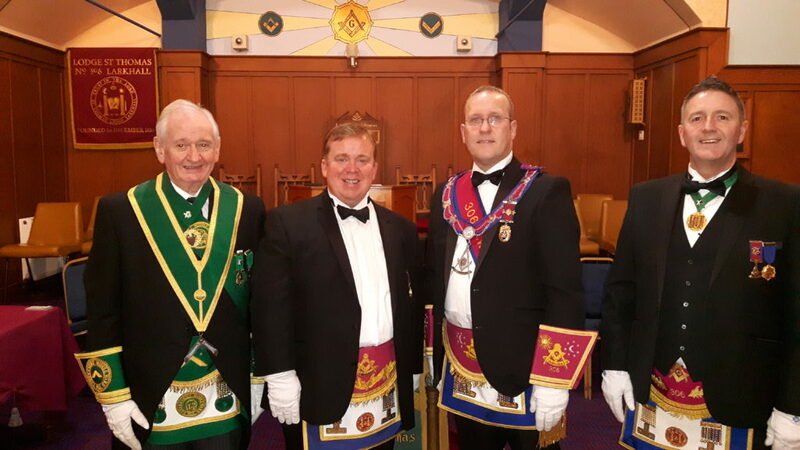 Gordon Hope and the Brethren of Cambuslang Royal Arch Lodge No. 114 confer an excellent FC degree. 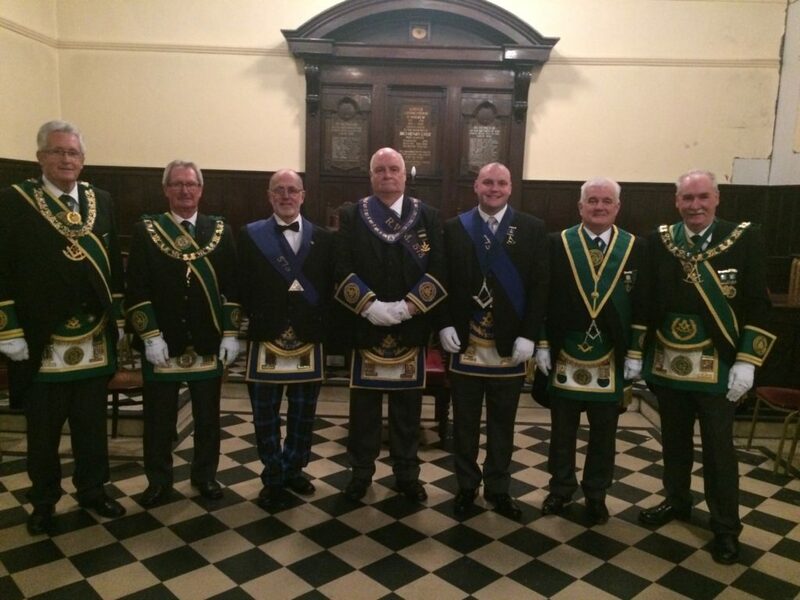 At the close, the Brethren were treated to Lodge hospitality and harmony. A large Deputation from Provincial Grand Lodge, headed by Bro. 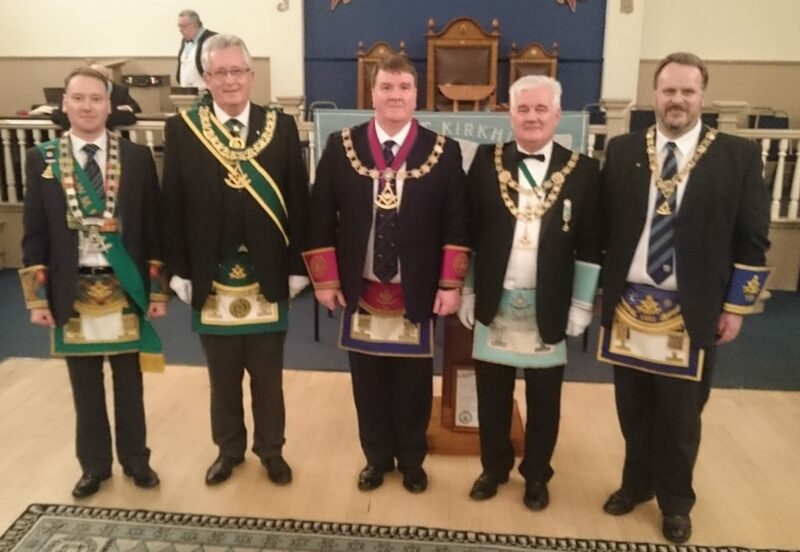 Bill Perry PGM attended Lodge Hamilton Kilwinning No. 7 on Wednesday 11th January, when Bro. Alex Stoddart PM received his 60 year certificate. Bro. John Anderson RWM delivered a full and comprehensive history of Bro. 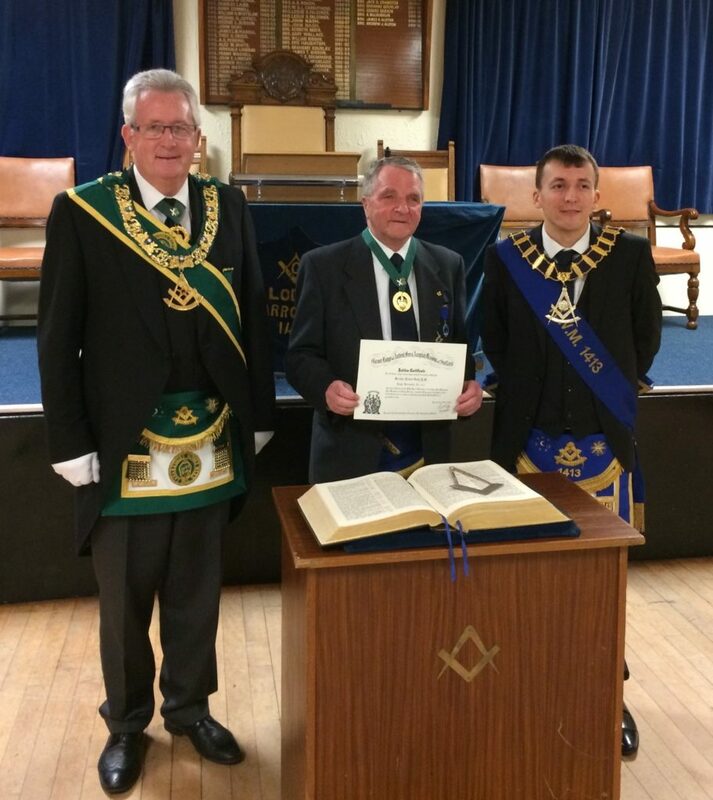 Stoddart’s service to the Lodge and to the Craft and together with the PGM presented Bro. Stoddart with the Diploma. Bro. Stoddart thanked the RWM and the Brethren of the Lodge for the presentation and for the kind words given on his behalf and also thanked the members of No. 7 and the visitors, for the many friends made during the past 60 years. Following the presentation, Bro. David McDonald RWM of Lodge Robert King Stewart No. 919 and the Brethren of his Lodge conferred an excellent exemplification of the EA Degree. The Brethren then retired an enjoyed some Hamilton Kilwinning hospitality. A nice start to New Year for some deserving charities from Lodge Robert Burns No. 440. 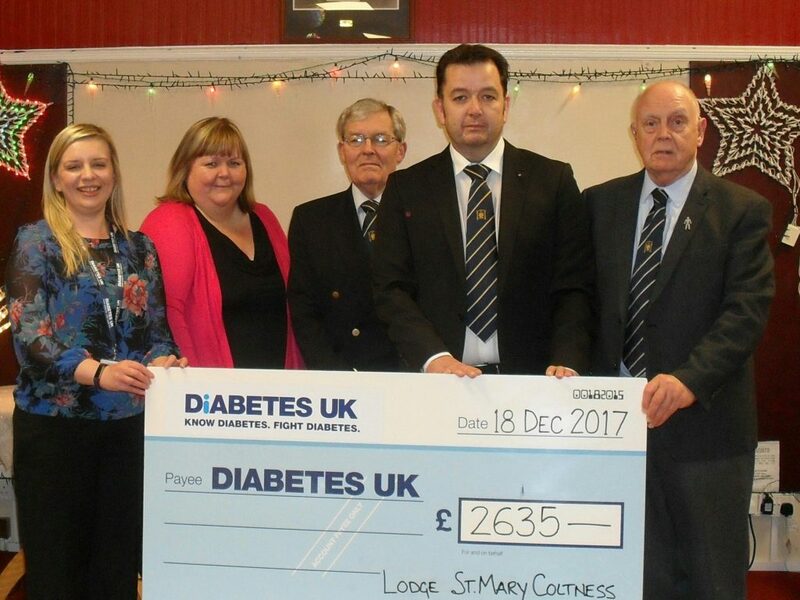 The Lodge presented the following cheques from funds raised in 2016. 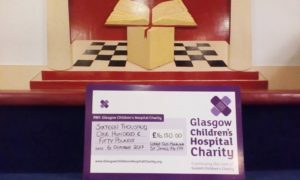 The Gladiator Program £2200, Erskine Hospital £100, Malawi £100, St Andrews Church £100 & RMNN £50. Well done to all the Brethern and their families on generating these funds throughout the year. Bro. Bill Perry PGM, accompanied by Bro. Tom Davidson IPPGM, Bro. Norman Carnegy SPGM, Bro. Angus Ross SPGM and Bro. William Craig PG Secretary, attended Lodge Dura No. 1513 and were given a warm welcome from Bro. Alan Graham RWM and the Brethren of Lodge Dura. 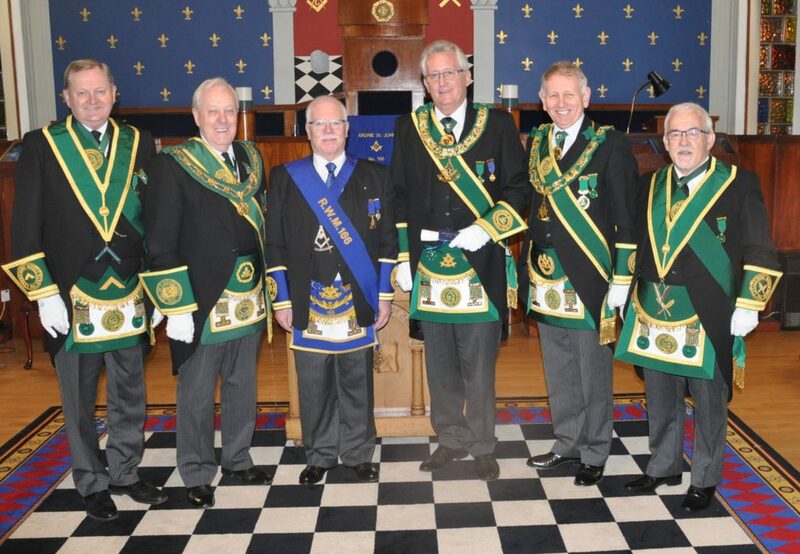 The visit from PGL, was to witness the Lodge confer Distinguished Membership on Bro. Jim Kerr PM. Bro. Martin Halliday IPM, who made the presentation, gave the assembled Brethren a comprehensive history of Bro. 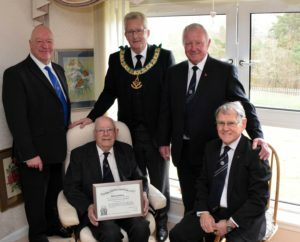 Kerr’s service and commitment to the Lodge since joining in 1975. Bro. Kerr in his reply thanked the Lodge for this unexpected honour and thanked Bro. Halliday for his kind sentiments. Following the presentation, the RWM and Lodge Office Bearers conferred an excellent exemplification of the FC Degree. The Brethren then retired to enjoy 1513 hospitality.